Pat Donnellan it was donated by Bo Collins of Dream Maker Leather Works. Last night I started to receive text on my phone about the weather and impending snow storm? Cabin Fever is On! 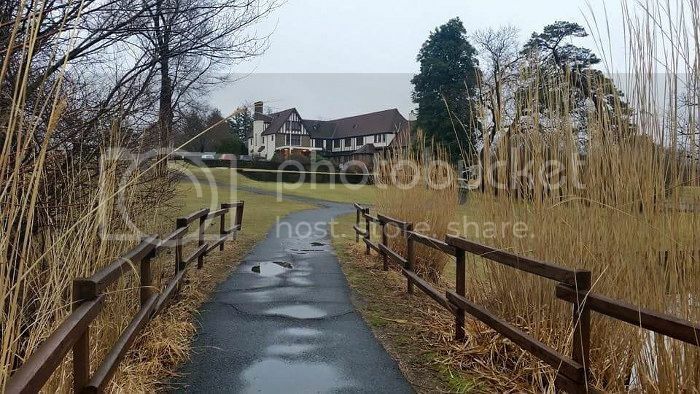 Not one snowflake fell last night and this morning at Black Knight in Jackson NJ Flatlander Country. 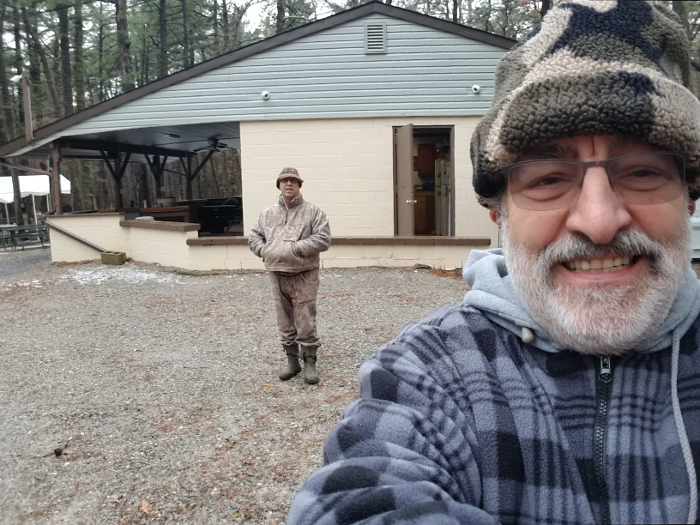 On Sunday it will not start snowing until very late in the afternoon around 5 p.m. by then we will all be home getting ready to sit down to warm Sunday supper. 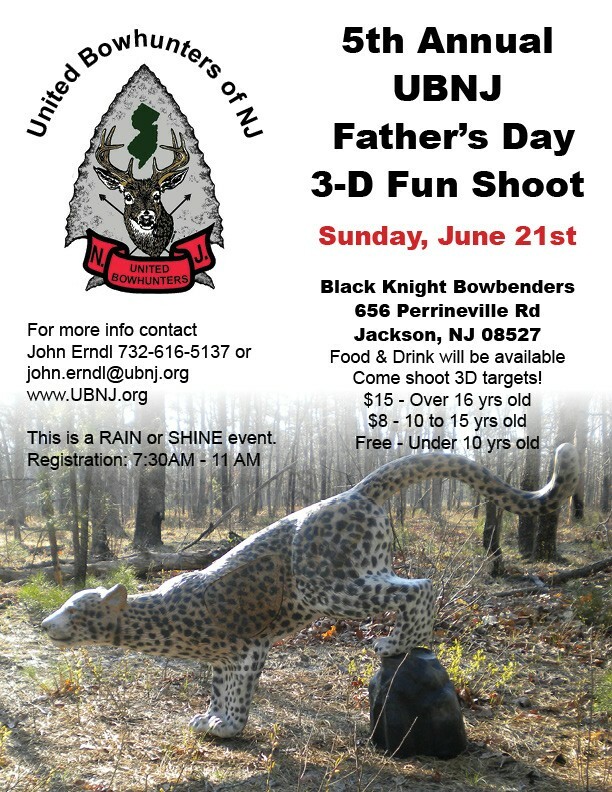 Both BKB and TANJ 3D set up crew cant wait, we are all set to go! 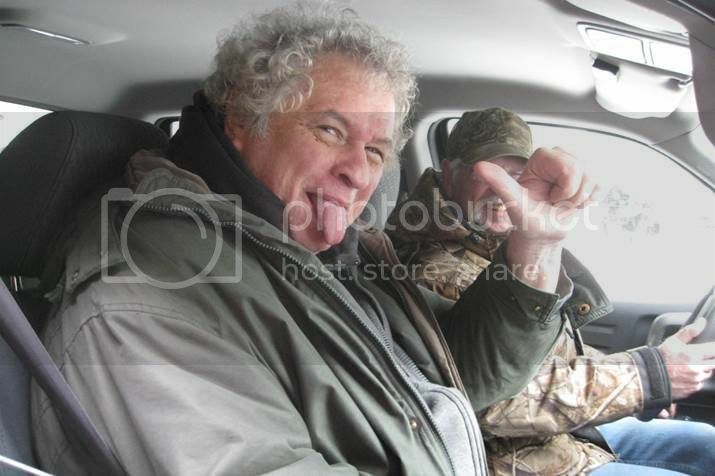 The only reason we can"t see why you will not make it to the shoot is that you did not want to get out a bed! SO DON'T BE SCARED !! 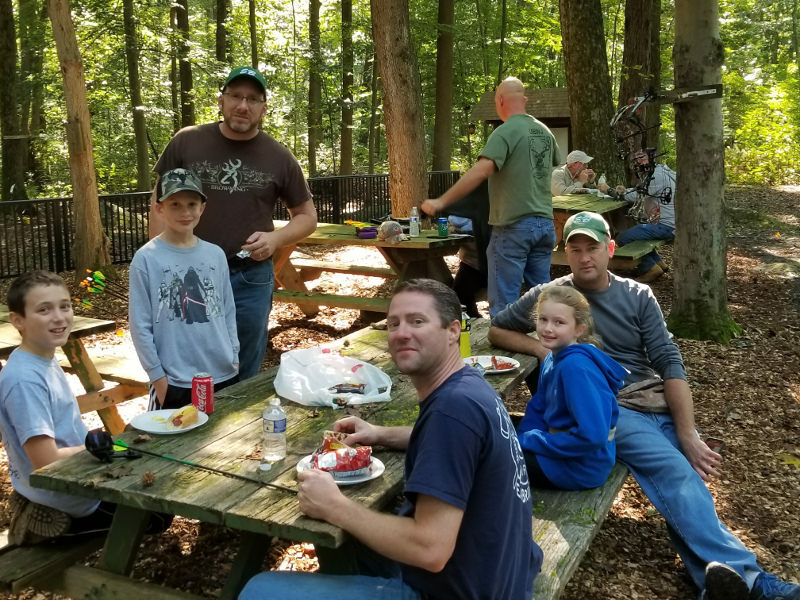 We just want you to be careful on our tree stand steps and on Range A walking down some hills since some wood may be slippery we appreciate and take your time. This is a fun shoot! NO fresh snow as you can see! 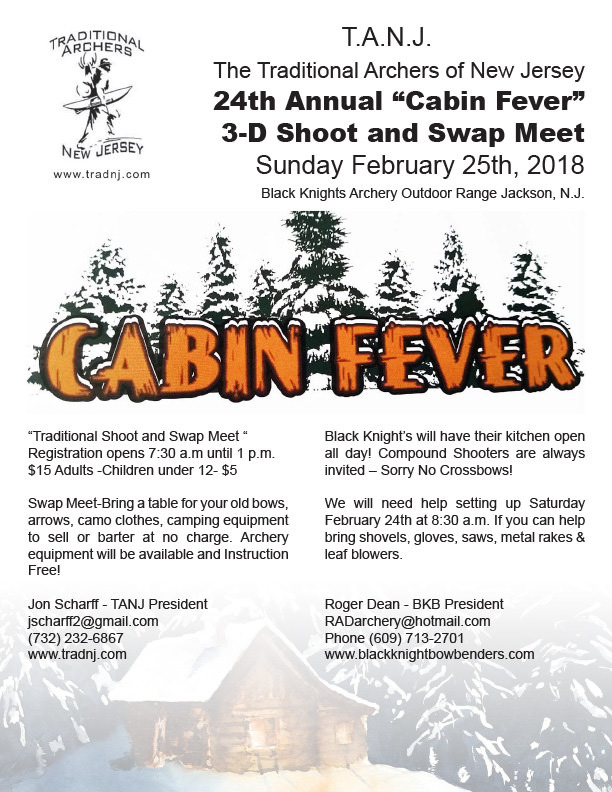 The TANJ Cabin Fever Shoot (open to everyone) was scheduled for this Sunday but has been re-scheduled to next Sunday, March 3, 2019, due to the forecast of heavy rain and strong winds. 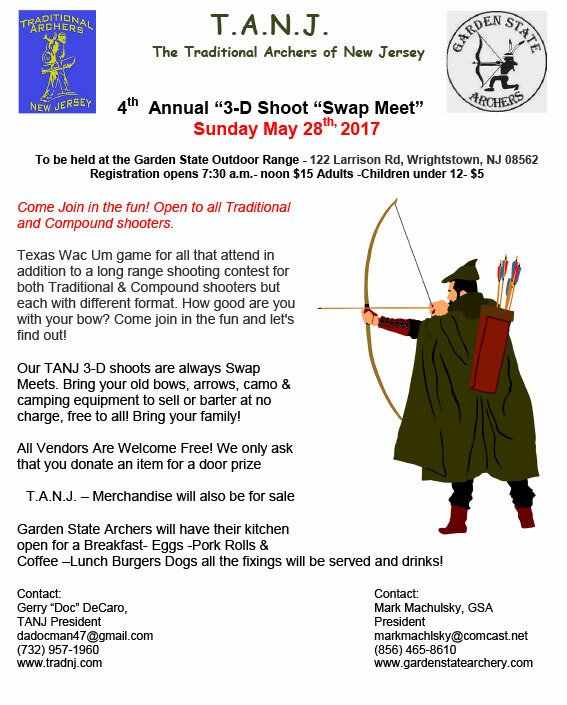 We will need help on that Saturday March 2nd on setting up the 3D range with the animals. 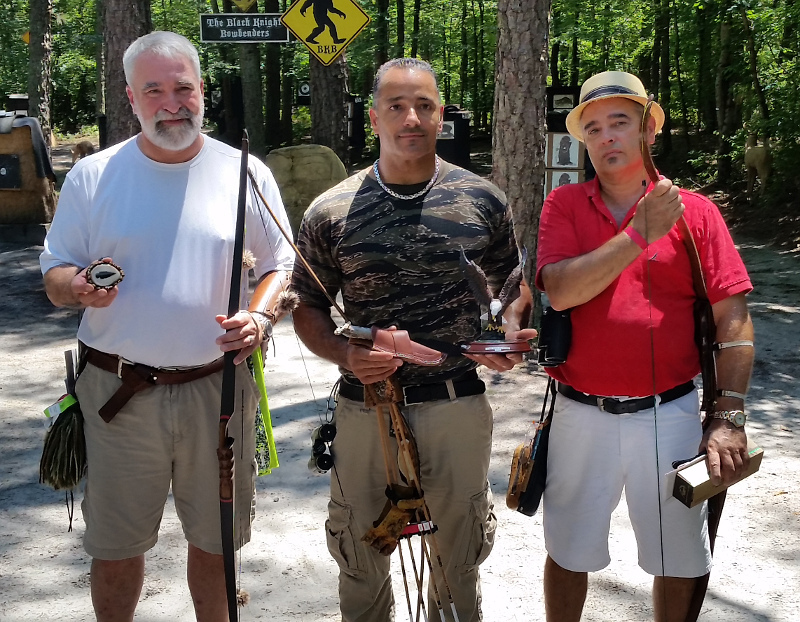 "It is always a great event and if you have never been to this range you are in for a treat." 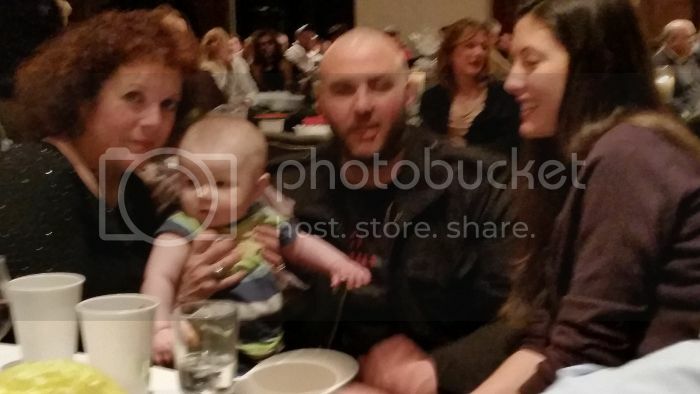 Cassandra - another TANJ member circa November 2018. 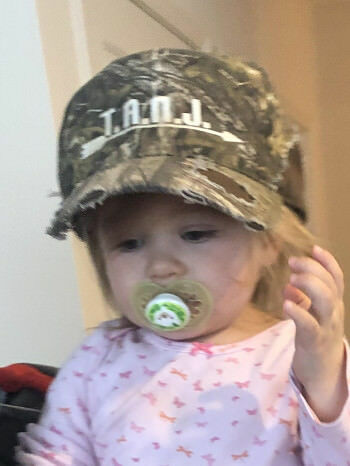 Sent in by her proud Grandpa Sal, who is a loyal TANJ member. 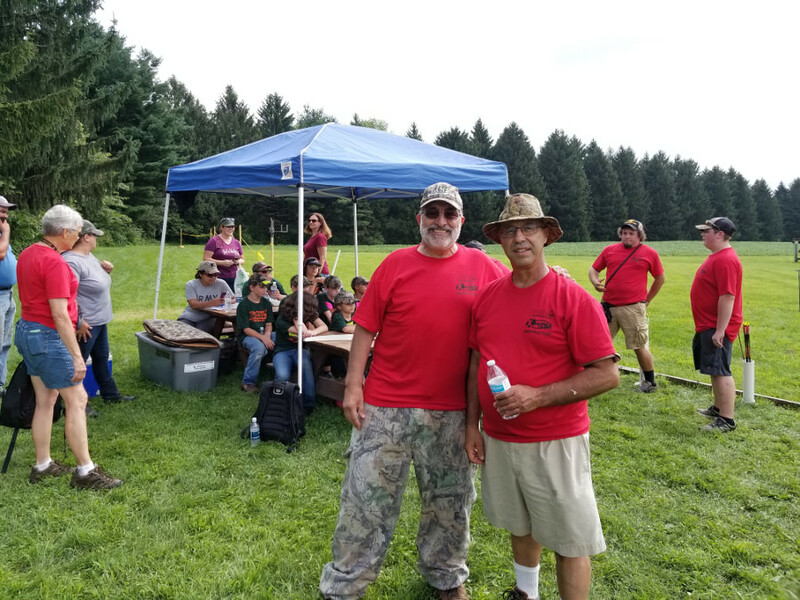 On Saturday August 4th 2018, TANJ council members Rich Lopez and Shoot Coordinator Gerry DeCaro taught the art of archery during the Jerry Zimmerman NWTF Chapter of their annual JAKES Youth Day. 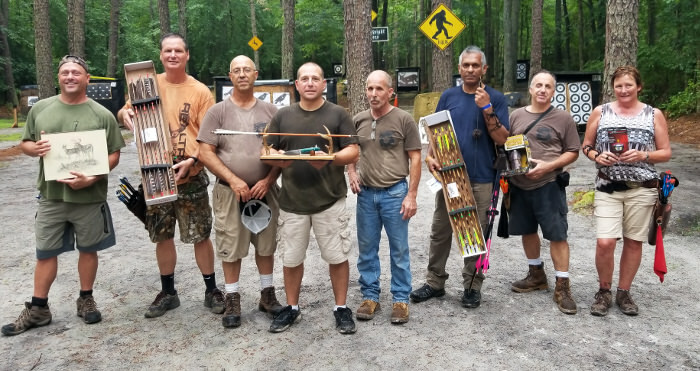 Sunday July 15,2018 at the 24th Annual Big Foot TANJ held our 22nd Annual Last Man Standing Traditional Event.Even though it was a overcast very rainy day everyone wanted to compete and enjoyed themselves .What a great day it turned out to be. 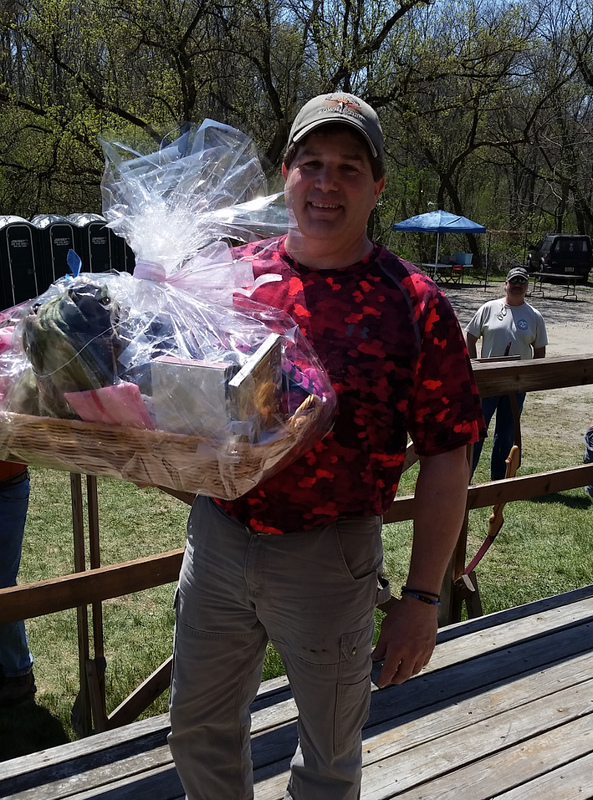 We like to thank TANJ members Lance Blake of Taylor Fence and Horace Eckman for their kind monetary donations that was awarded to the top 3 winners again this year. 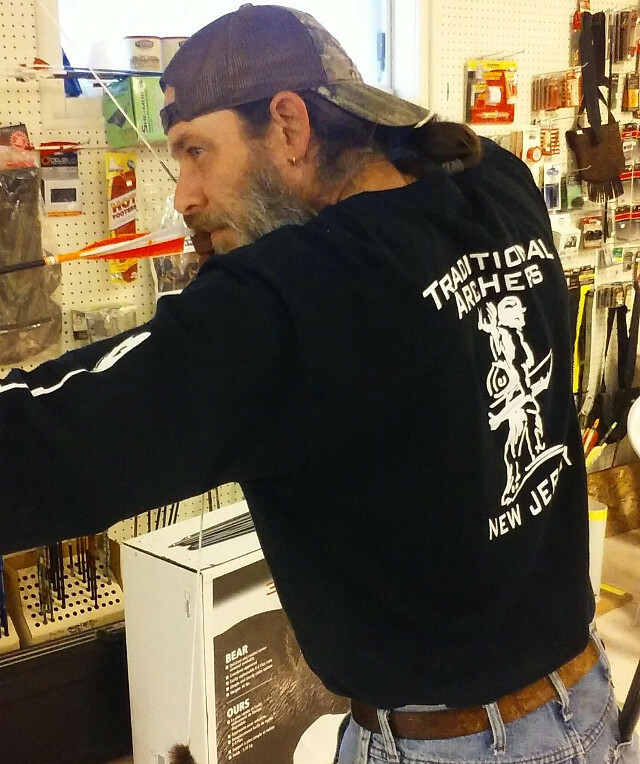 The Traditional Archers of NJ wanted something very special for the 2018 Last Man Standing so they sought out master knife artisan Dylan McRae megaugy@gmail.com 856-266-5484 and Warpath Archery www.etsy.com/shop/WarpathArchery to team up on creating an amazing piece of art. 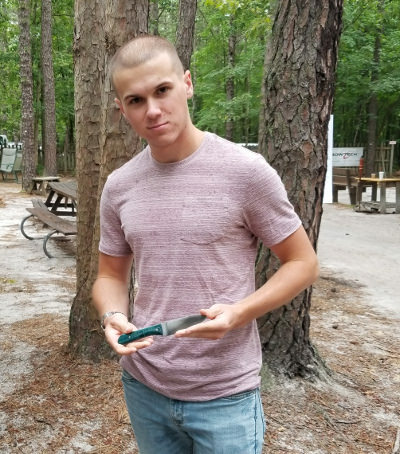 The LMS knife was meticulously hand crafted by Dylan McRae from differentially tempered 1085 steel. The grip is green tiger maple and feels like part of your hand. 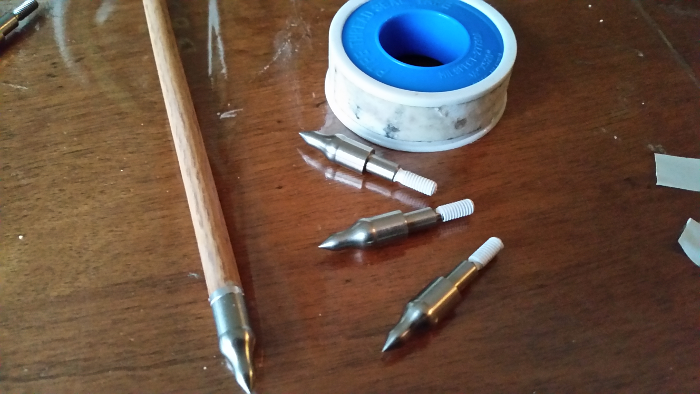 The custom cedar arrow by Warpath Archery is fletched with wild turkey feathers and the razor-sharp flint arrow head is precision mounted with pine pitch glue and wrapped in whitetail backstrap sinew. This 145 gr. arrow totally is functional with a 60-65# spine. 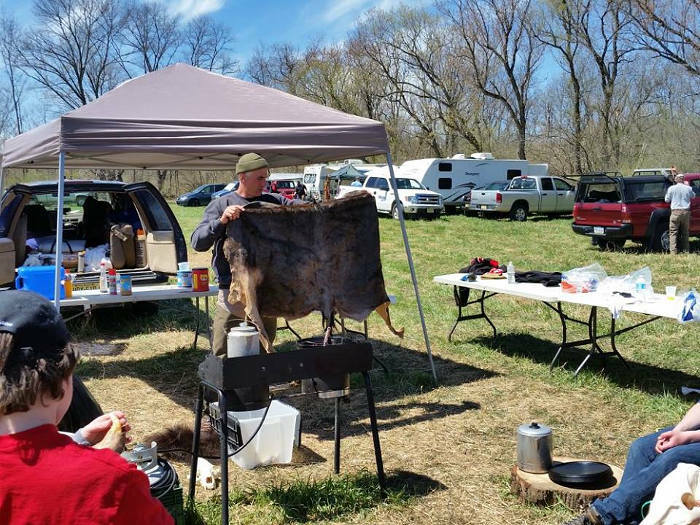 The stand features whitetail antler mounted on a piece of pignut hickory. The prop is wild almond burl. The sheath, finished in snakeskin, lays perfectly flat on your hip. 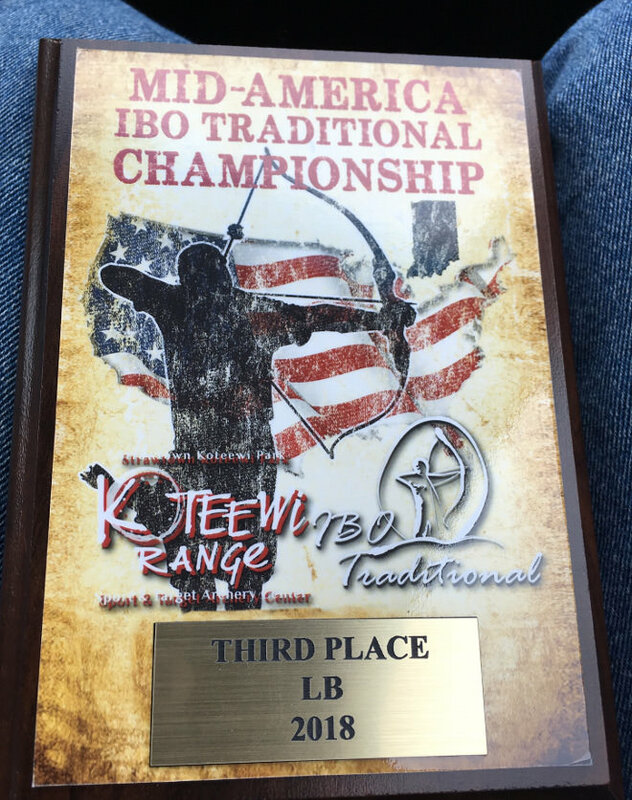 New TANJ Council member Rich Lopez took third place in the IBO Long Bow Division. 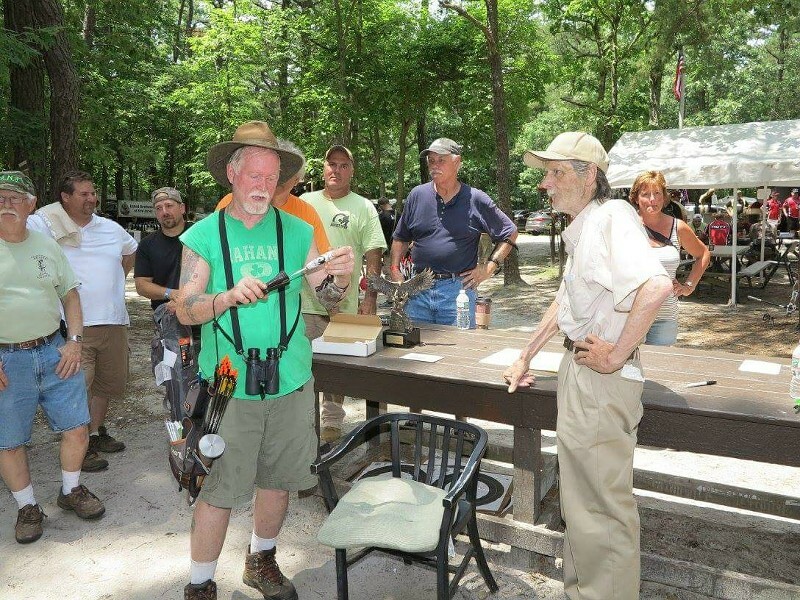 He was paired and shot with many IBO Champions. 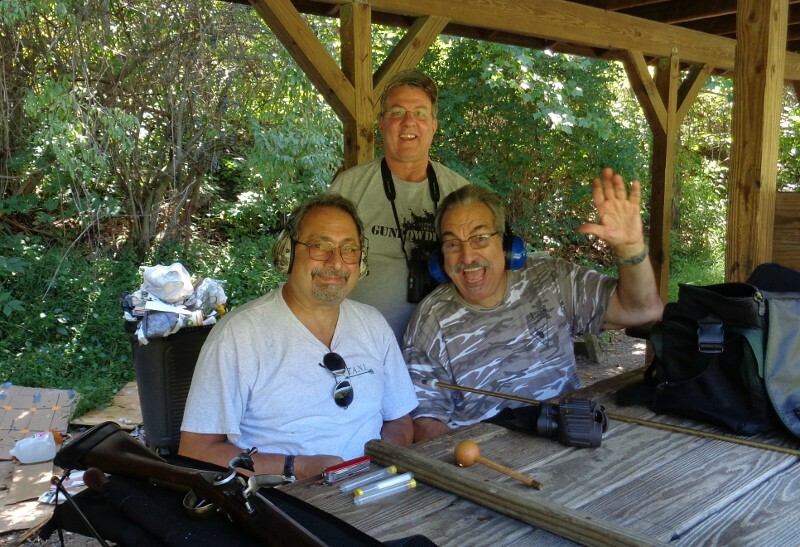 They almost shot perfect scores - not in their league yet, but placing third is not at all bad for the first time! Rich, we tip our back quiver to you! We have been watching the weather and this past Tuesday and Wednesday the weather channel programs stated severe rainstorms over this weekend especially this Sunday. Are they ever right, but we needed to make a decision before it was too late to cancel and get the word out. We know everyone always came out in the snow but when it comes to severe rain as we all know our feathers & quivers and rain just not a good mix. So we made a decision to change the date until next Sunday March 4th since it was open on the BKB calendar and TANJ also. 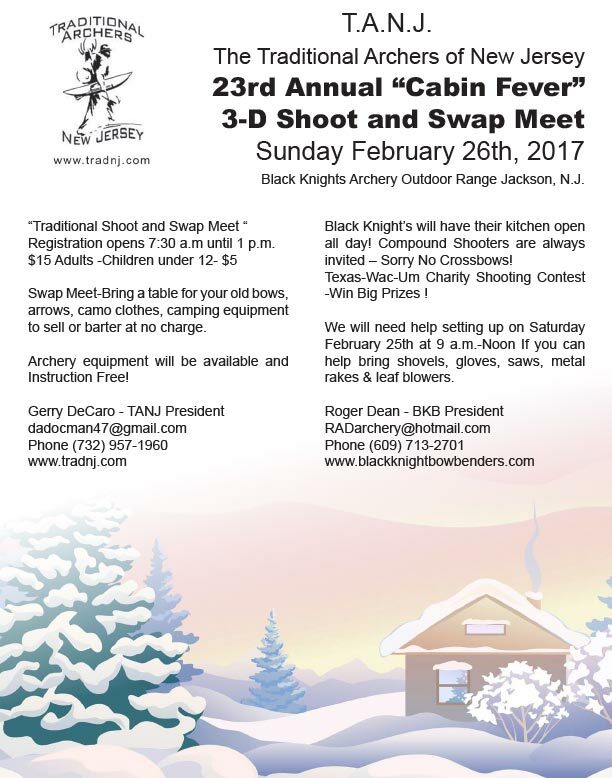 In the past 23 years we have never ever cancelled a Cabin Fever event,even when it snowed a few feet but this is the1st time because they are calling for rain and not snow. 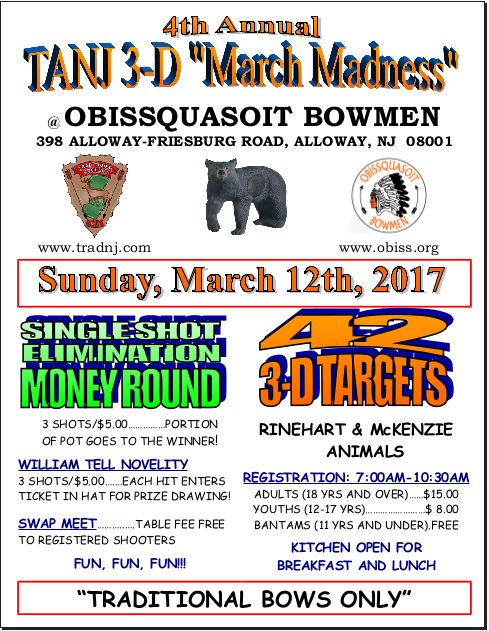 We hope to see everyone next weekend and we need help on Saturday March 3rd setting up the 3-D targets 8:30 a.m.10 a.m. 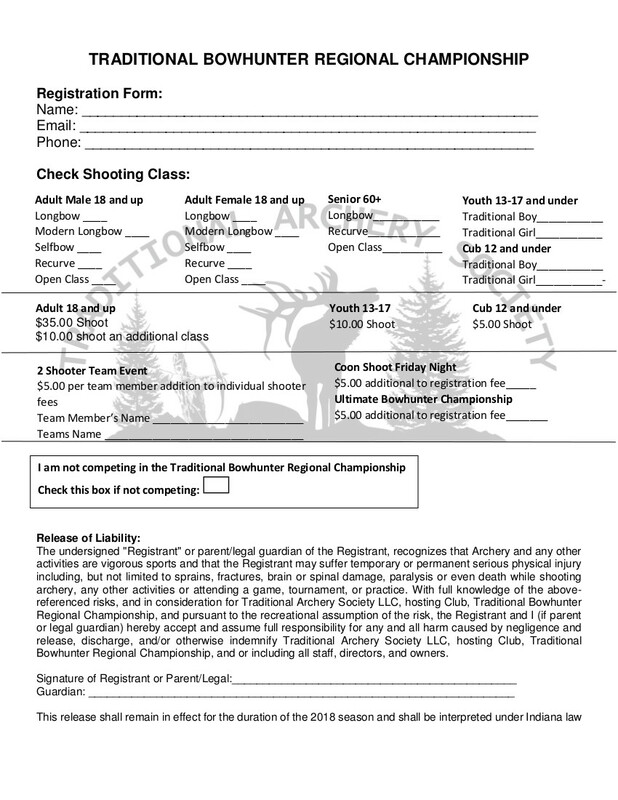 So when you arrive next Sunday and register and sign the 2018 BKB insurance waiver take a minute to your purchase a shirt because after they are sold out we will not be reordering until next year. 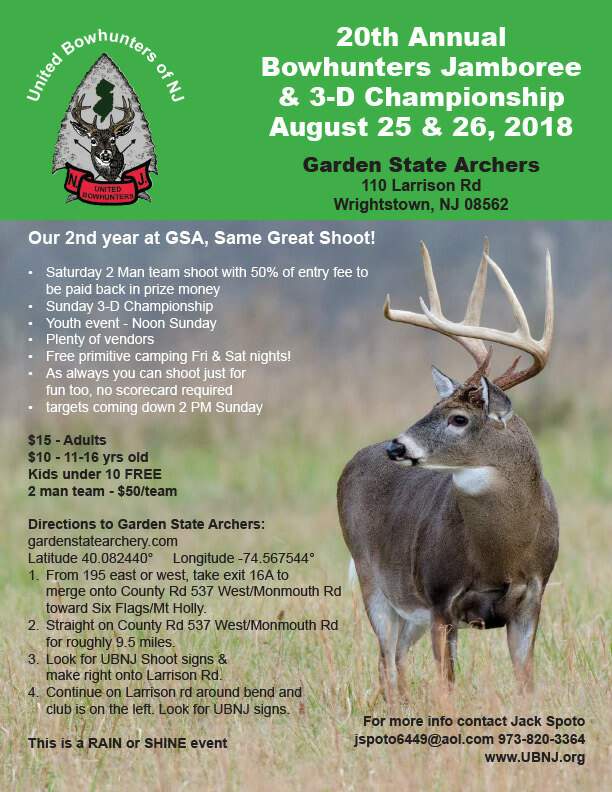 2018 Trad Archery Shoots & Events - check it out! 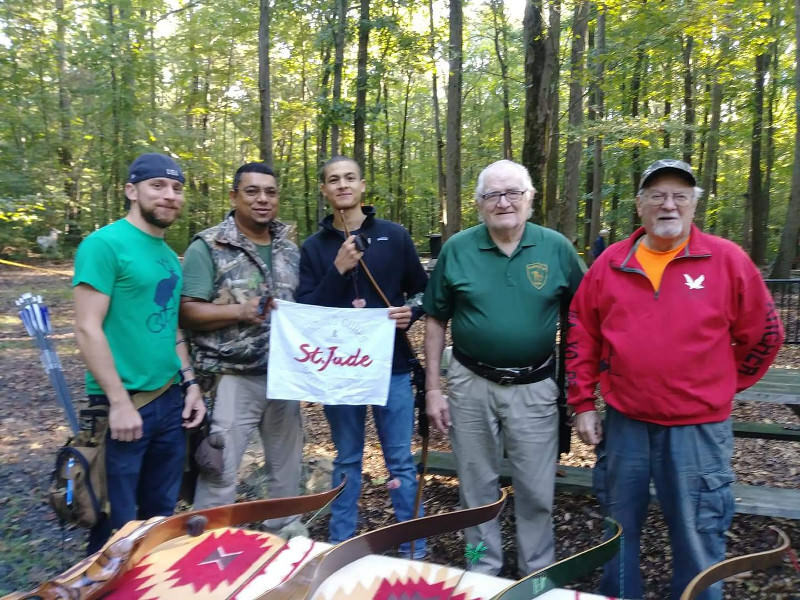 TANJ & WaXoBe senior member Pierre shot an incredible 1000+ score to take 1st place Barebow championship at Bloomfield NFAA tournament over the last past weekend . 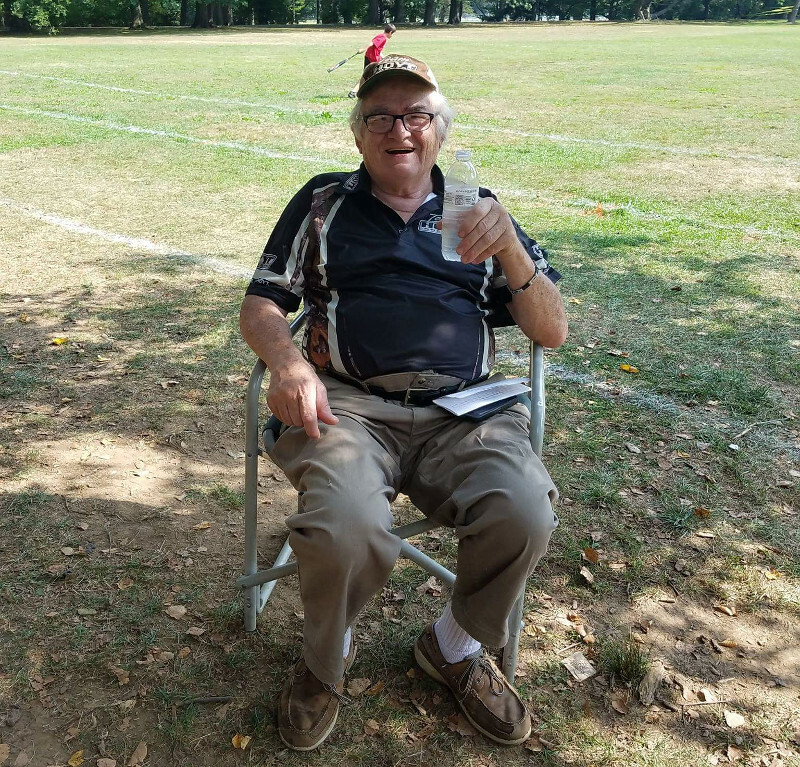 Here is our hero caught taking a break from the hot weather over the two days. 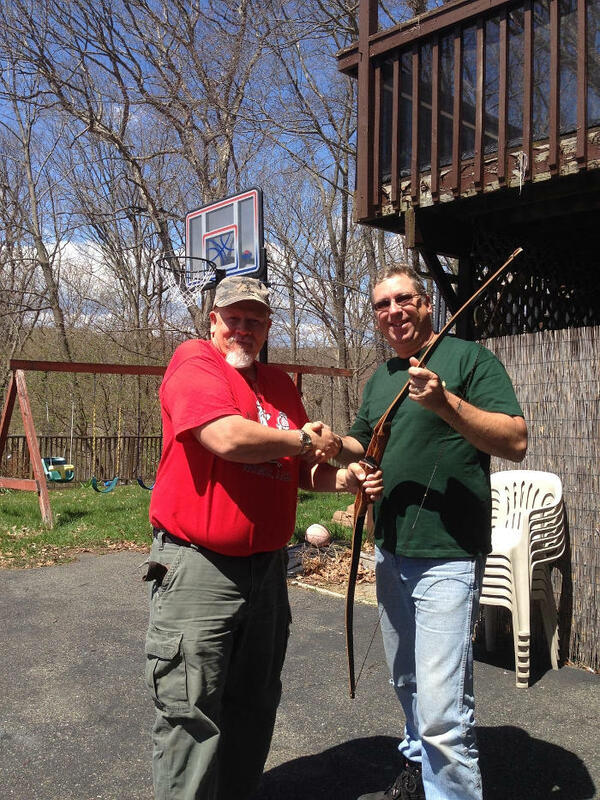 Back in the 60's he helped me get hooked on Traditional archery and was a AA class shooter back then when we were members of Comanche Bowmen, Brooklyn N.Y. and until this day still a great traditional archer - no sights just pure instinctive and still helping to mentor many of our youth. 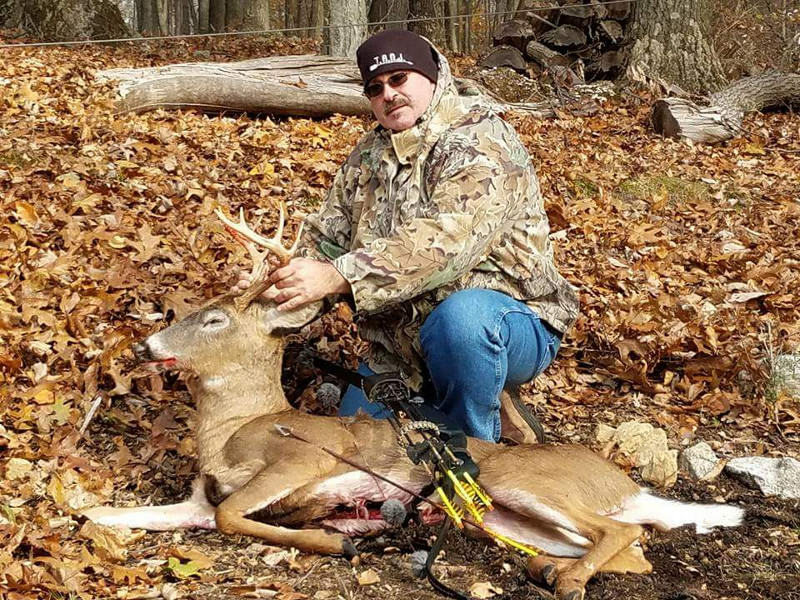 TANJ member Capt Jack Fleischmann killed an 8 point buck on 10/11/16 with a 1973 Browning Wasp 45#, 3 Rivers Archery Traditional Only Shaft tipped with a 125gr Magnus Stinger Buzzcut broadhead, all at a distance of only 8 yards from a 15 foot treestand! Congrats Capt!!! These would make great Christmas gifts and or stocking stuffers for you, your family and friends. Just email me or contact me. 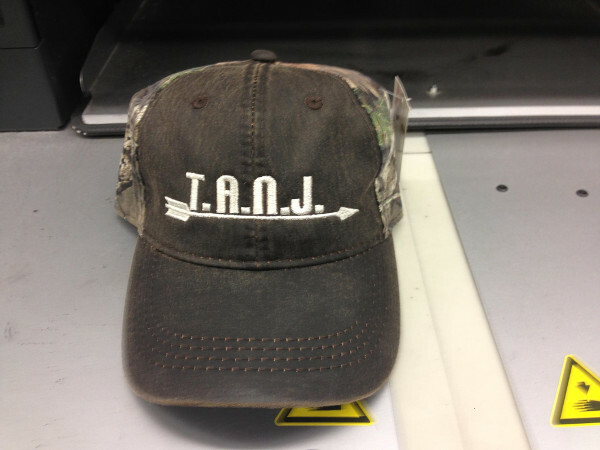 (see below)TANJ merchandise cannot be bought on our website or payment of dues! 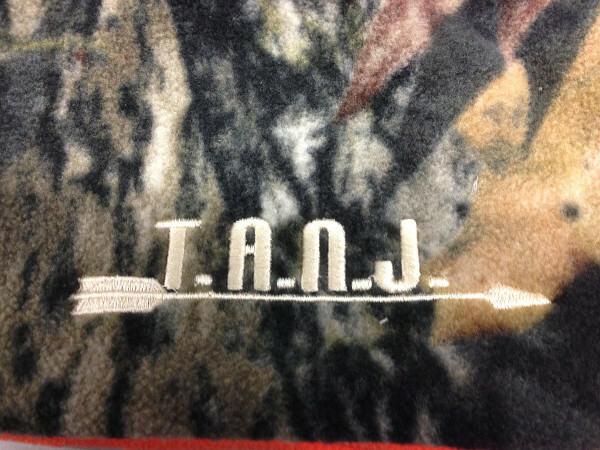 TANJ Custom Wraps - $12 free shipping ! 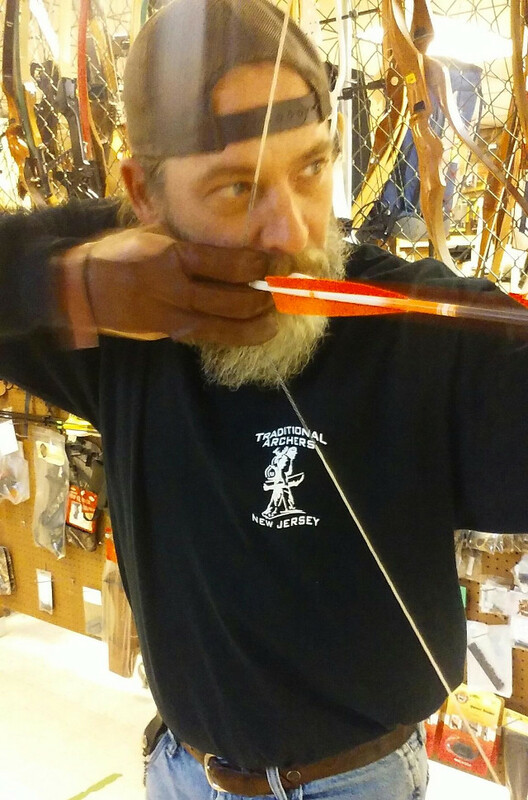 62 " Raptor signature longbow 45# at 28 inches. 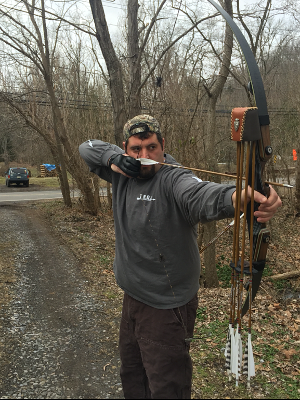 Joe shoots with tab split finger, 1816 aluminum arrows tipped with 150 grain Grizzly Broadhead. 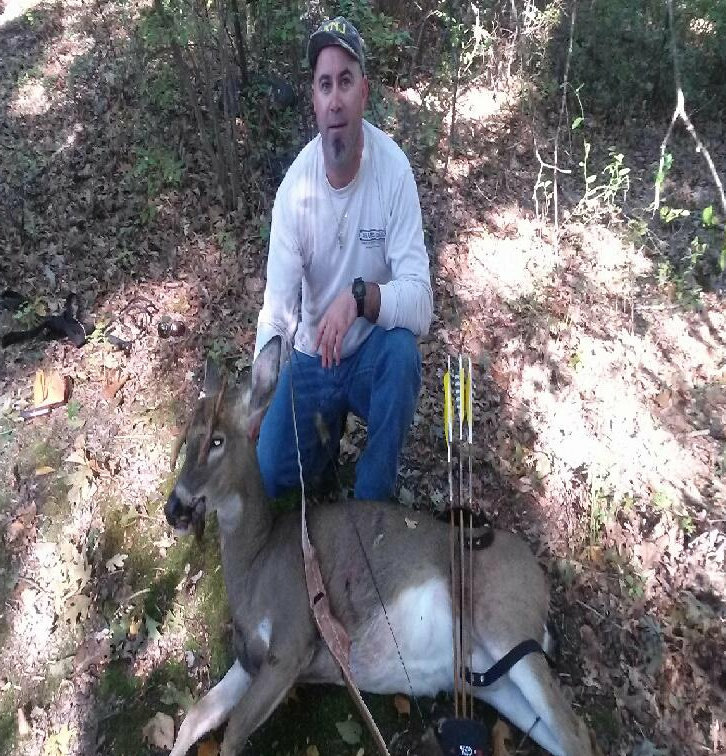 12 yard shot perfect broadside from a treestand Joe told me it really pays to take the time and bare shaft tune. That arrow went right through both lungs and did not go far. He going home and making his first Deer Heart Dinner! 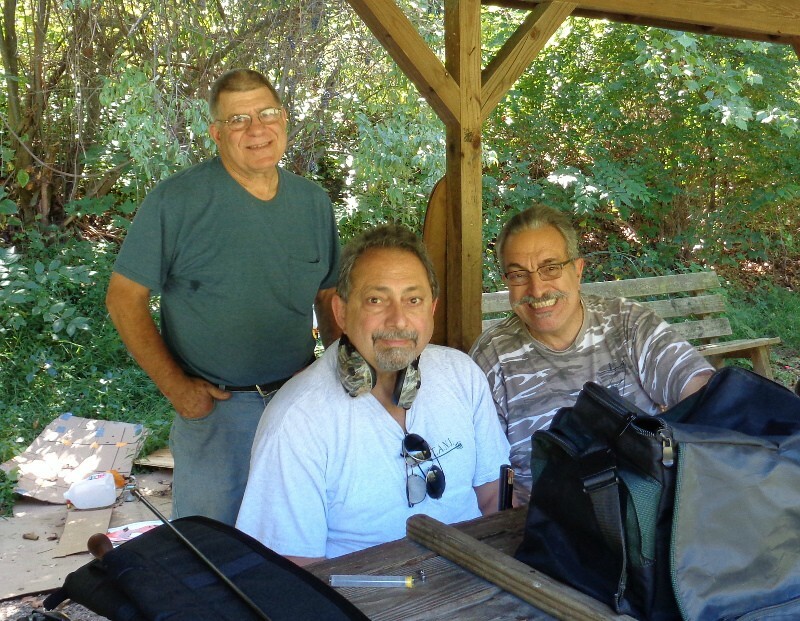 My brother Frank DeCaro passed away Sunday Oct 9th after a courageous battle with cancer. He was a Navy Veteran and retired NYC Police Officer. 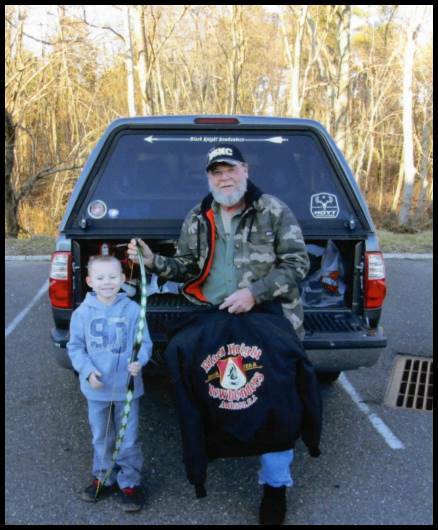 He was so proud as a Veteran and serving his country during the Vietnam Era and serving the people of the City of New York. He also worked after the WTC 9/11 bombing, helping with the clean up, as many retired officers did. 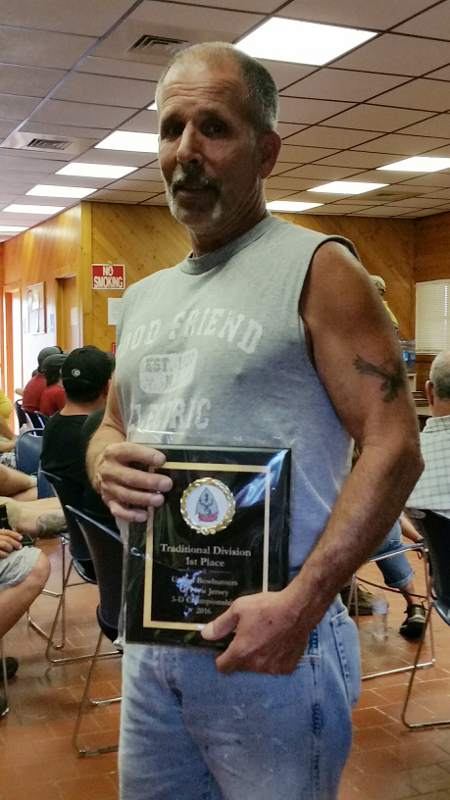 and no other love like a love from a brother"
1st Place Traditional TANJ & BKB member Joe Yost. 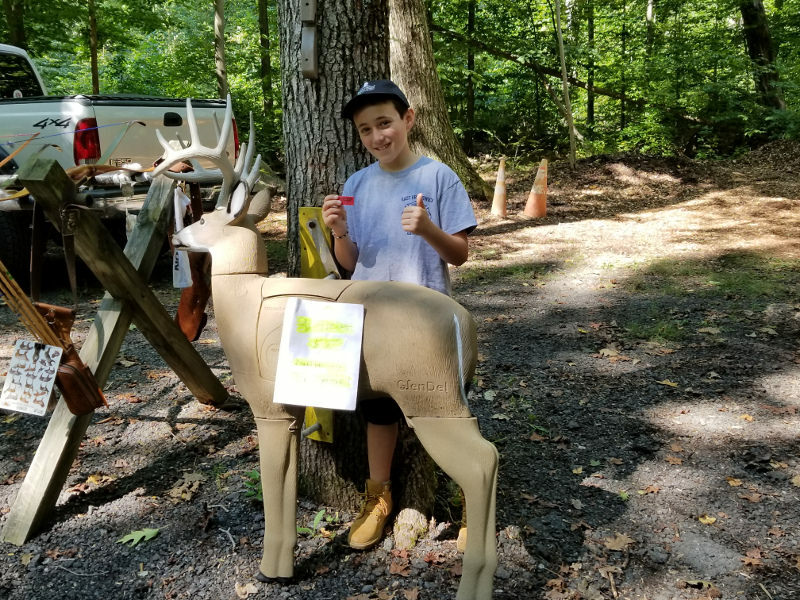 He amazingly just started 5 months ago and shoots at least 5 days a week since then - rain, shine even during the last few weeks in that extreme heat at the Black Knight Range. 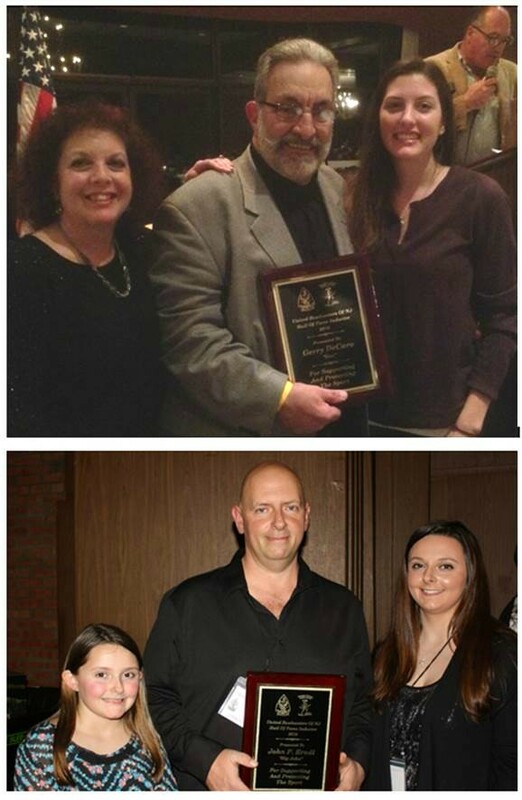 We are so proud of Joe! T.A.N.J. 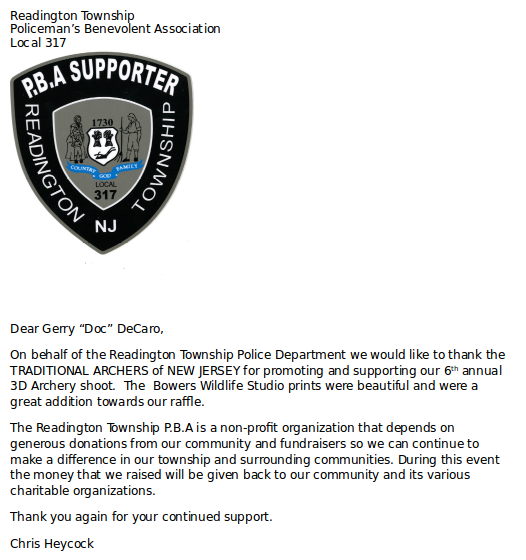 made a donation to the Readington TWP PBA 317 at their 4th Annual 3-D event. 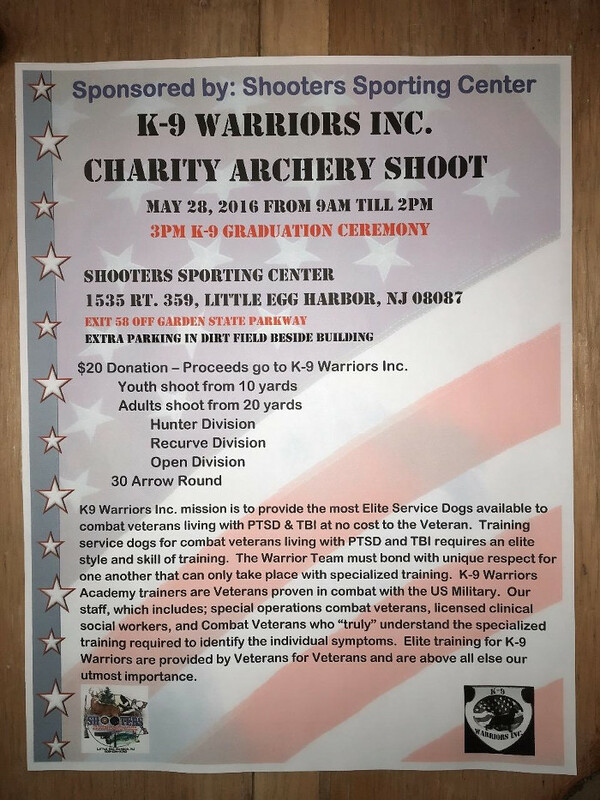 It was held at Pickell Park, Whitehouse Station, NJ. 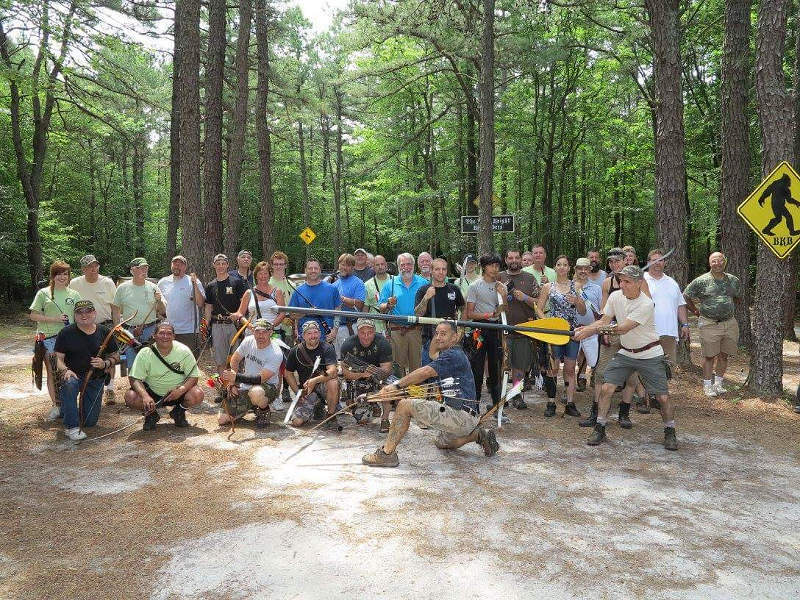 What a great group running the event with Traditional and Compound stakes a numerous 3-D animals spread over acres of land, one outstanding event. 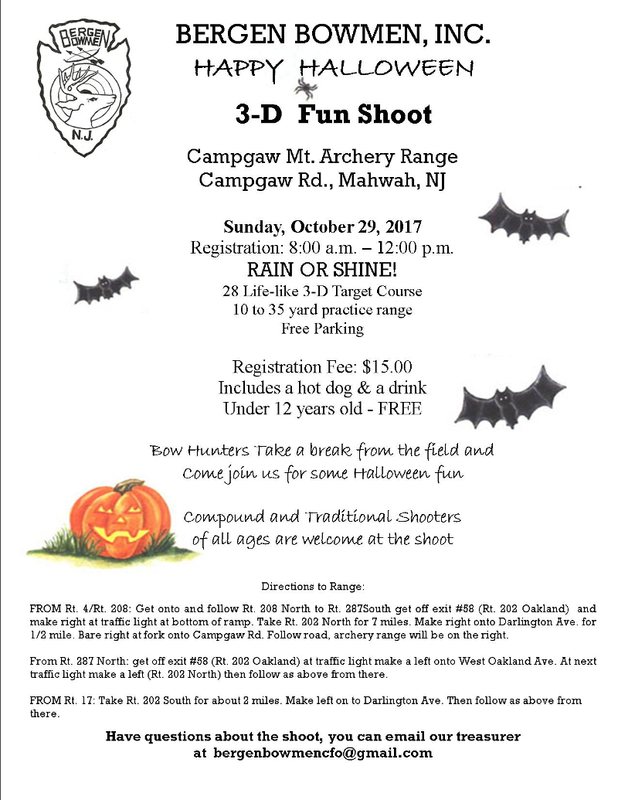 The PBA 317 offers one of the best 3-D souvenir t-shirts of any event in N.J. with an outsanding lunch and souvenir giveaways included all in the registration fee. 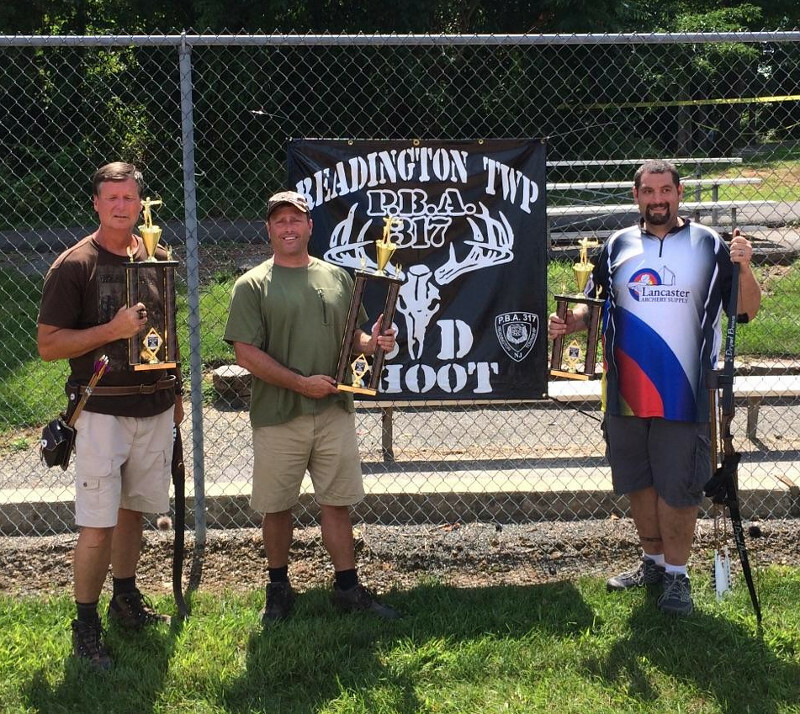 Saturday during their trohpy shoot 3 TANJ members took home the gold and trophies for 1st, 2nd & 3rd place in the Traditional class. TANJ supports our PBA "Brothers and Sisters in Blue". God Bless Them All. 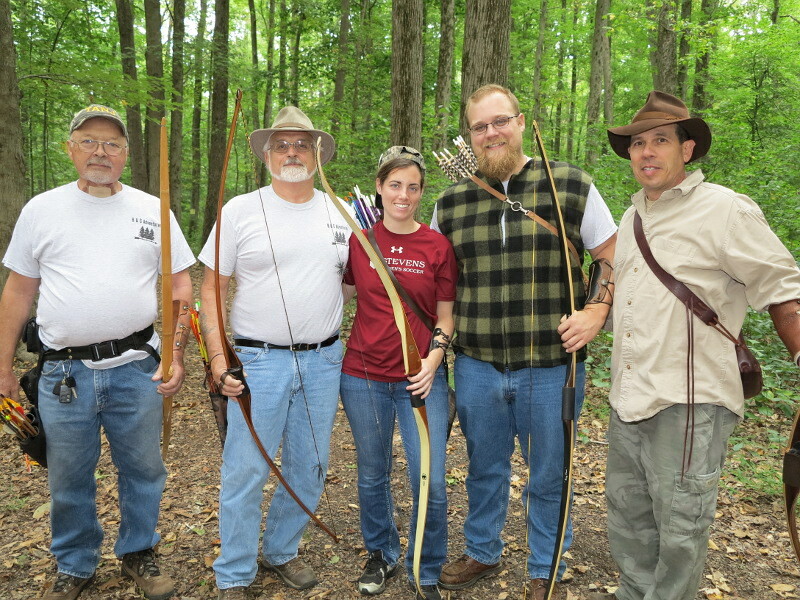 "The Spartans of the Stickbow Crew "
This year I'm the meet director for the Tri-State Wheelchair and Ambulatory Games. We are in need of volunteers to help at the games. The games will take place at Pascack Valley High School in Hillsdale, NJ and will be held Memorial Day Weekend, May 27 - 29, 2016. All volunteers must be at least 15 years old. Please spread the word about this volunteering opportunity. Volunteers don't need to know the rules to do any of the volunteer jobs. 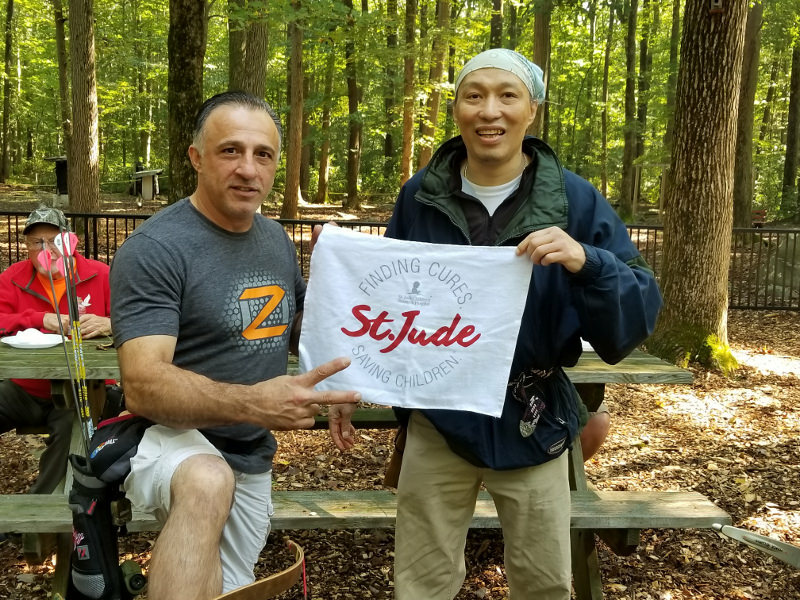 Volunteers will gain an appreciation for the diversity of each athlete and the unique abilities they contribute to the games. We are in need of additional volunteers for the following time slots on Saturday, May 28. 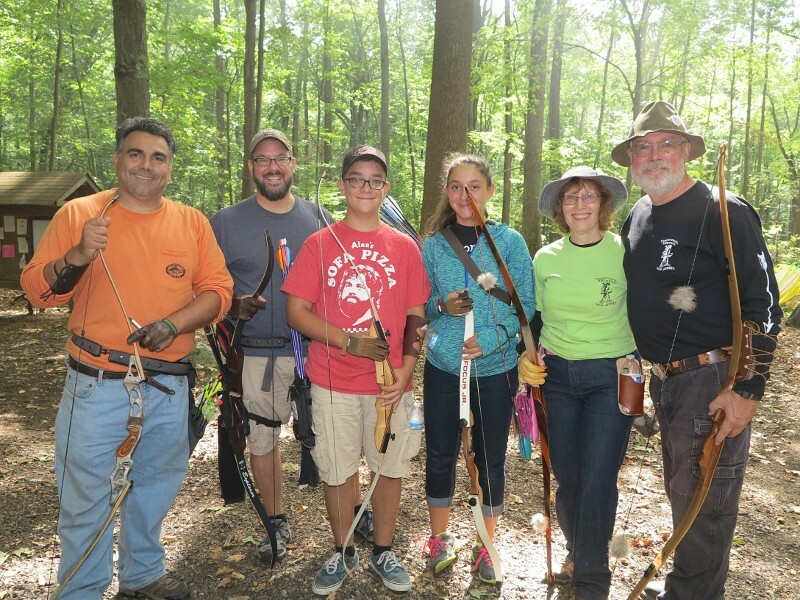 Field Pit Assistants: Volunteers will retrieve implements, assist with measuring, and mark where the implements landed. 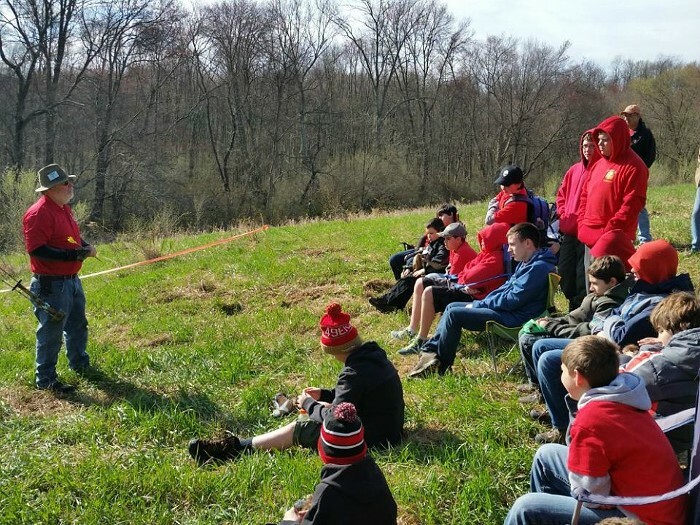 Volunteers do not need prior experience. There will be a certified official to run the field pit and make any needed official calls. Runners: Posting results immediately following the completion of a race. Deliver infraction sheets from corner officials on the track to the finish line. 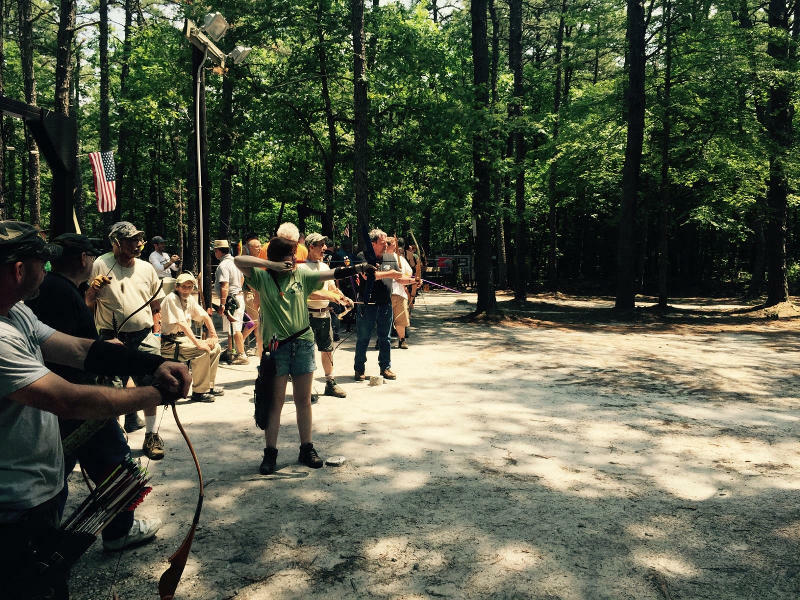 Archery: Will retrieve arrows between rounds and score points. 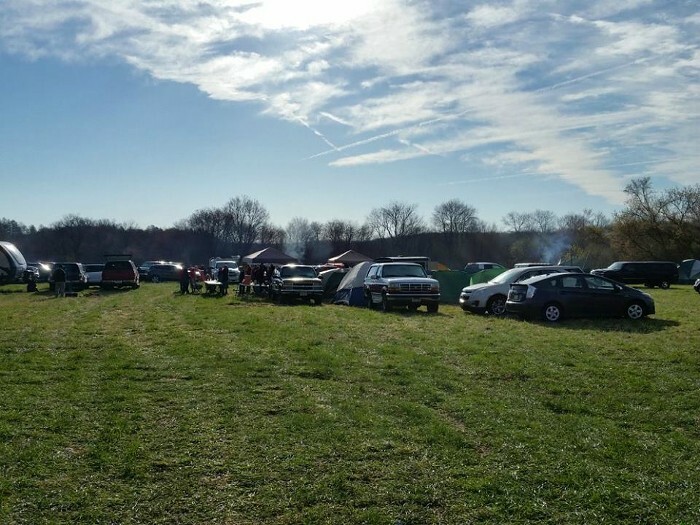 Pickers Finish Line: In the long distance events, each person will be assigned to an athlete. They keep track of how many laps they have done and let the bell ringer and the athlete know. In the shorter distance races, they keep track of the order in which athletes crossed the line. Please let me know (at 551.655.4176 or email to jcuevas1969@comcast.net) your desired time slot. 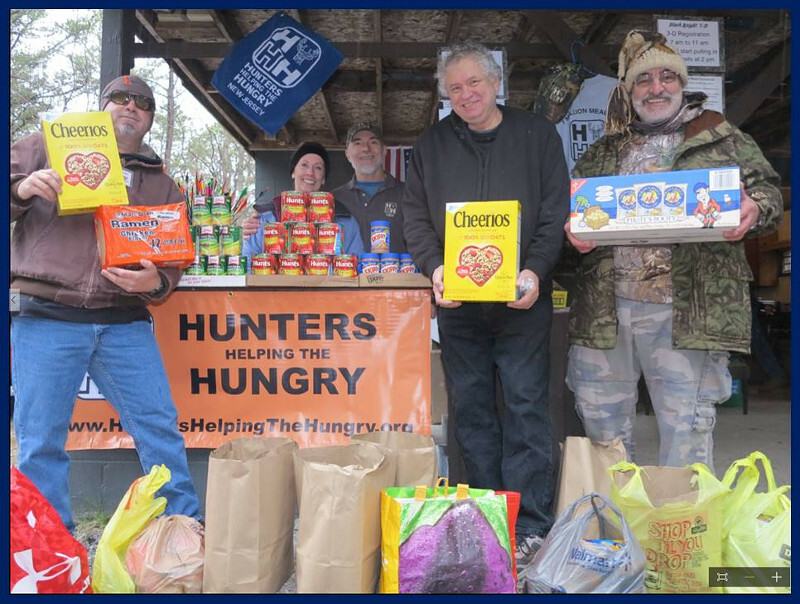 If you are able to recruit volunteers please email their contact information or have them reach out to me to ensure the desired times slots are assigned properly and confirmed. As usual, your support will be greatly appreciated!! 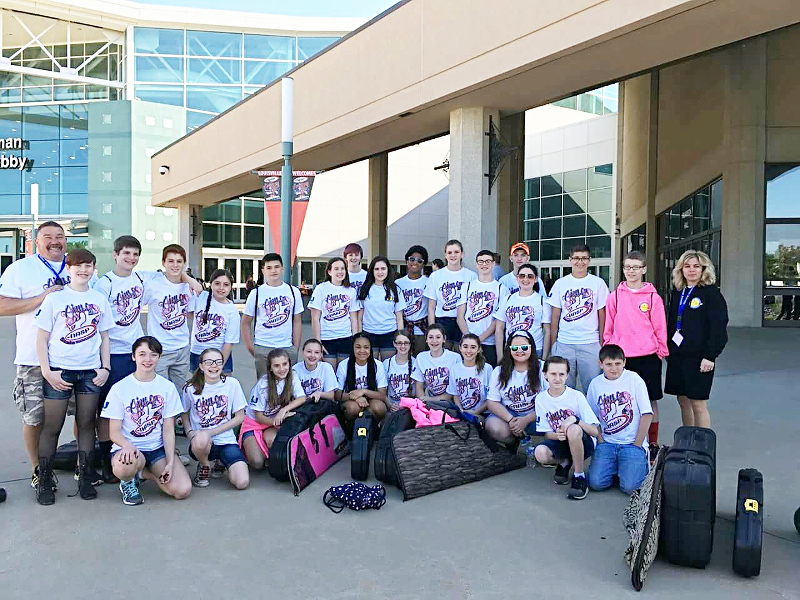 Coach Rob Causton and his Championship Oxford Central Middle School NASP Archery team outside the National Archery in the Schools Championship Event in Kentucky May 2016. 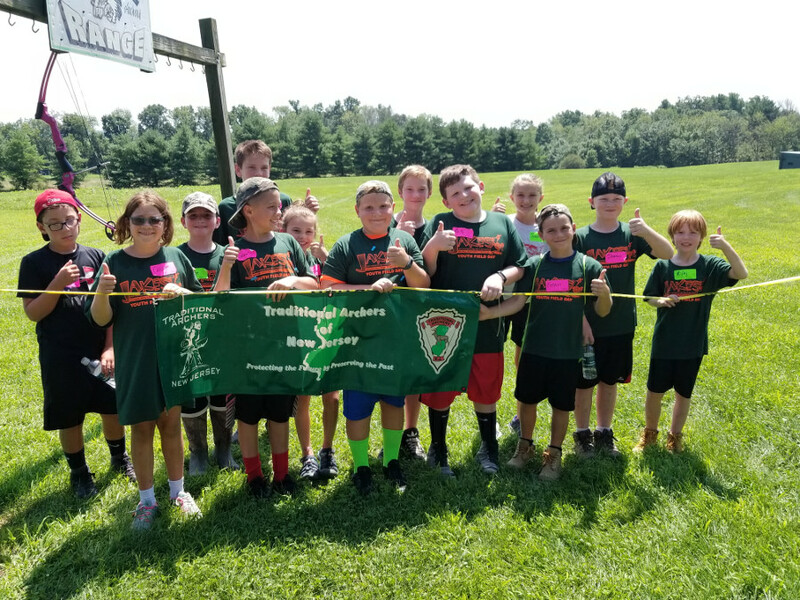 The Traditional Archers of N.J. and the United Bowhunters of N.J. have proudly sponsored this Oxford NASP Team since 2002. 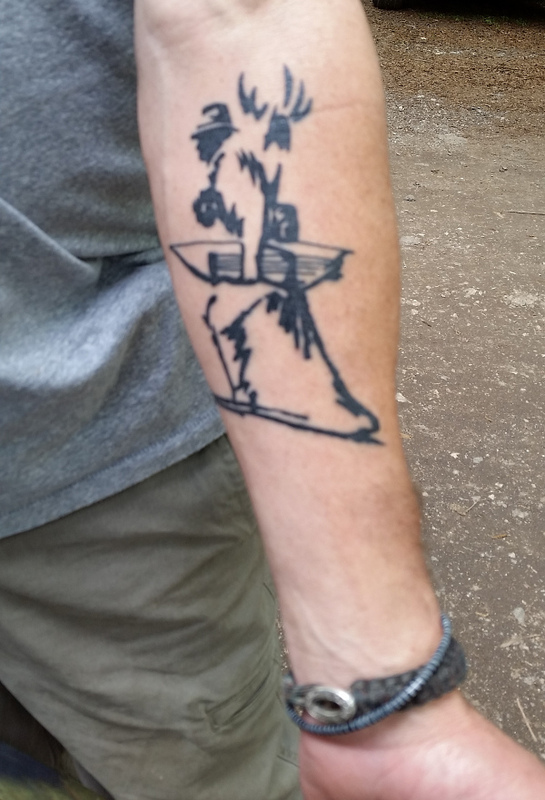 Bill Davison sports his new TANJ logo tattoo! wow! 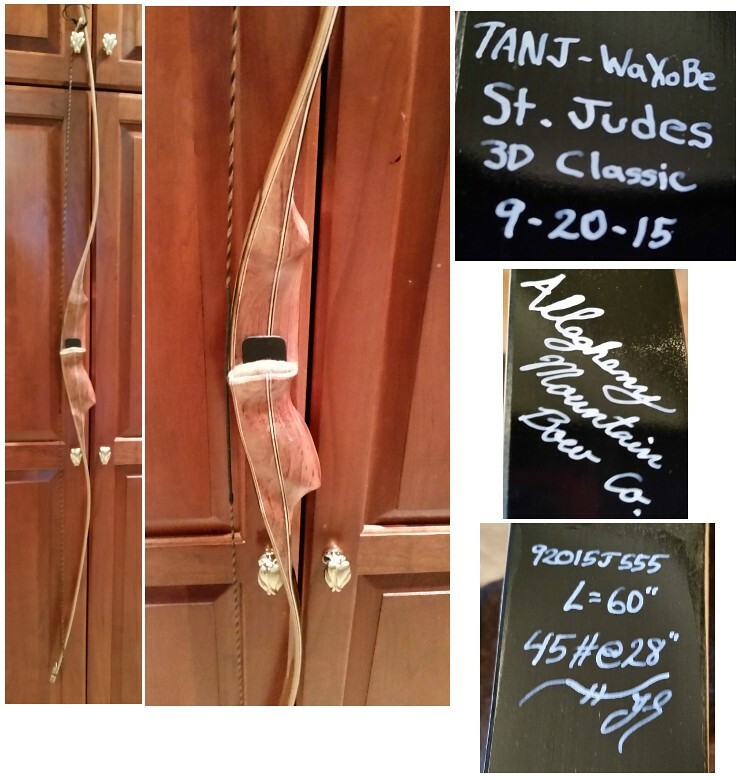 TANJ Council member Santo Armano donated a bow to Jadynn at Whittingham . 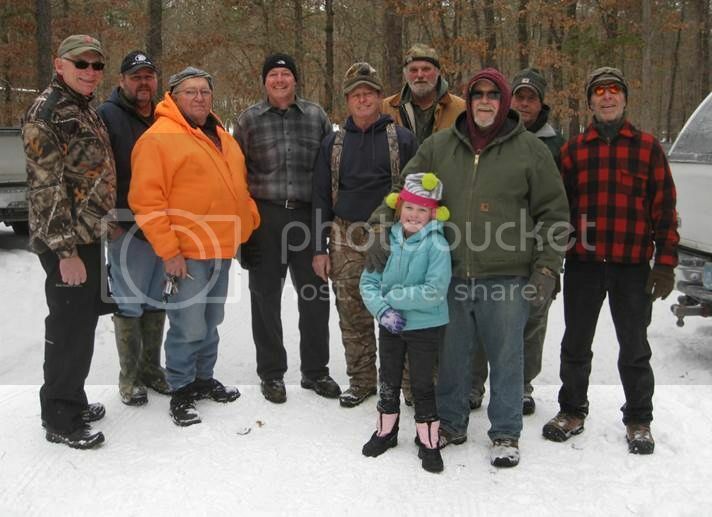 Jadynn's Dad is member of the Appalachian Bowmen of Sussex County. 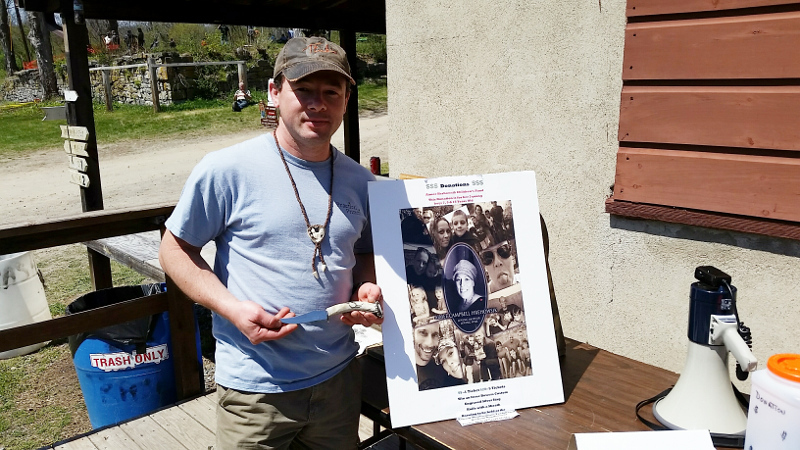 At the 24th Annual Whittingham Traditional Rendezvous TANJ held a Aimee Hrehowsik Family Fund Drive. 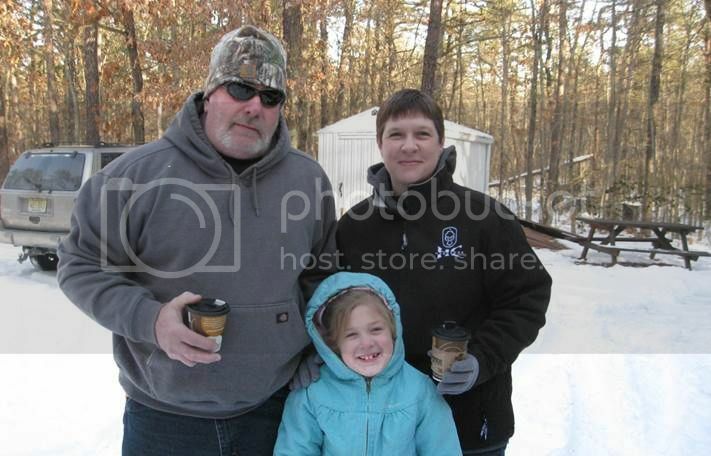 As you know Aimee passed away this past January at 39 years of age after a losing a courageous battle with cancer. 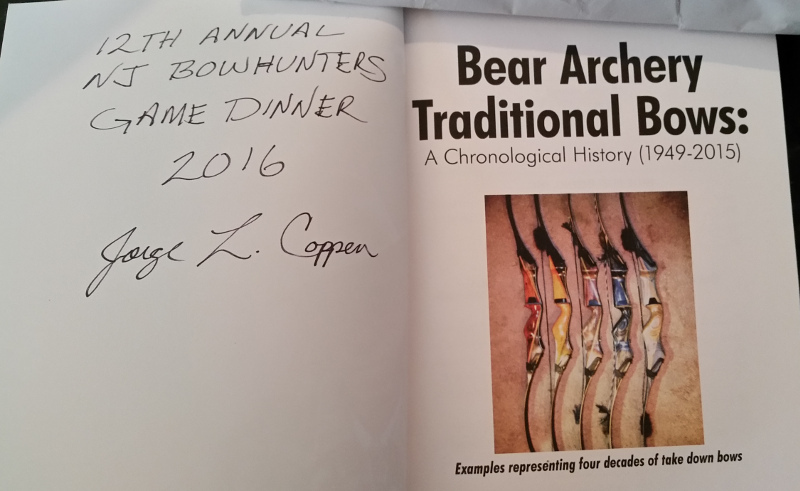 They prizes were a Bowers custom envraved Silver Stag Knife, a Basket of Cheer and Hope, a Byron Furguson Autographed Arrow & Fred Eichler video. 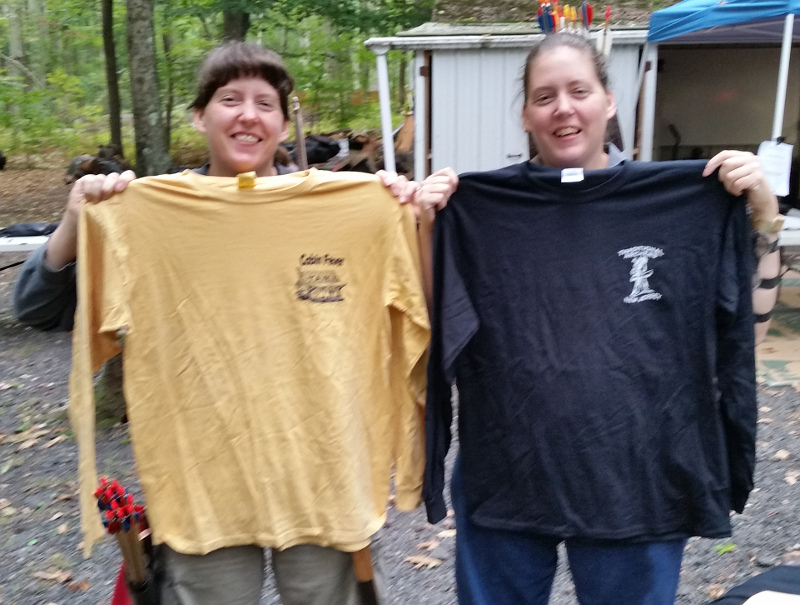 Here are pictures of the winners of the 1st and 2nd prizes. 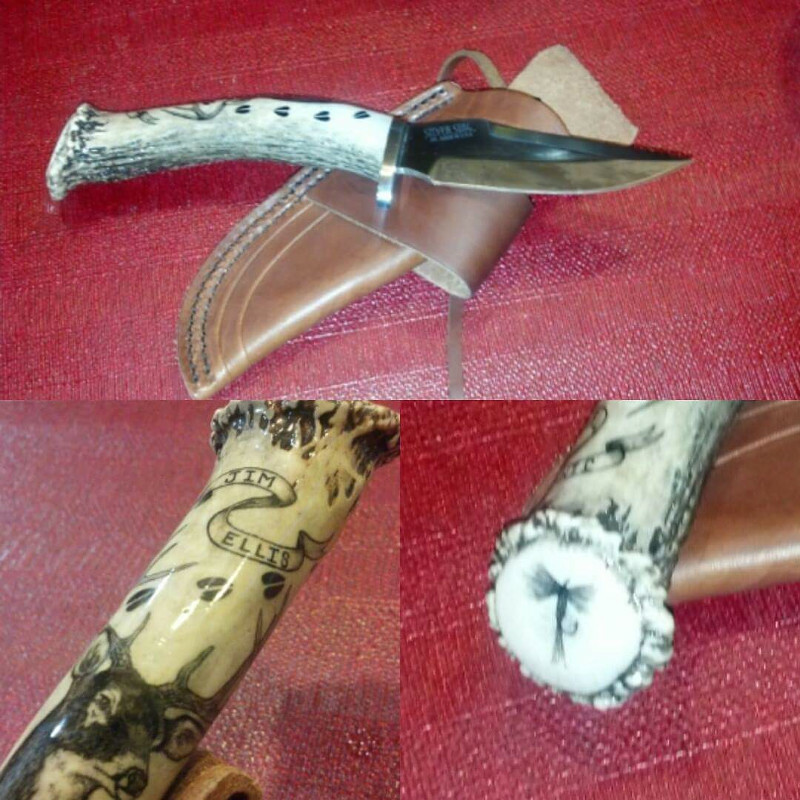 1st- A Silver Stag Custom Engraved Knife donated by Irene Bowers -won by Attila Fercenz. 2nd - The Basket of Outstanding Cheer and Hope donated by the "Gutyankers" - won by Tom Phillips. 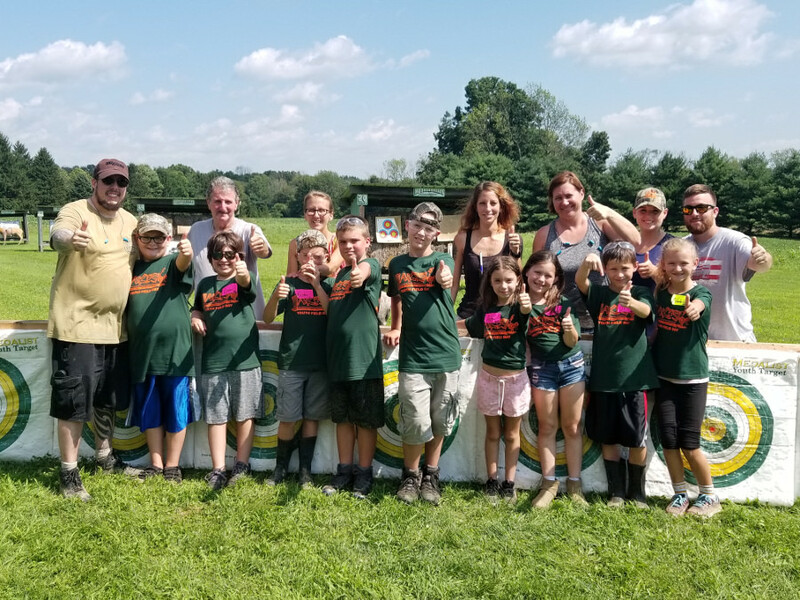 We would like to thank everyone who has donated over the last three 3D TANJ events to support Aimee's family which include her husband Ryan (TANJ secretary ) and his 3 young children who are ages 7, 9 and 15. They will always be in our prayers. We will have other fundraisers throughout the year at various TANJ sponsored 3-D events to continue our support of Ryan and his boys. 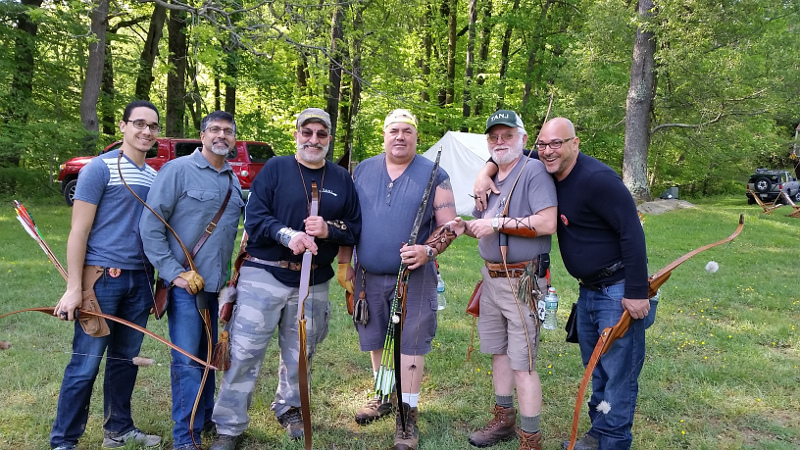 Today I was humbled to be presented with a beautiful personalized custom Silver Stag knife from the Traditional Archers of New Jersey at their annual meeting which was held at the 24th Annual Whittingham Traditional Rendezvous. They even captured a fly fishing element for me. All the artwork on the knife was done by Irene Bowers. only be purchased at a TANJ sponsored 3-D event! 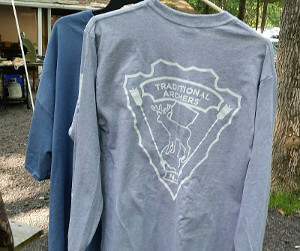 These will be available starting this weekend at the Whittingham Traditional Rendezvous April 22nd -24th. 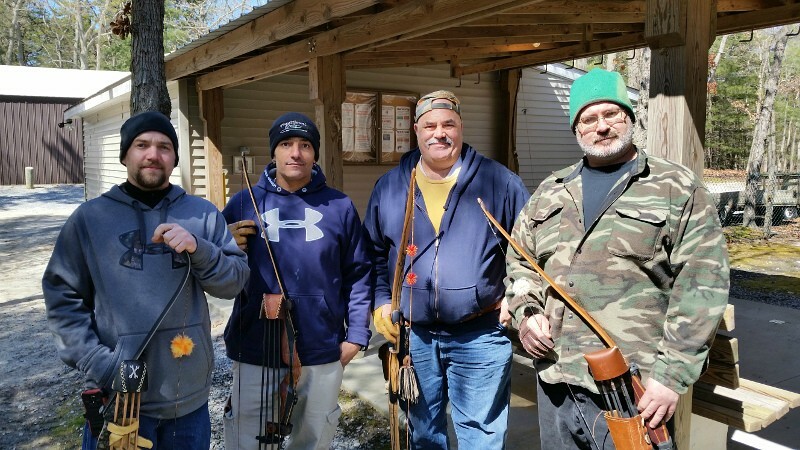 A few weeks ago Frank Florio and his members donated bows and arrows from the Floyd Bennett Archery Club during my visit to Brooklyn to shoot with my original archery club and friends. 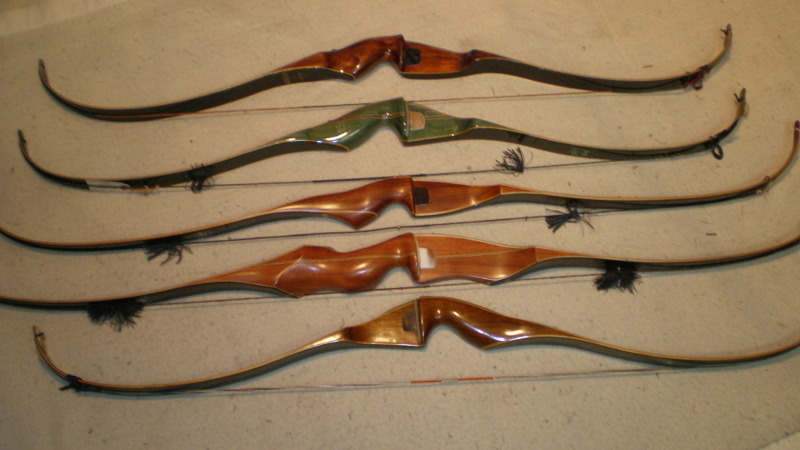 I returned home and donated them to Mike Tully of GutYankers the next day how to fix up and hand out to some needy child and continue to keep lit the flame of archery. 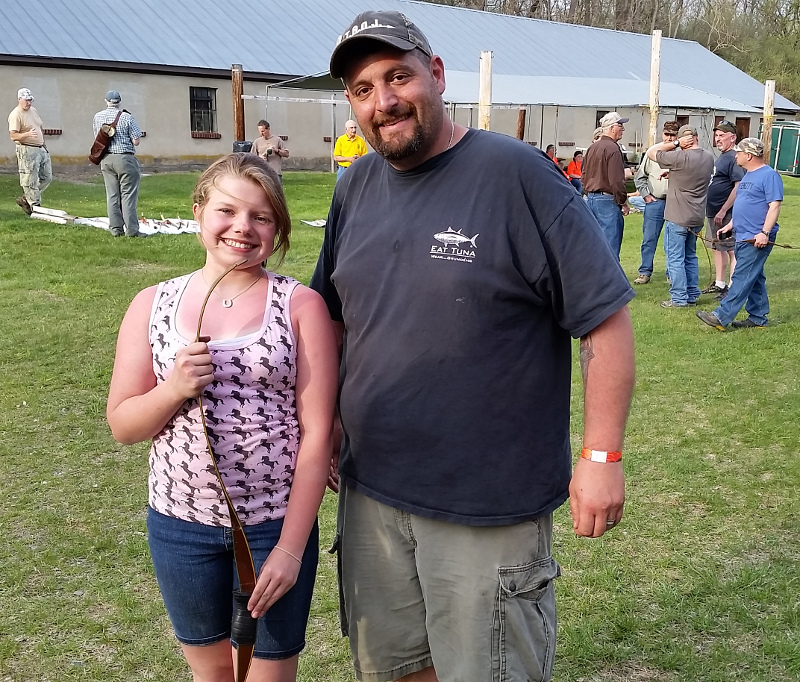 "My daughter and myself are new to the archery. 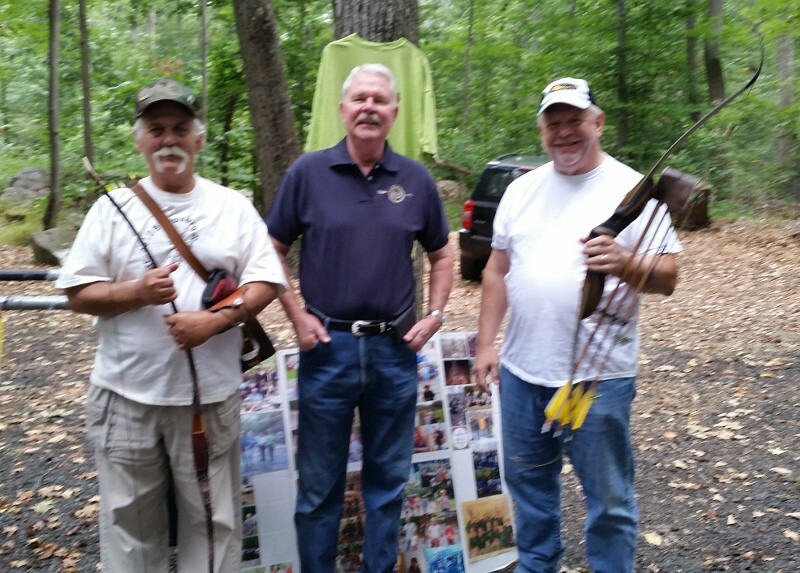 We joined the county range in union county at the oak-ridge park . 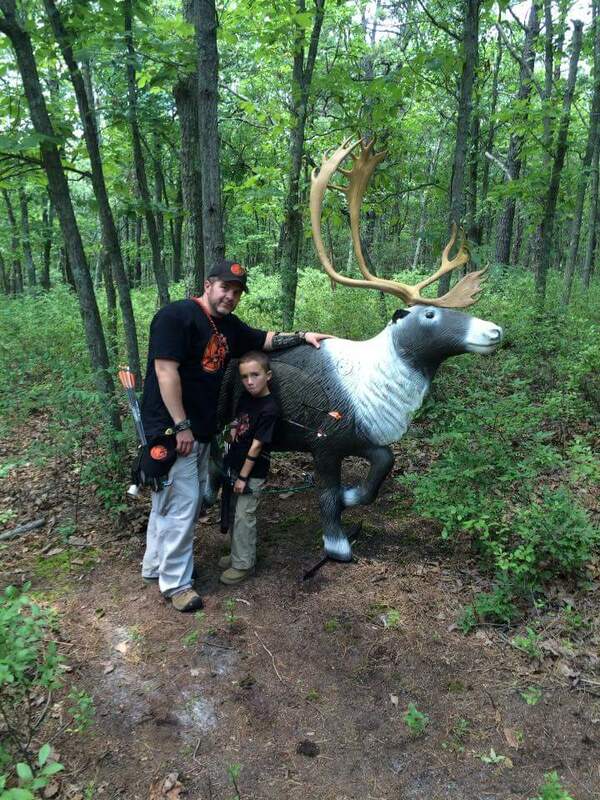 We ran into Mike Tully and his wife and they gave us free arrows for my daughter . 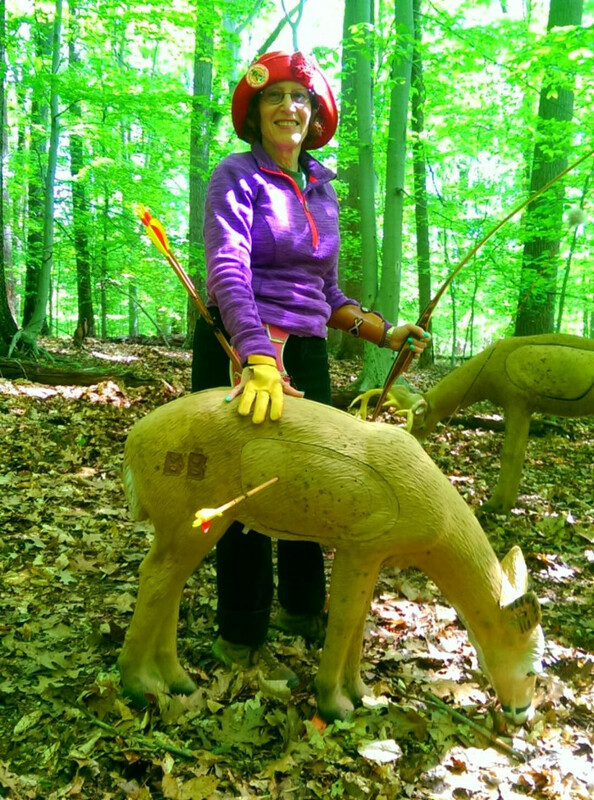 This was a nice surprise for us, she only had 2 arrows to start with. She was was so thrilled to have them, in fact she did so well shooting today it made me so happy. 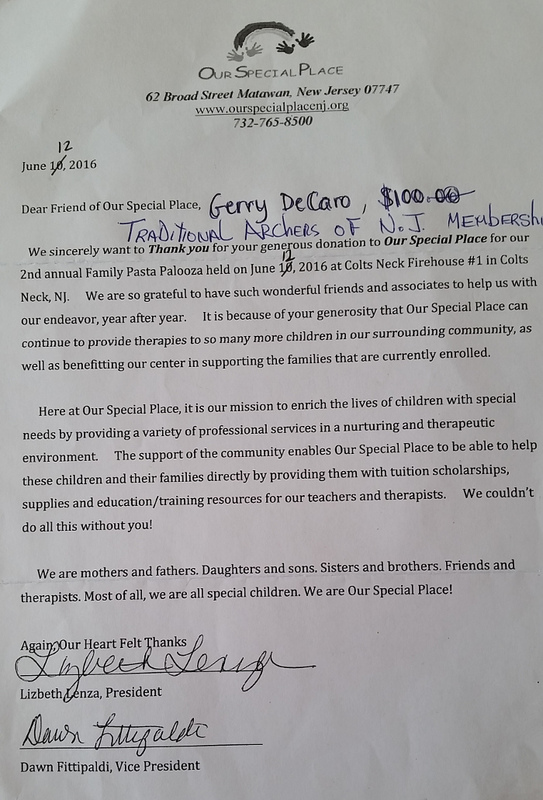 What a nice organization you have . Its people like yourselves that make the difference. 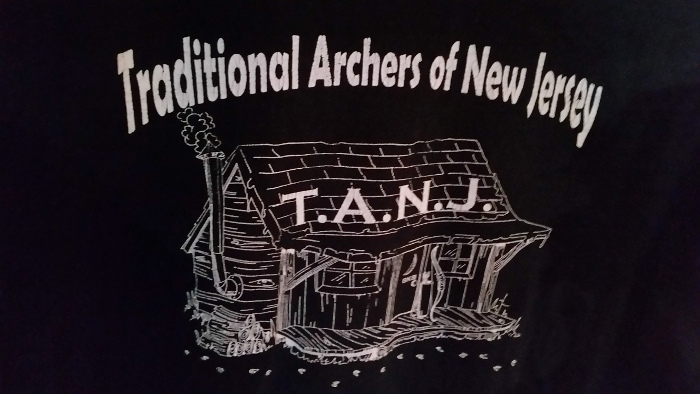 Thank you so much ..."
We, the Traditional Archers of New Jersey, are proud to sponsor our "Team TANJ" - Santo Armano & Jon Scharff - at the upcoming TAS World Championship. Good luck guys, and bring home the Title and Buckle! 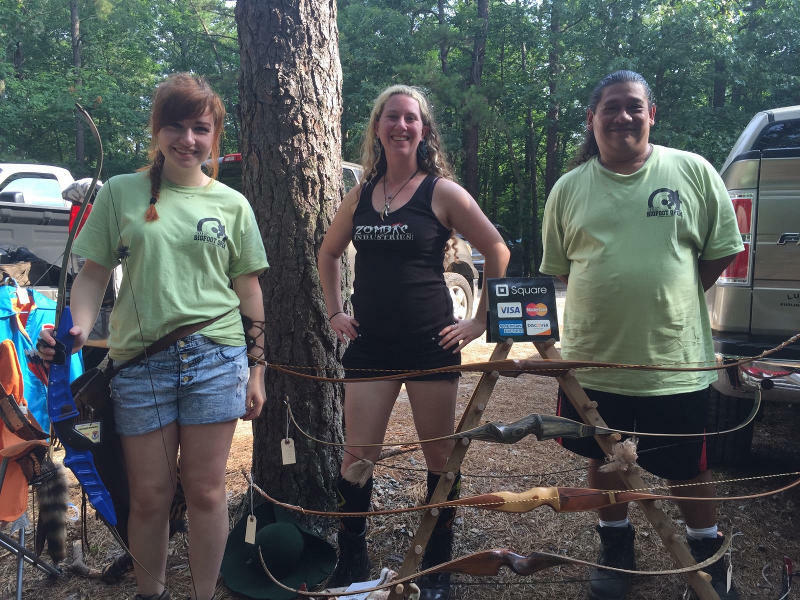 Happy Ending to the "Lost Bow" story! Yes --- That was a plug! Dad, Scott Bowling, wrote -"To everyone in the Black Knight Bowbenders and the CJAN community. 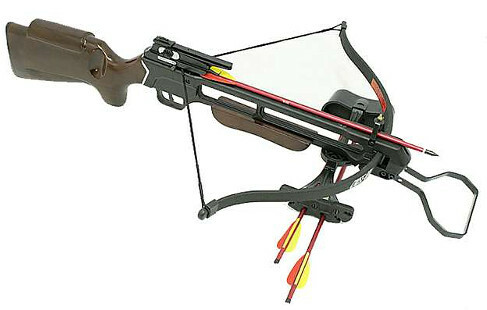 Tucker's bow was found and I am picking it up on Saturday. 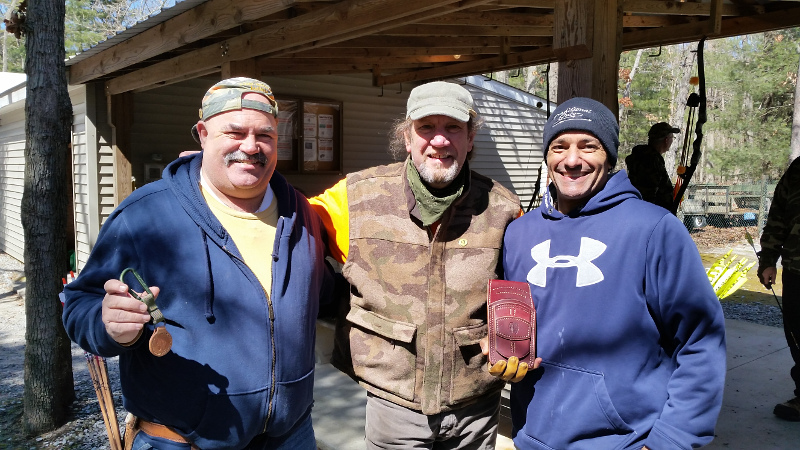 It was found by a homeowner in Jackson, and returned to a member. I thank everyone for taking some time to help with everything. You all have a friend in me. 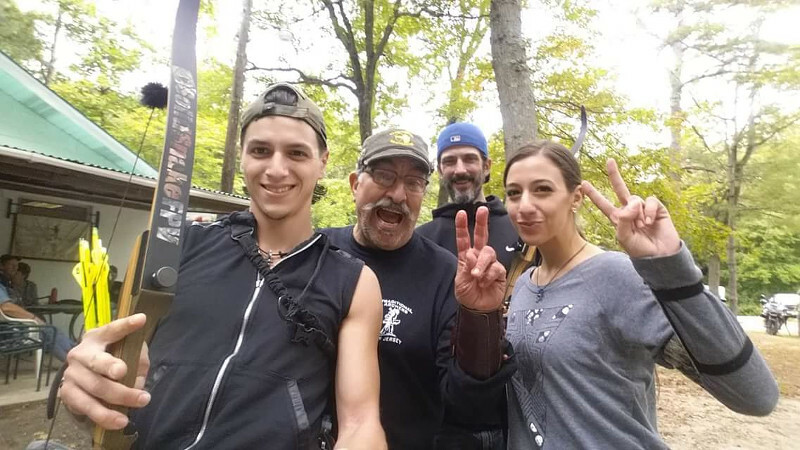 I will most positively bringing Tucker to shoot with all of you guys many times in the future, I also owe a huge thanks to Warpath Archery for making such a wonderful bow in the first place." Thanks, Rich Youmans, Scott Bowling, and one Happy Tucker! 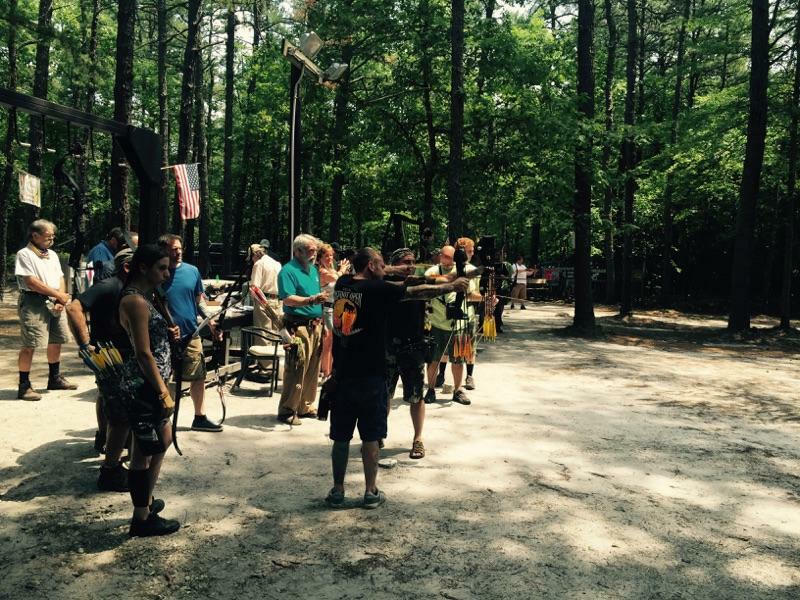 TANJ Cabin Fever February 28th, 2016 - over 163 shooters! 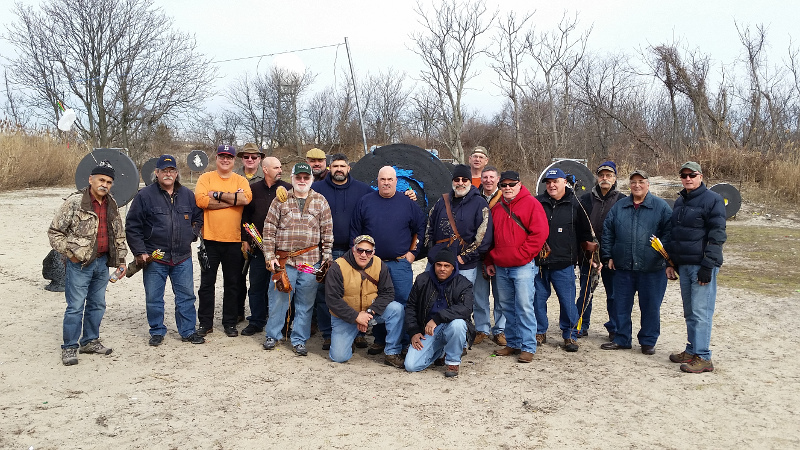 On Sunday February 21st,2106 I went back to my old Brooklyn Archery Range and met with the FBA members (Floyd Bennett Archers) What a good time we had flinging arrows with some great friends and many TANJ members at my first club that I joined back in the 1970's. 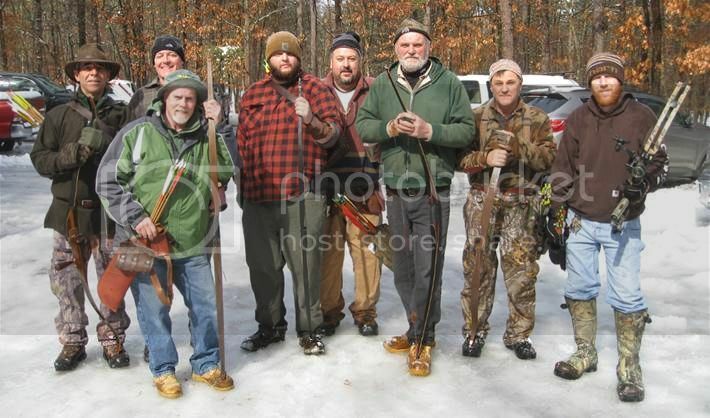 Many are TANJ members and they were warming up for our Cabin Fever Shoot Sunday February 28th at Black Knights. 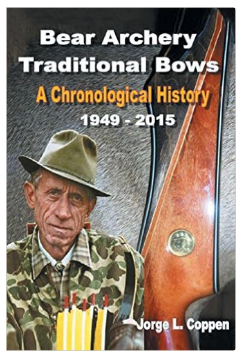 Frank Florio handed me a trunk full of older bows for Mike Tully and the GutYankers donated by FBA for the kids. 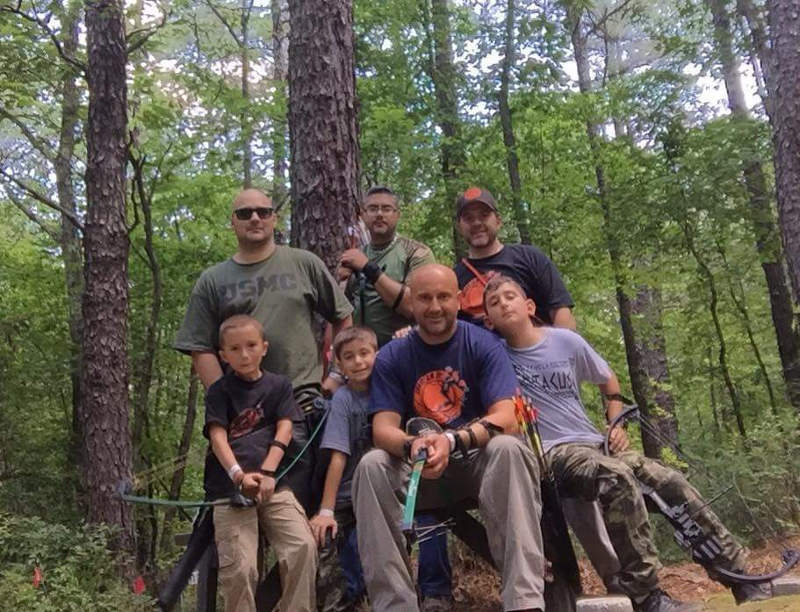 Mike T and his crew will now refurbished them up and hand them out in the near future to families you can't afford to purchase archery equipment for their kids. 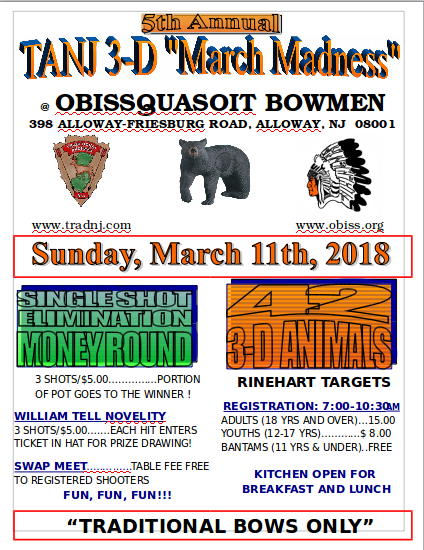 TANJ is back at Obissquasoit downSouth NJ .. We are proud to announce that we are again the cosponsors along with Obiss with our combined 3rd Annual March Madness "Traditional Only 3D Swap and Shoot ". 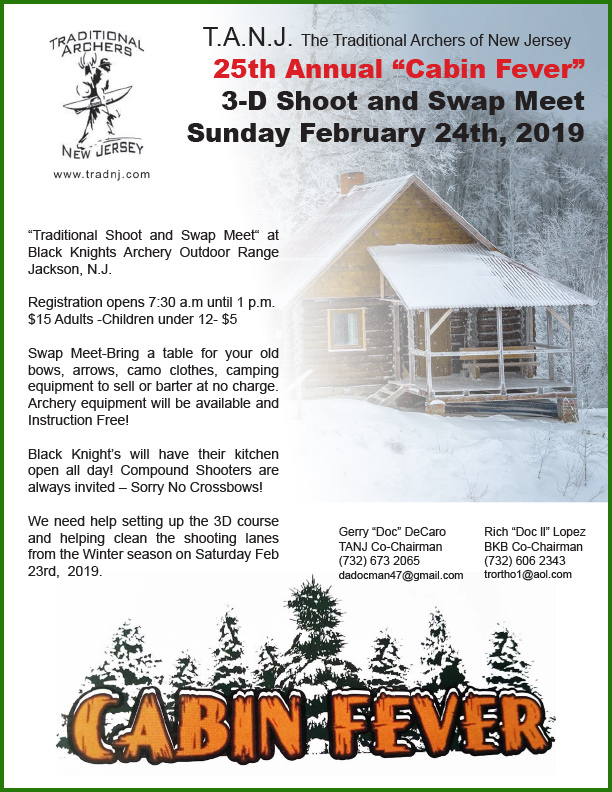 Yes you read it right -its one of the few events where we tell everyone leave the wheels at home and bring the stickbows along with your wood, carbon and aluminum arrows and "lets have some fun" !! 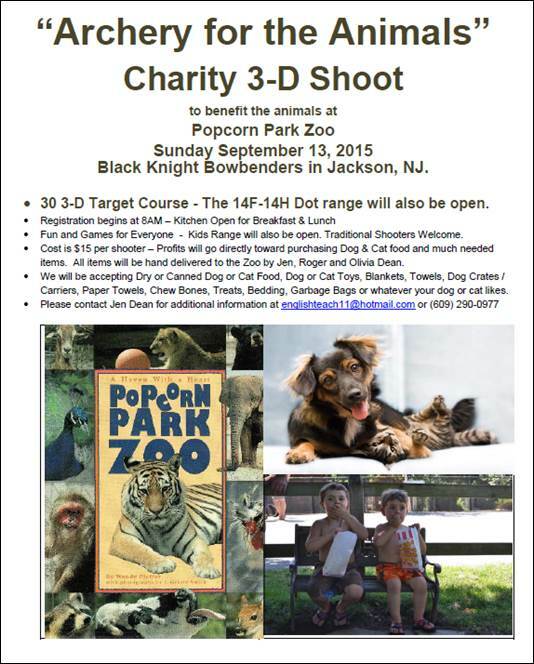 One of the best 3-D ranges in N.J. Indoor Kitchhen! What a layout ! Great Food! Great People ! Plenty of Games throughout the day and a mega Swap Meet ! 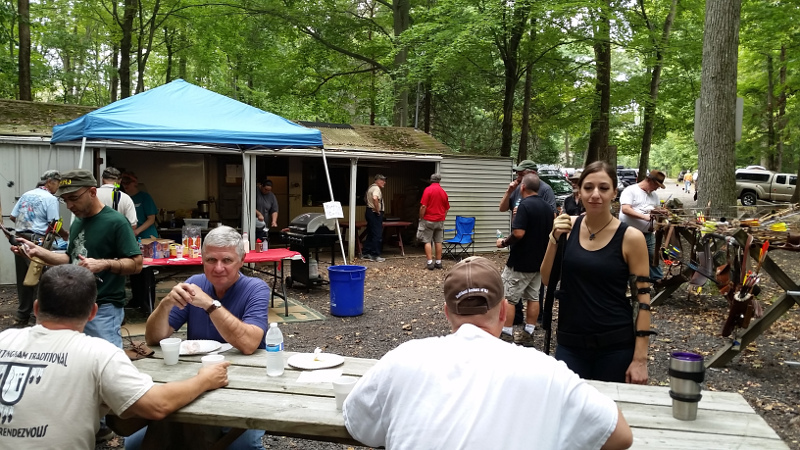 We always draws a huge crowd.We again like to thank Obiss TANJ members Pete & Dave Onesti and his crew for hosting another great event. The second flyer attached speaks for itself the R100 but you must preregister so if you you decide to " snooze you will loose" ! 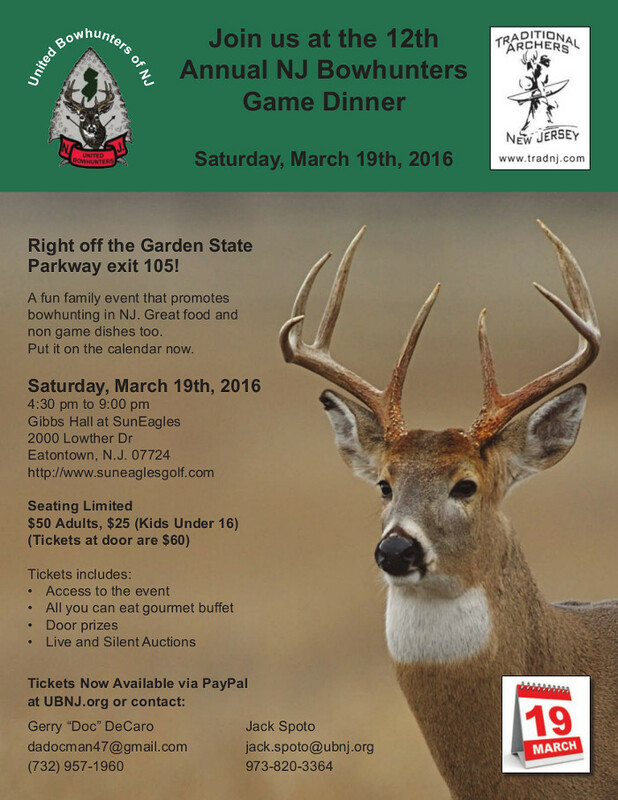 First time in N.J. spots are filling up fast. 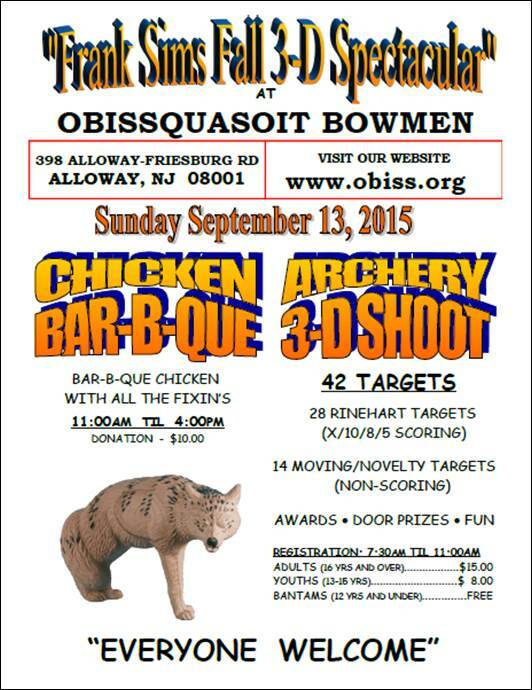 Look at the Obiss FaceBook Page. TANJ will be at both Obiss events in force. This year our 22nd Cabin Fever which will be held at Black Knights TANJ will have 2 different styles of Long Sleeve Cabin Fever shirts available for sale from Med up to XXXL. So when you register please don't forget to pick up your shirt they will be no reorders. 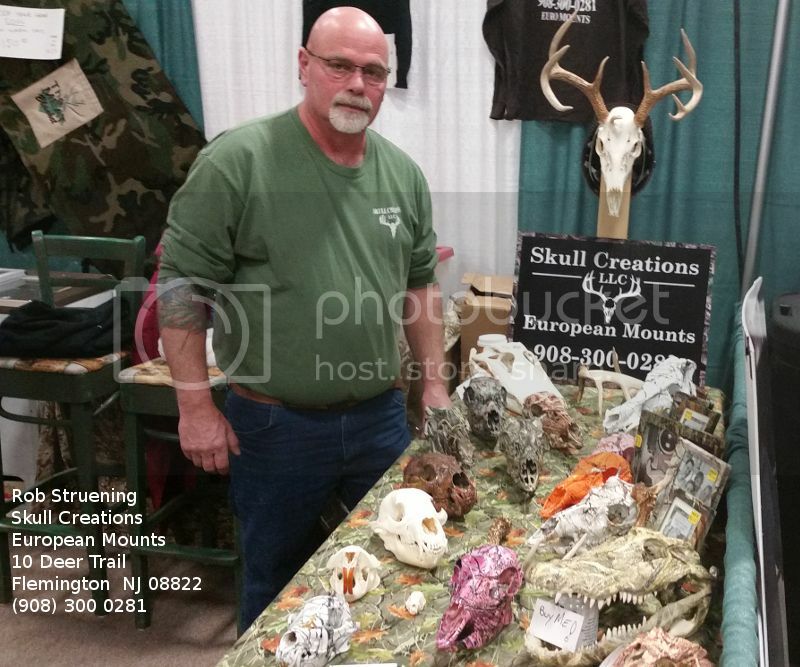 We will have new custom camo baseball hats and camo knit hats for sale along with our Man Walking & Broadhead Deer logo decals along with our great selling arrows for your truck and smaller decals for your compact car back windows. 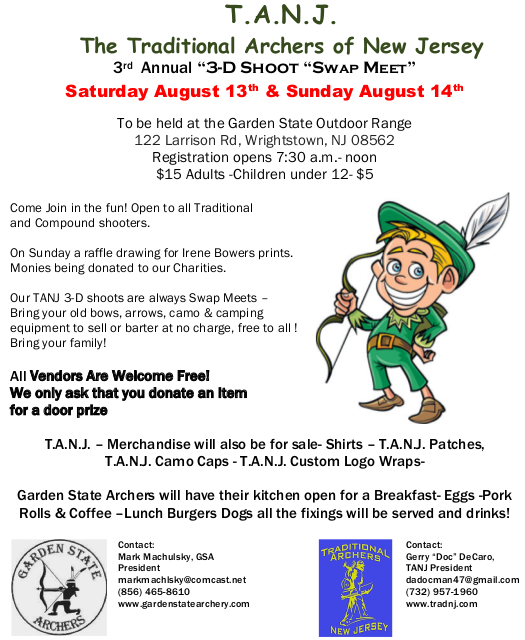 It's also a swap meet so don't forget to bring stuff for sale barter or to purchase. See you next at Cabin Fever next Sunday February 28th! 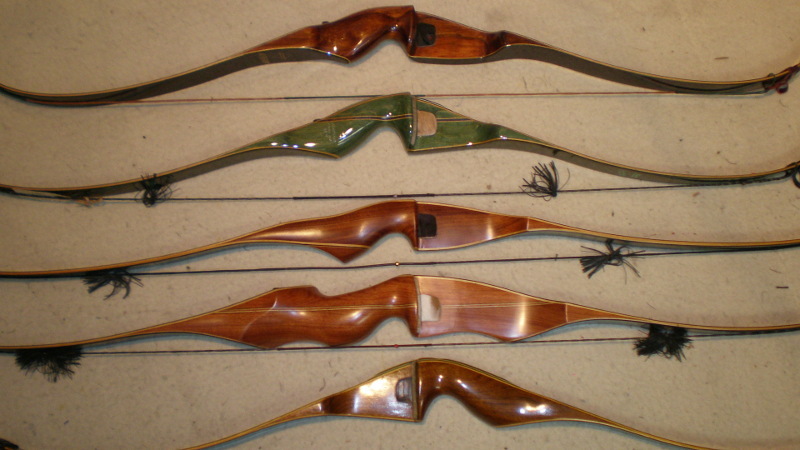 All bows are refinished to near mint condition with all new 18 strand Flemish strings that include rubber string silencers, arrow nocking points and arrow rest. 1. Right Hand - Browning Nomad Stalker, 1960's, 55#, 52"
2. Right Hand - Bear Kodiak Magnum, 1973, 38#, 52"
3. Right Hand - Hoyt Pro Hunter, 1970's, 45#, 58"
4. Right Hand - Howatt Hunter, 1970's, 50#, 62"
5. 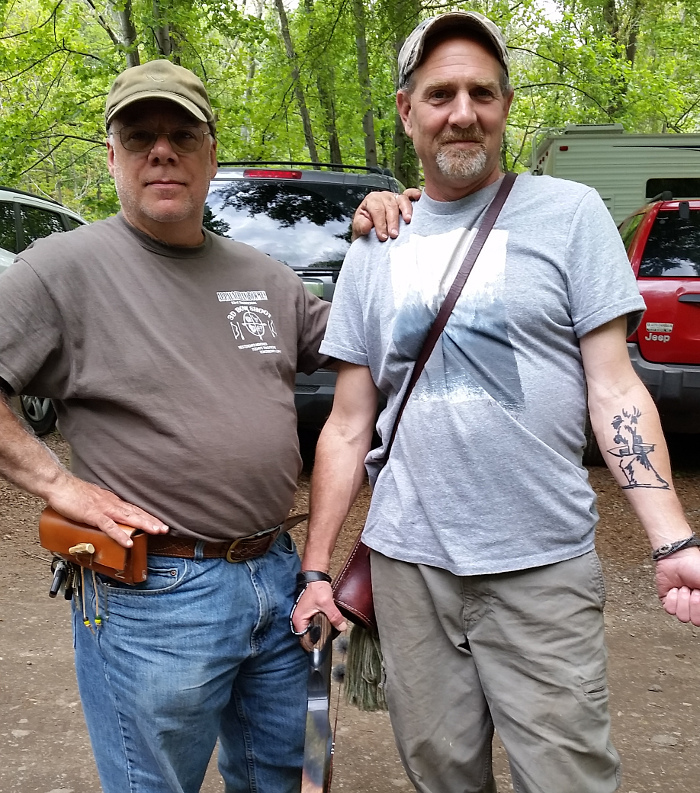 Left Hand - Bear Kodiak Magnum - 1968, 45#, 52"
George Sappah TANJ Treasurer aka Robin the Hood smiling because of the 2016 TANJ dues checks being received. Did you mail your dues in yet? 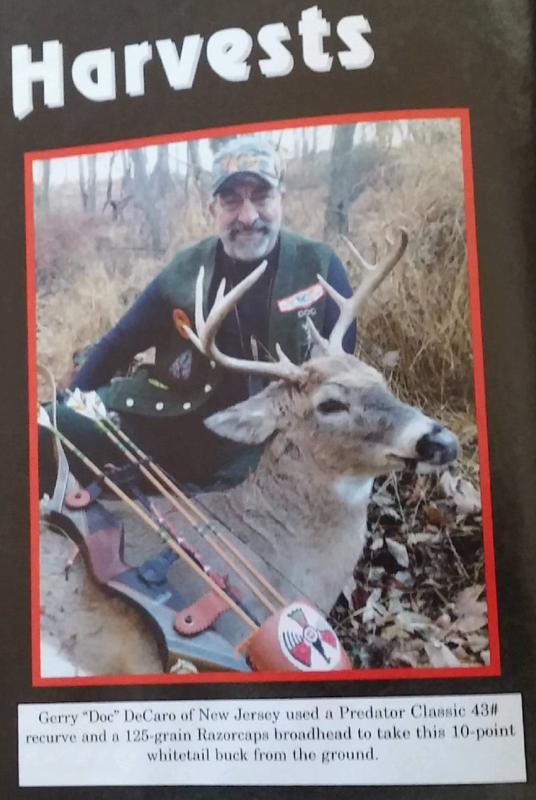 On Sunday January 3rd, 2016 TANJ member & UBNJ magazine editor Mark Dreyfus harvested this NJ 7 pointer in late afternoon. 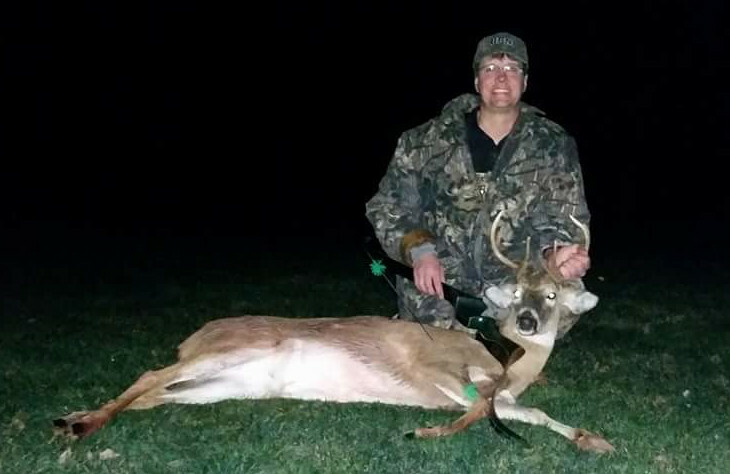 He was hunting with an original Herters Sitka 62" 45# bow that he just purchased only a few months ago, a sweet fast & quiet bow. 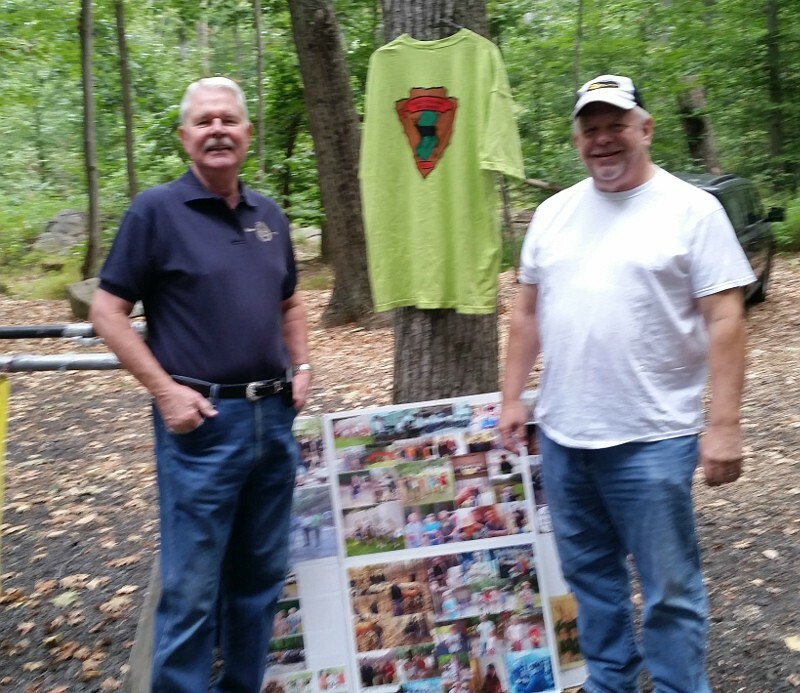 Mark is the assistant Scout Master of Troop 34 from Jackson that TANJ has hosted at Whittingham for the last 3 years. 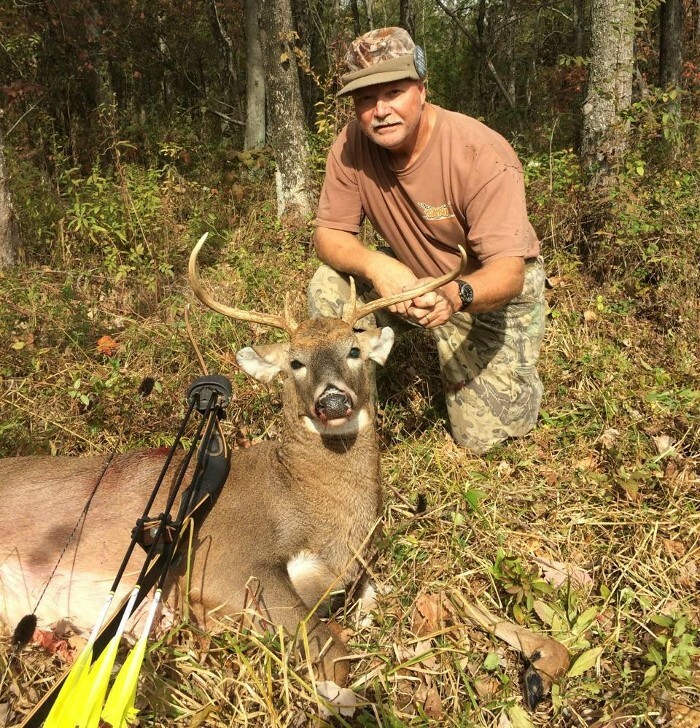 It did not take him long to take up traditional bowhunting and harvest a deer. Congrats Mark!!! 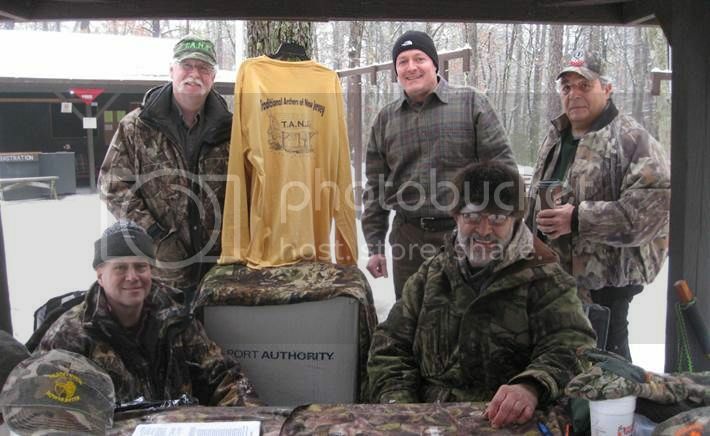 Mike Bush, owner of Mountain Mike's, wearing his new TANJ shirt! 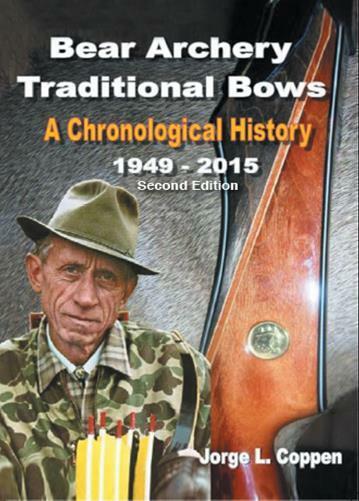 Nice form, "stick bow traditional perfect". 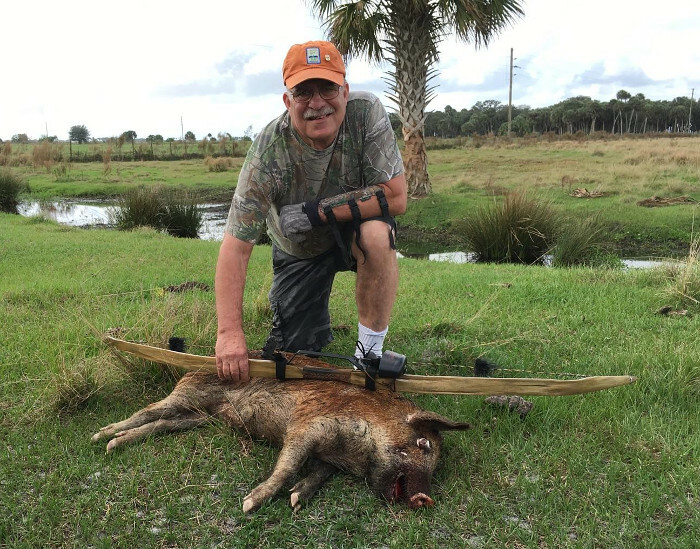 taking a hog down in Florida using his own home made self bow. 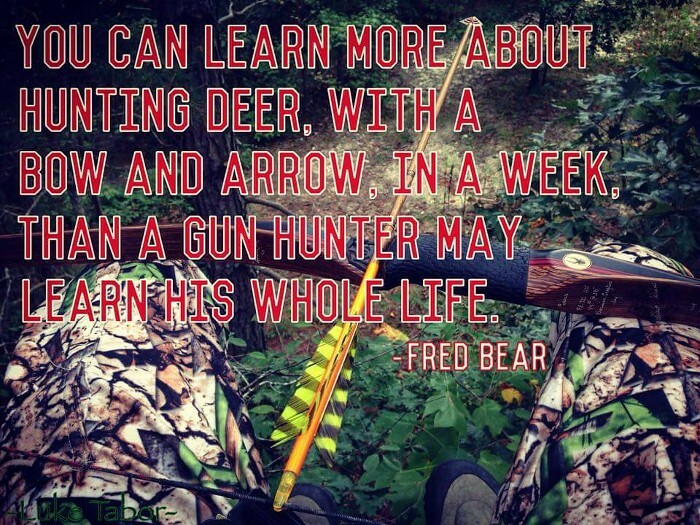 Fellow deer hunters, our voice needs to be heard! We are conducting a survey about the direction of deer management in the State of New Jersey. 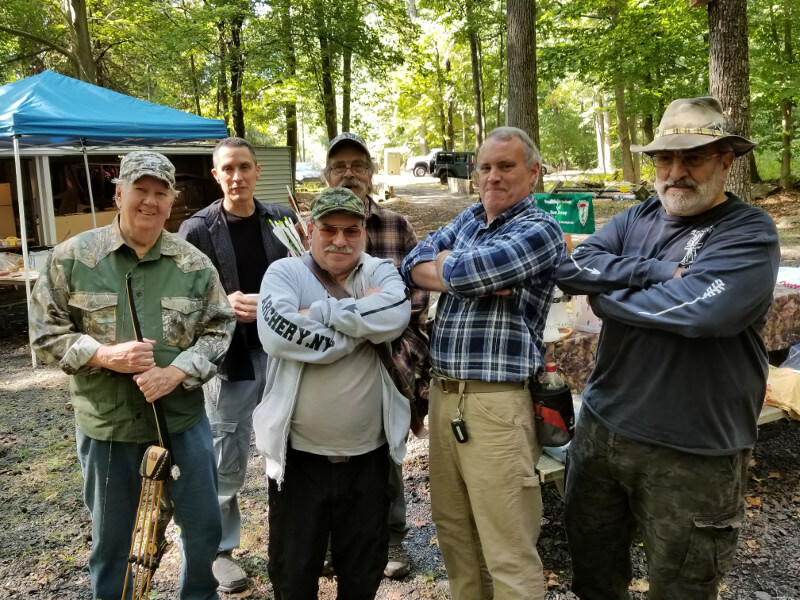 Many members of the United Bowhunters of NJ and other fellow deer hunters have been providing feedback regarding multiple concerns pertaining to the direction of deer management in NJ. 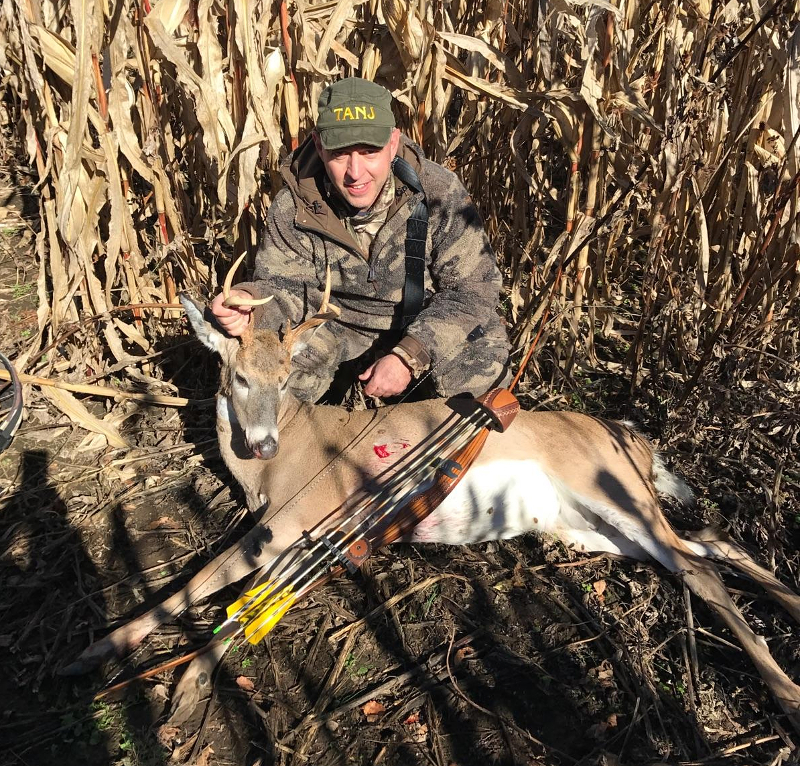 As the voice of the State's bowhunters, we want to obtain feedback from all deer hunters and use the results to open a dialogue With the Division of Fish and Wildlife and the Fish and Game council regarding the future of deer management. 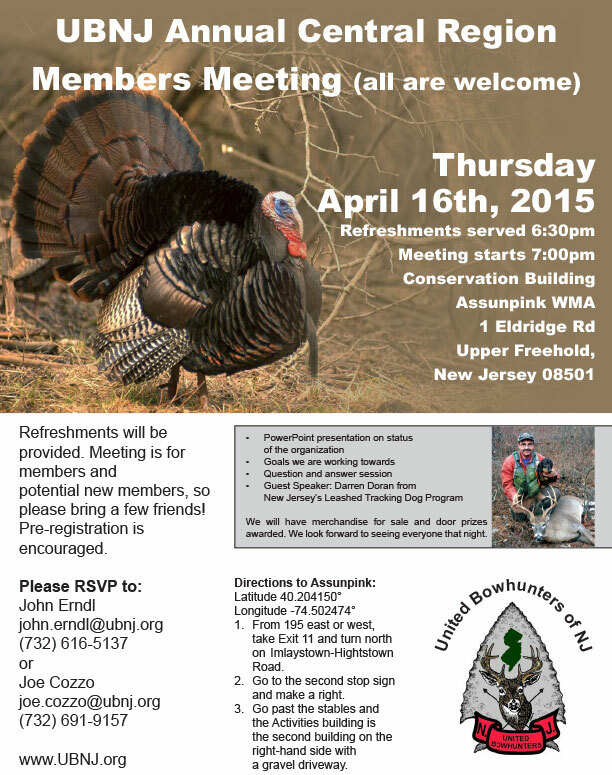 Many TANJ members and friends of the bow are saying that they like to voice their opinion on NJ direction on N.J. deer management program, well here is your chance! Take the Survey now!!!! 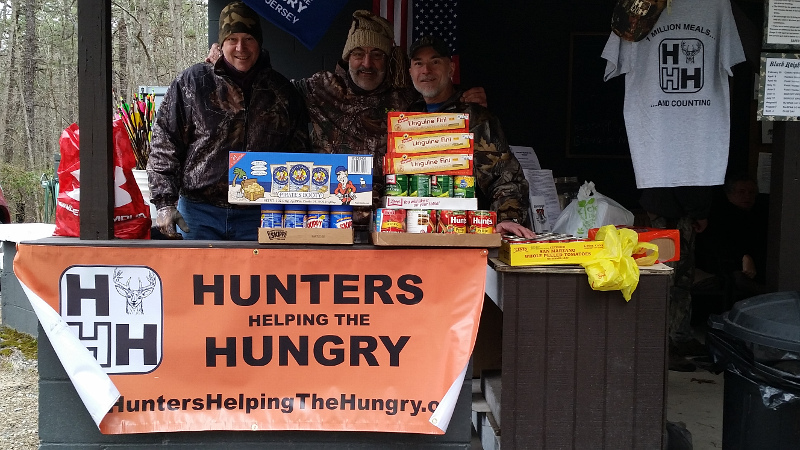 Feel free to share this link with your fellow hunters. 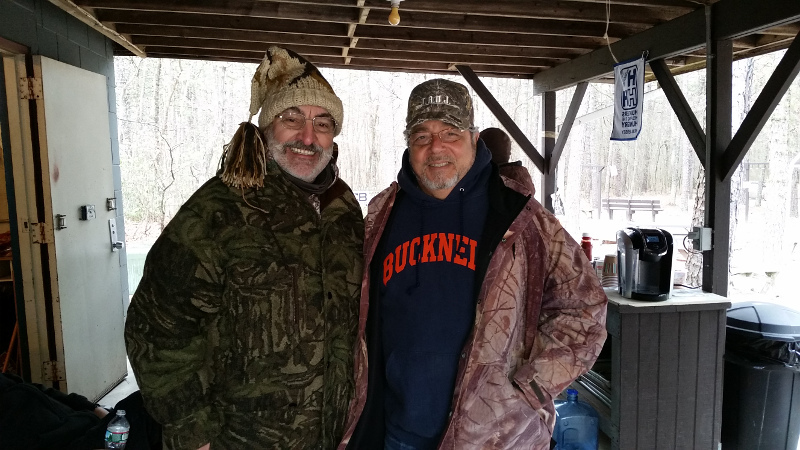 New TANJ member Ed Andia shot a turkey at 3:30pm - just in time for his families Thanksgiving Dinner! 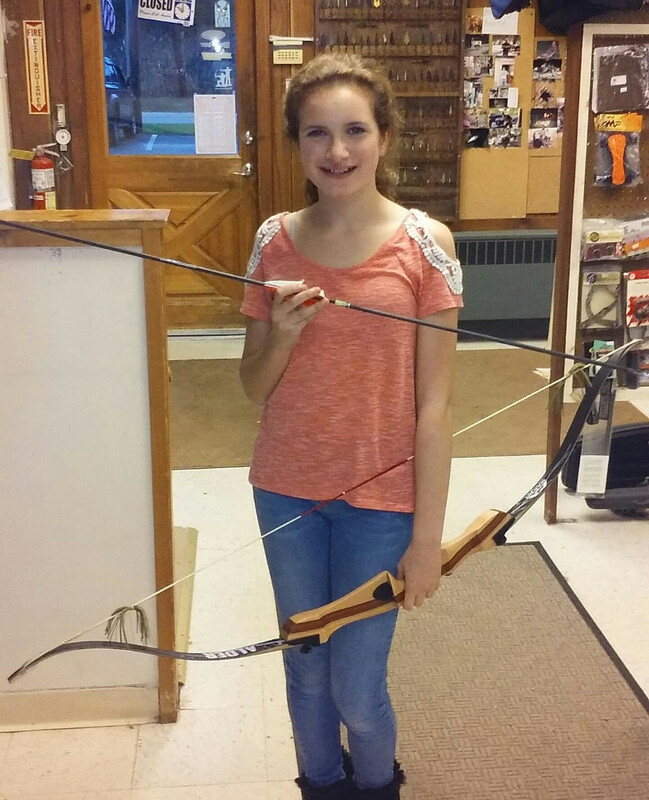 Miss Amanda after only five lessons with a traditional recurve at Mountain Mikes Sports Shop shot a Robin Hood! Let's keep the flame burning in our youth - "They are our Future"! 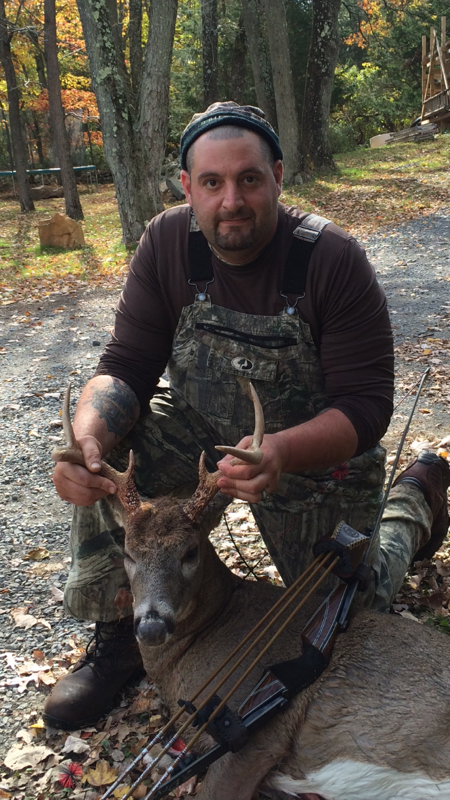 This buck was taken in Solebury Township, PA, shot by TANJ new member Santo Armano with his new 60" Dryad Epic Longbow. He used 3Rivers Traditional Only 500 spine full length shafts. 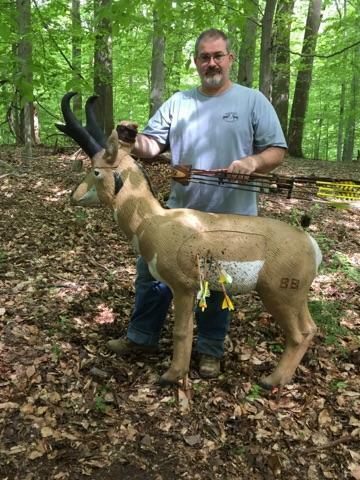 Broadhead used was a 125gr. Mantack G5 Stainless, with 100 grain Top Hat insert. 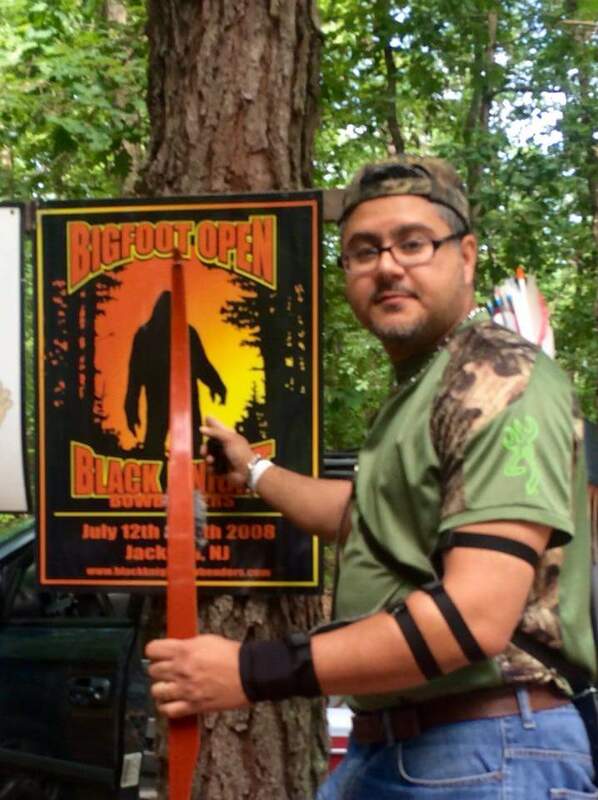 Santo is also a avid 3D shooter and travels to many events, an expert shot with his Longbow. 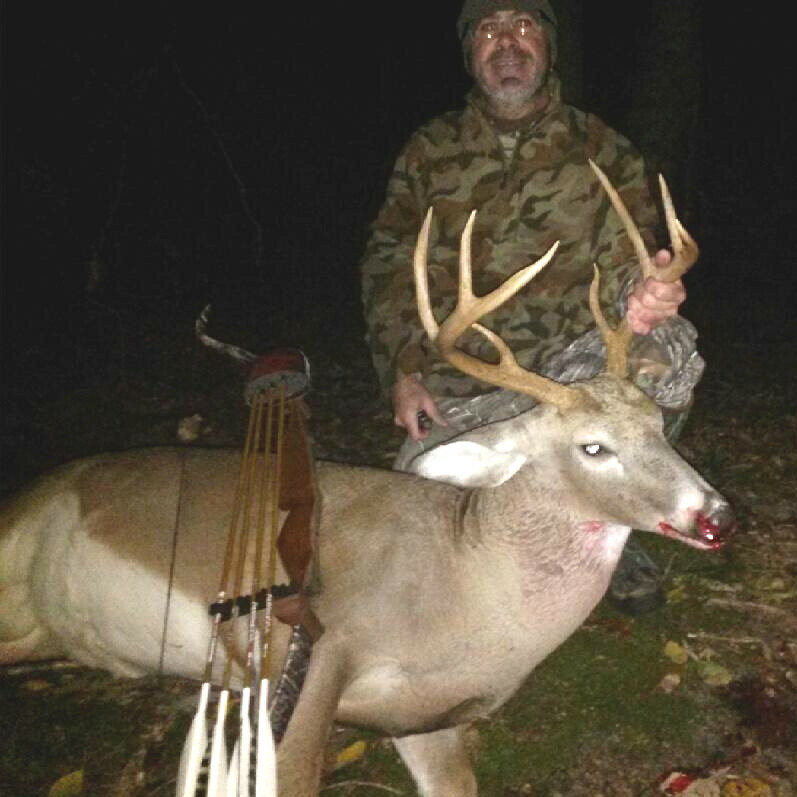 TANJ member Capt Jack Fleischman harvested a nice buck using the Allegheny Mountain bow he won at the TANJ/WAXOBE St.Jude shoot in Sept. 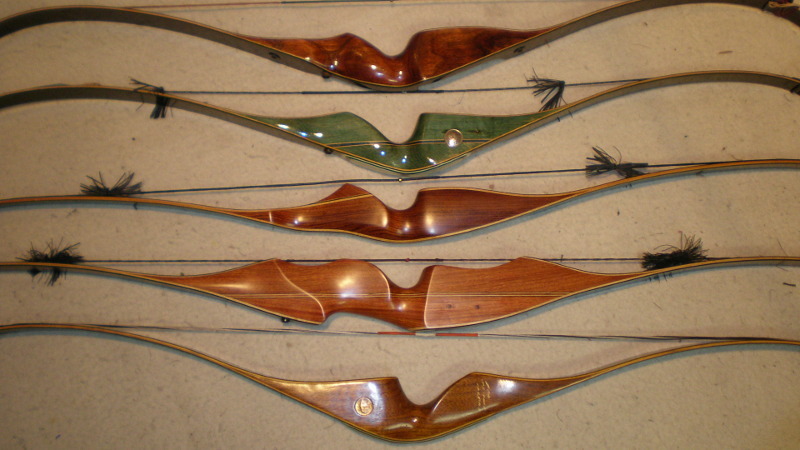 This fine bow is 60" long and draws 45lbs. 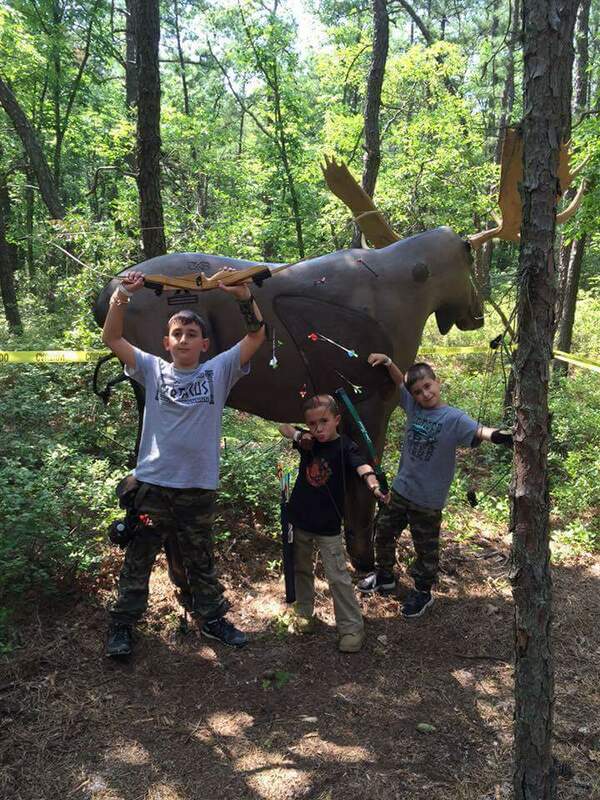 The arrows were built with 3 Rivers Traditional Only shafts and Steel Force two blade broadheads. 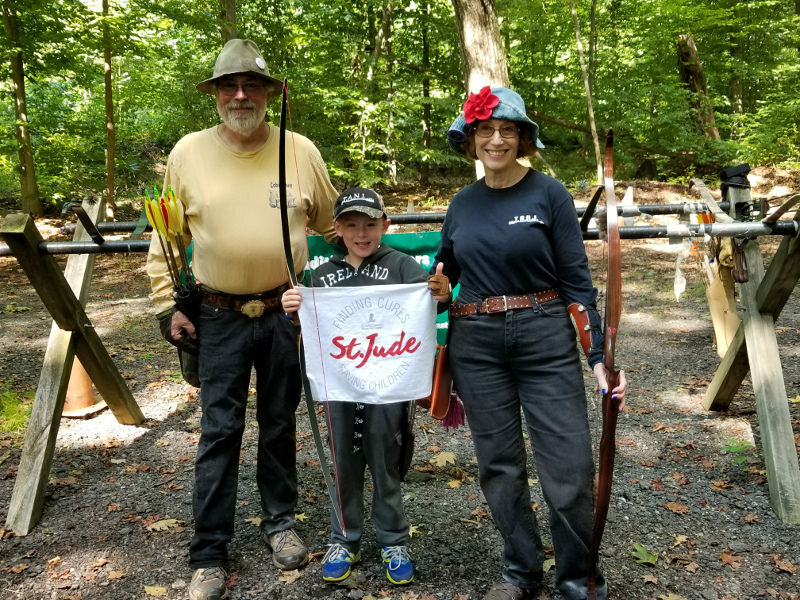 The winner of the TANJ ~ WaXoBe 1st Annual St.Jude 3D Bow was TANJ/BKB member Captain Jack Fleischman. 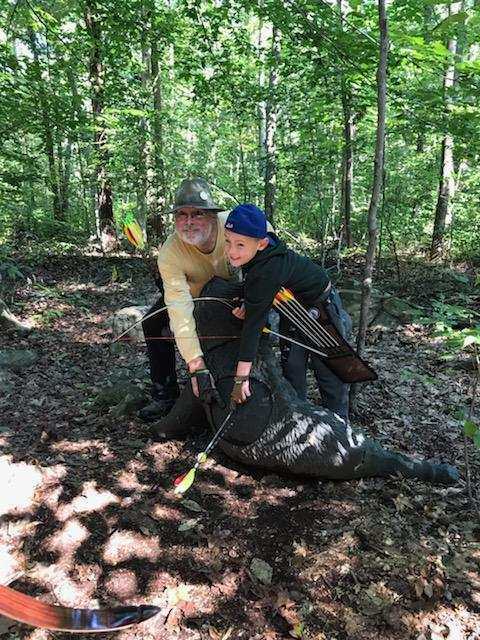 Jack was in Florida at his daughters Wedding when called, he was very surprised and could not wait to pick up his new bow when he returns later this week. 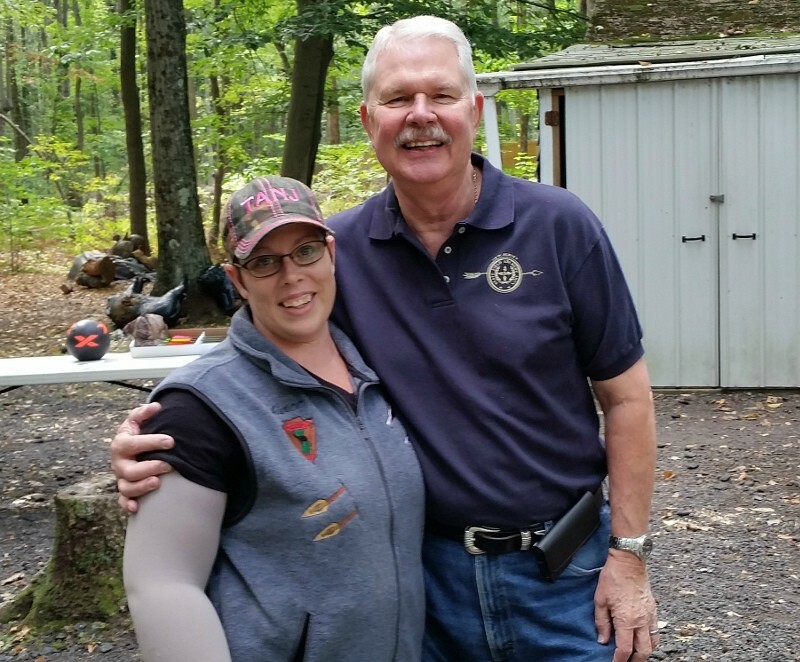 Mixing it up a bit and playing with front stuffers at the Layton, NJ, muzzleloading gun range. 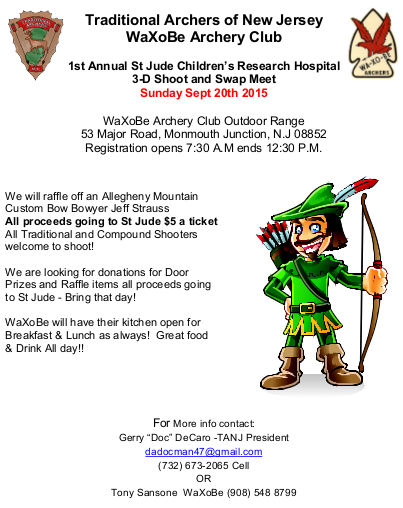 World famous archer Byron Ferguson and Jersey famous TANJ president Doc Decaro! 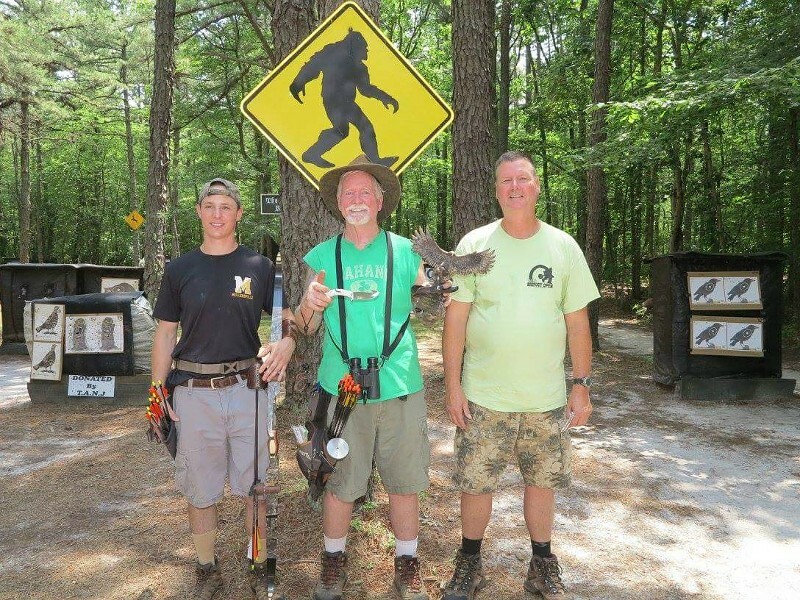 BIGFOOT 2015 - Last Man Standing! 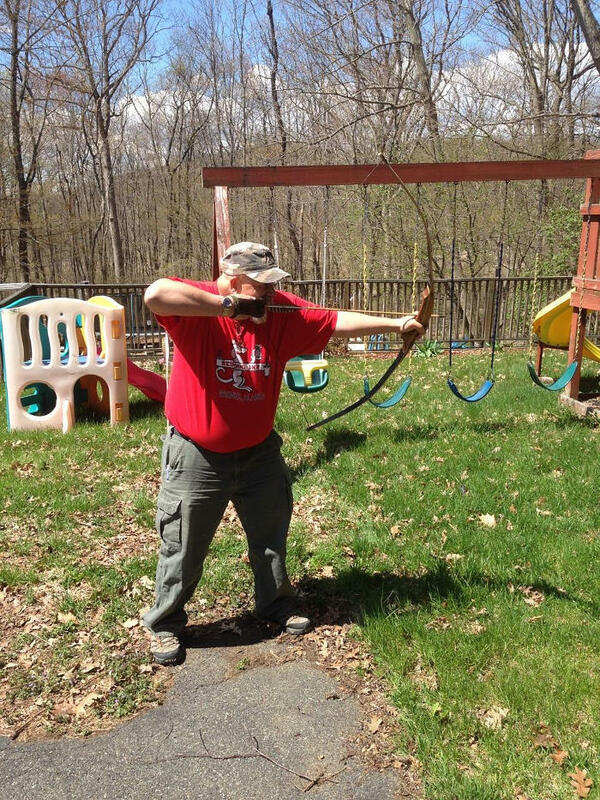 and Apprentice Bow and Arrow License”. 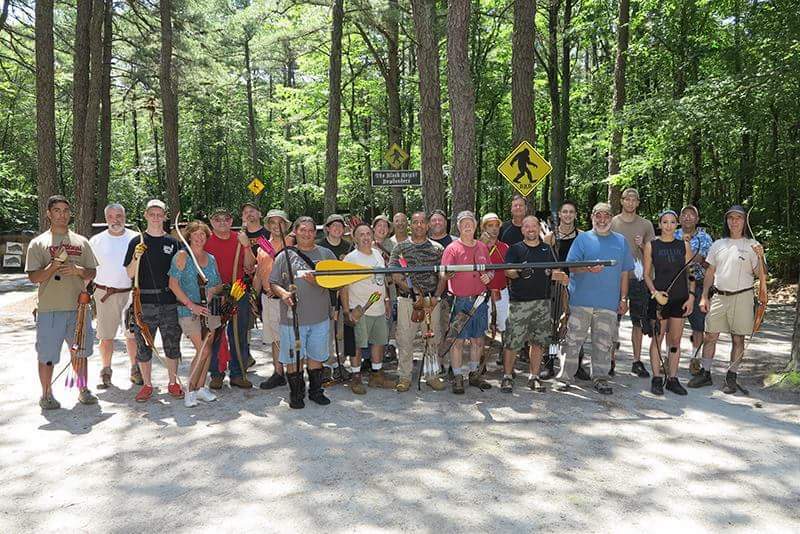 Arrow License” provides for the safe and responsible stewardship of New Jersey’s natural resources. 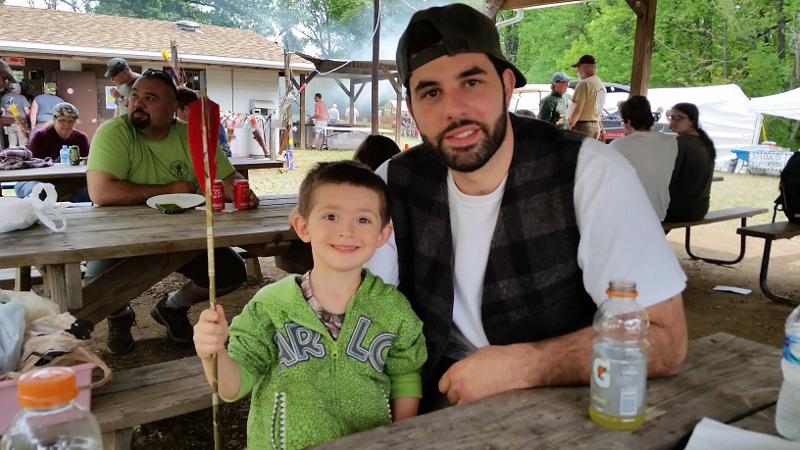 policy, but also helps protect the future of hunting for current and future generations! 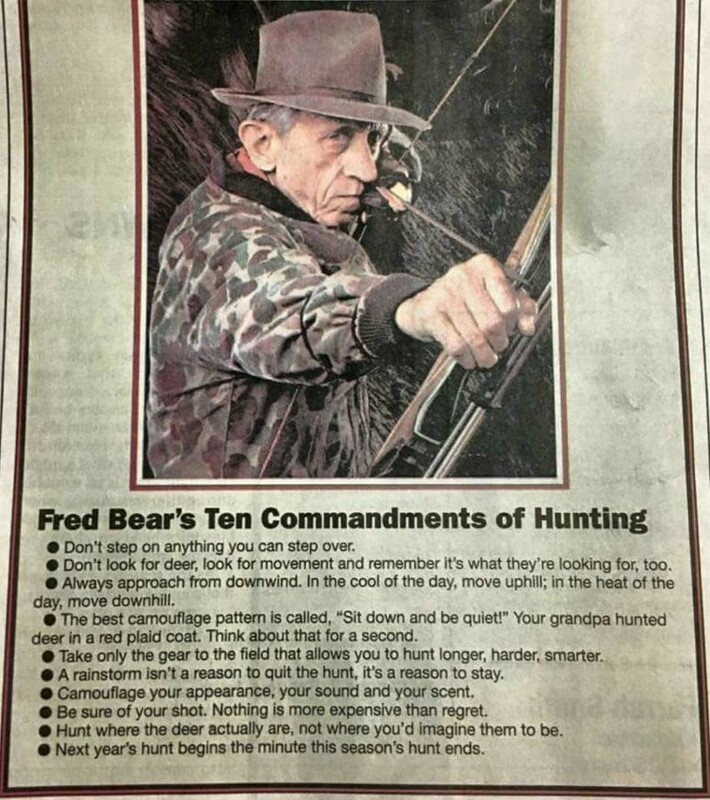 of simply lowering minimum hunting ages. while under his or her direct supervision. 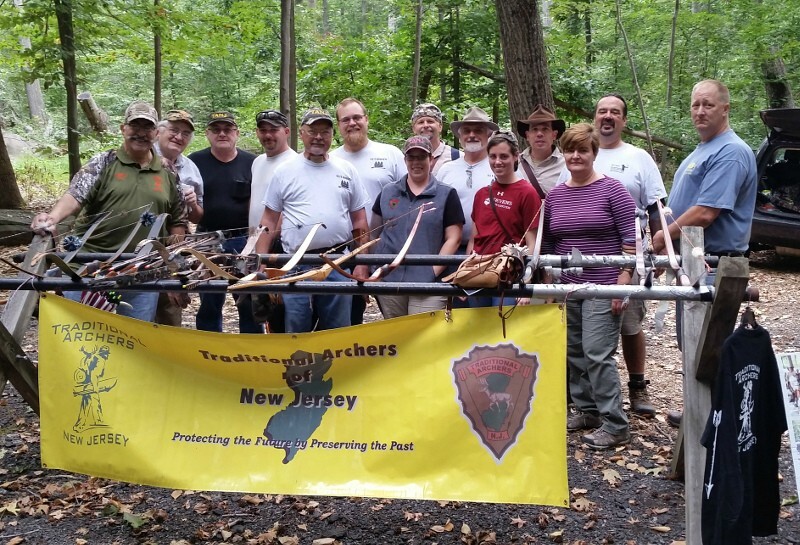 People 14 years and older can hunt in NJ – unsupervised – with the hunter safety course. 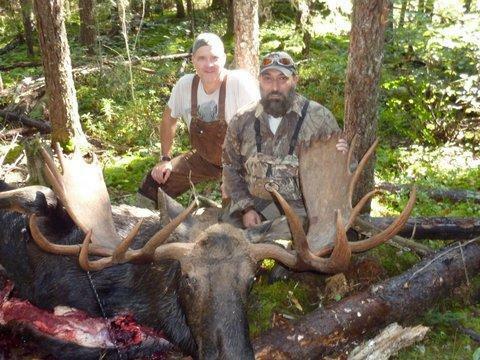 This bill will allow those 14 years and older to hunt supervised. mentor of at least 21 years-of-age..
incidents occurred in the absence of an adult. 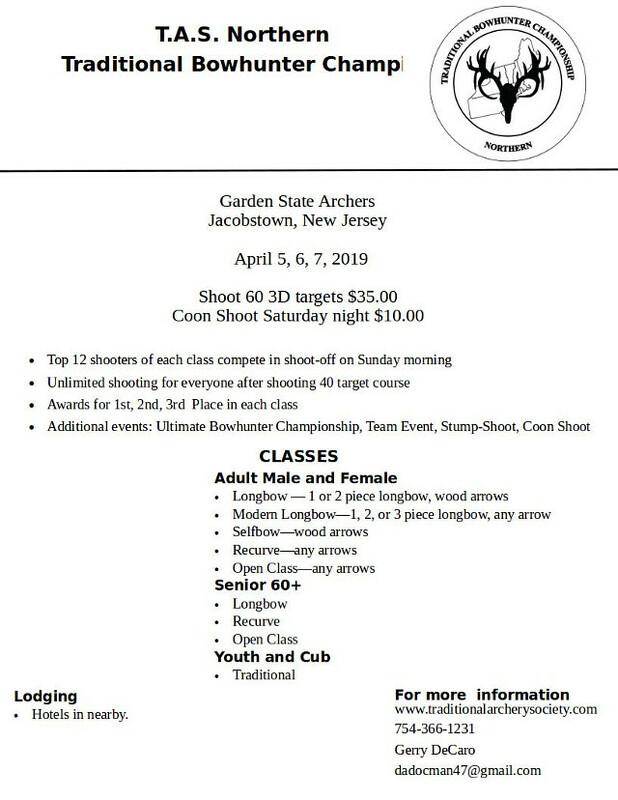 As you may know, sometime in the last month 14 Reinhart 3-D Targets were stolen from the Black Knights range and Club, in Jackson NJ, earlier this month. 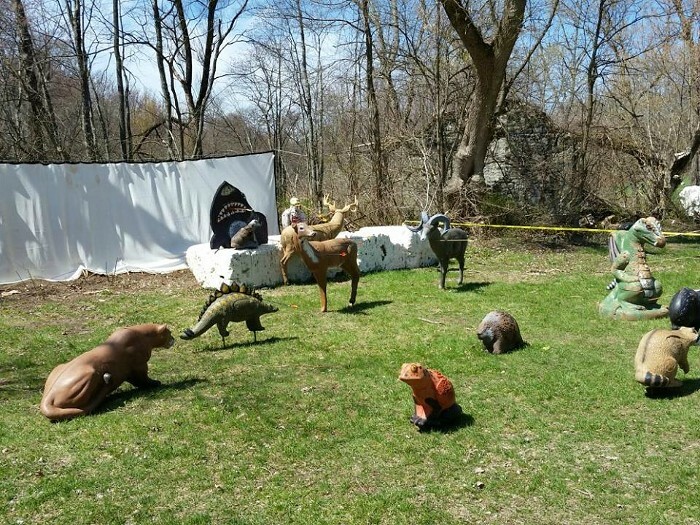 Here's a list of what 3-D Targets were stolen. 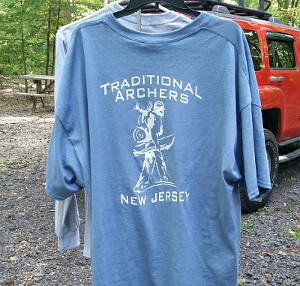 Please contact us if you see on any on EBay, Craig's List, TradGang, Stickbow , NJ Hunter, and any archery or hunting related websites, or in the newspapers for sale. The Jackson Police and the BKB club are working off of some possible good leads. 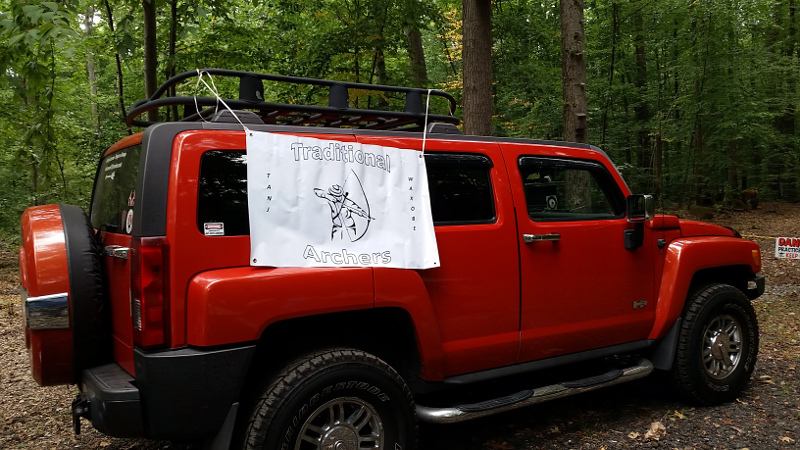 The Black Knights , the Traditional Archers of NJ & the United Bowhunters of NJ are now offering a $1,500 cash reward for information leading to the return of our targets and the arrest and conviction of the thief/thieves. As Always YOUR CONVERSATION WILL BE KEPT CONFIDENTIAL! 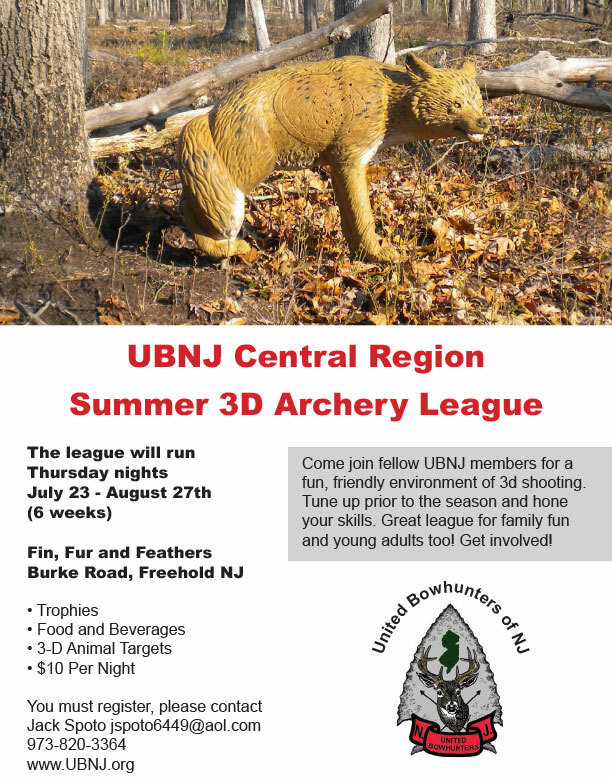 FELLOW ARCHERS! WE NEED YOUR HELP! 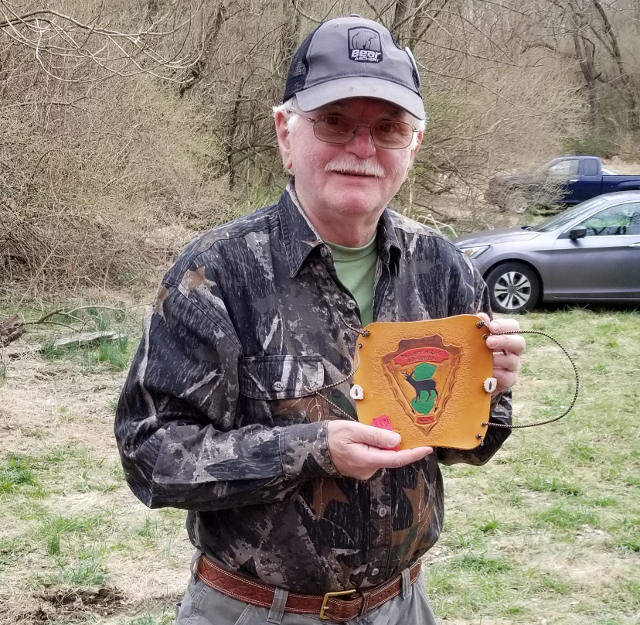 Sometime in the last week, 14 Reinhart 3-D Targets were stolen from the BKB range. 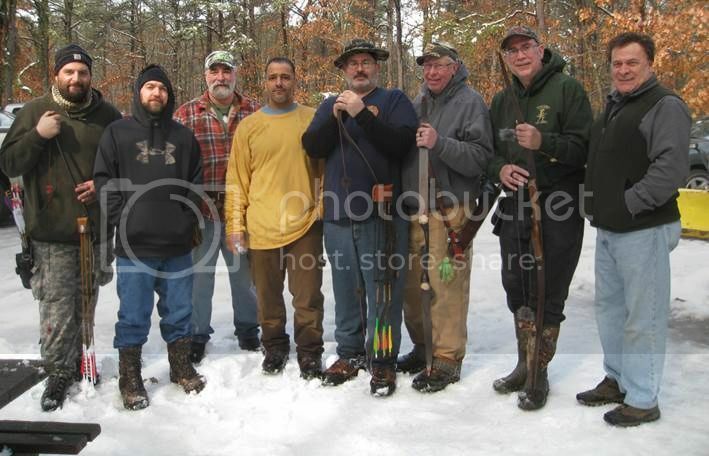 We are reviewing our trail cameras and might have images that could help in the recovery. The Jackson Police and the club are working off of some possible good leads. The Black Knights are offering a $1,000 cash reward for information leading to the return of our targets and the arrest and conviction of the thief. If the targets are returned or dropped off at a location where we can recover them unharmed by Thursday June 4th we will not press charges. The thief could possibly be the same person who stole the Bow Press and maybe even the signage that disappeared last year. YOUR CONVERSATION WILL BE KEPT CONFIDENTIAL! 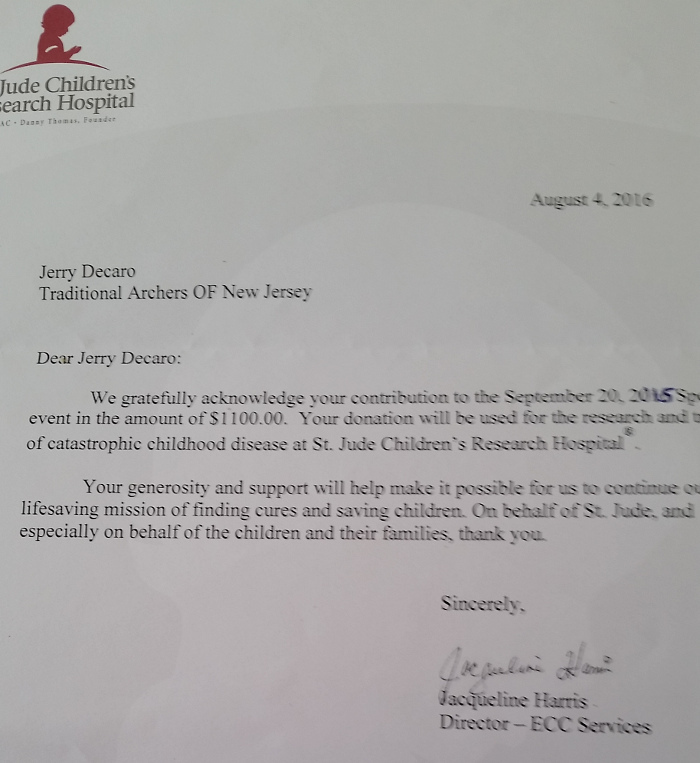 Since 2005, Trad Gang has hosted an auction to raise money for the St. Jude Children's Research Hospital. This hospital and research center is unlike any other pediatric treatment and research facility. Discoveries made here have completely changed how the world treats children with cancer and other catastrophic diseases. With research and patient care under one roof, St. Jude is where some of today's most gifted researchers are able to do science more quickly. 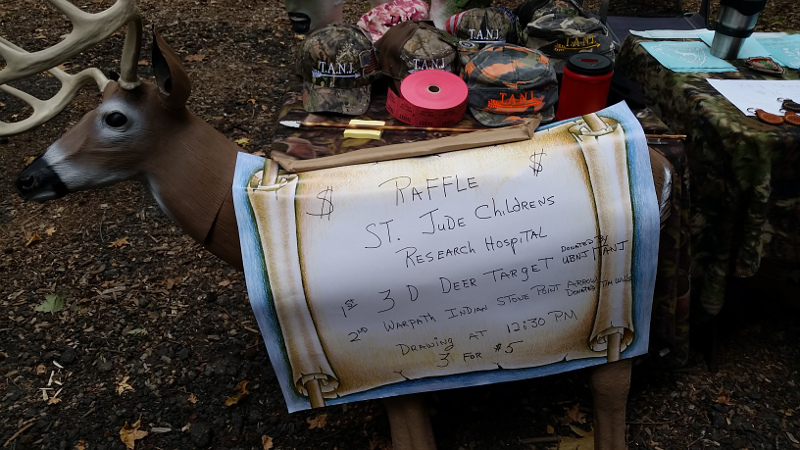 Trad Gang members put up items for auction, will all proceeds going directly to pediatric cancer research - no middle people, direct to where it will help the kids out immediately. 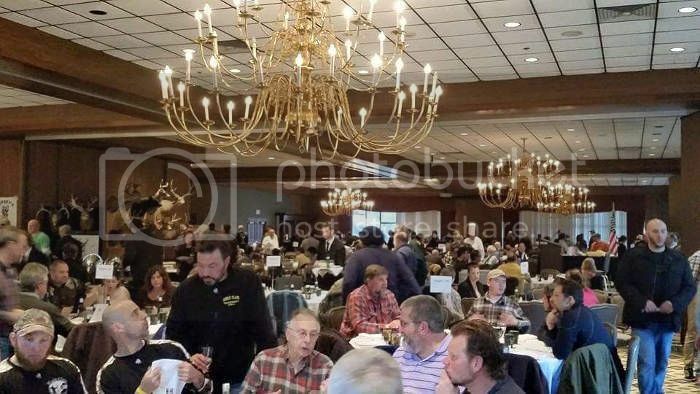 To date, this annual Trad Gang auction has raised nearly one million dollars - we hope to break that mark with this year's auction. 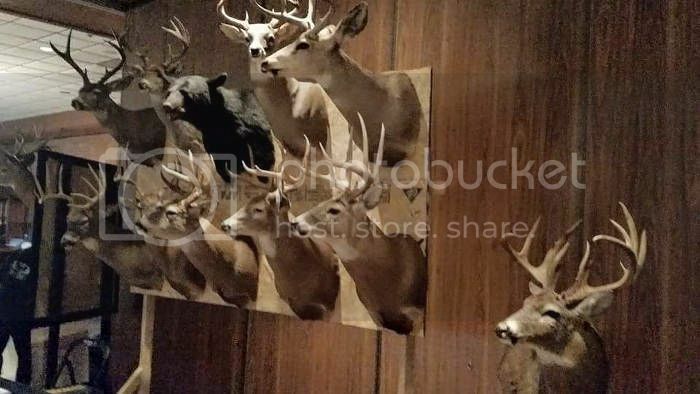 A lot of the auction items are truly Top Shelf, with bows, archery tackle, knives, leather gear, hunt gear, clothing, jewellery, food, and LOTS of other cool stuff that even includes actual hunts up for auction bidding! It's easy to bid on items. 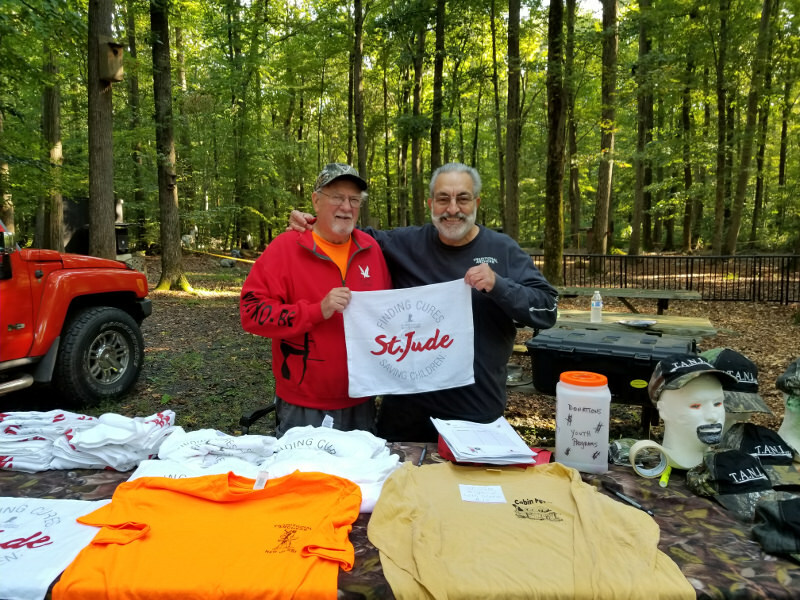 First, join Trad Gang - it's free with no strings attached (well, except for your trad bowstring :) - login, scroll down a bit to see the St. Jude Auction banner, click on HERE, that will take you to the St Jude Auction Forum, login with your Trad Gang login, check out all four bid forums, pick out an item, make a reply post with your bid amount. Some of the deals are just awesome, but remember that this is ALL for the KIDS, so bid often and bid high! 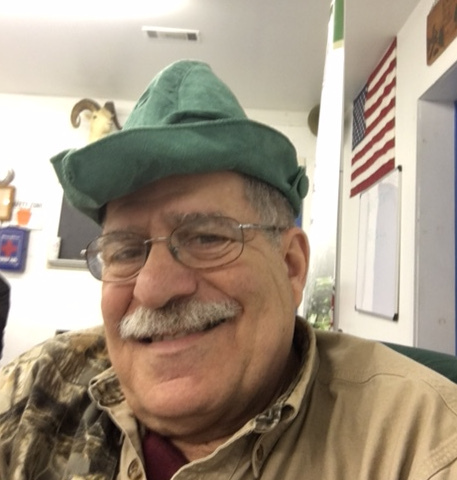 Contact Rob if you need assistance in joining Trad Gang or logging into the forums or bidding at the auction. Bid forums are NOW OPEN for bidding! The BID forums CLOSE June 4th, 5th, 6th, and 7th at 10:00 PM - bids must be time stamped 9:59pm to count! 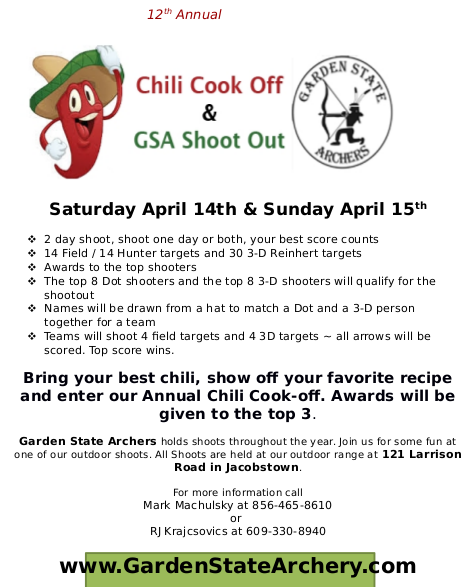 September 2015 will be our second Anniversary of Shooters being open and we have been trying to figure out what to do to celebrate. 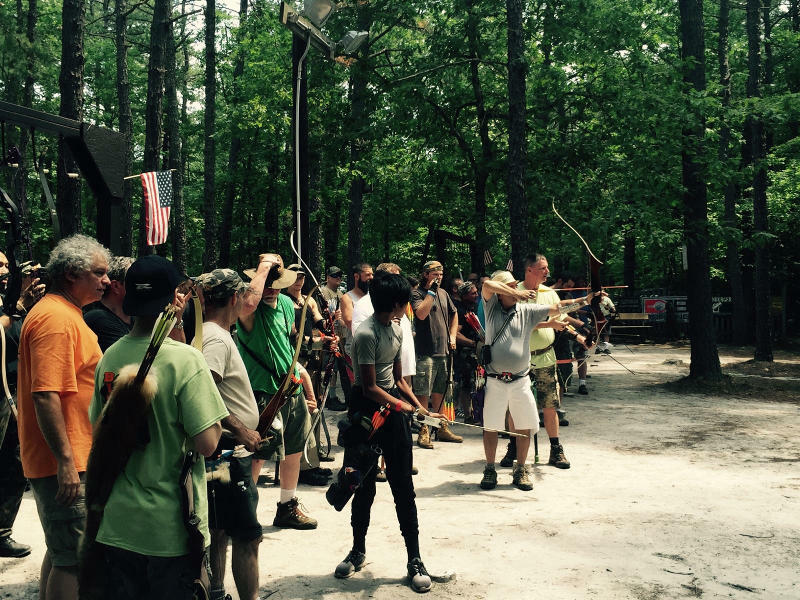 We have decided to host a hunters weekend August 8th and 9th (Saturday and Sunday)! 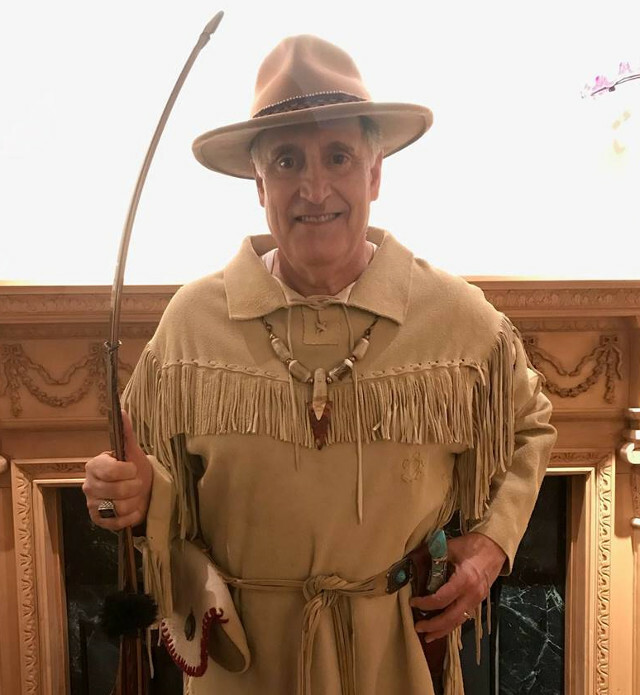 Byron Ferguson will be doing 2 expeditions per day during the event. We will also have many manufactures present. 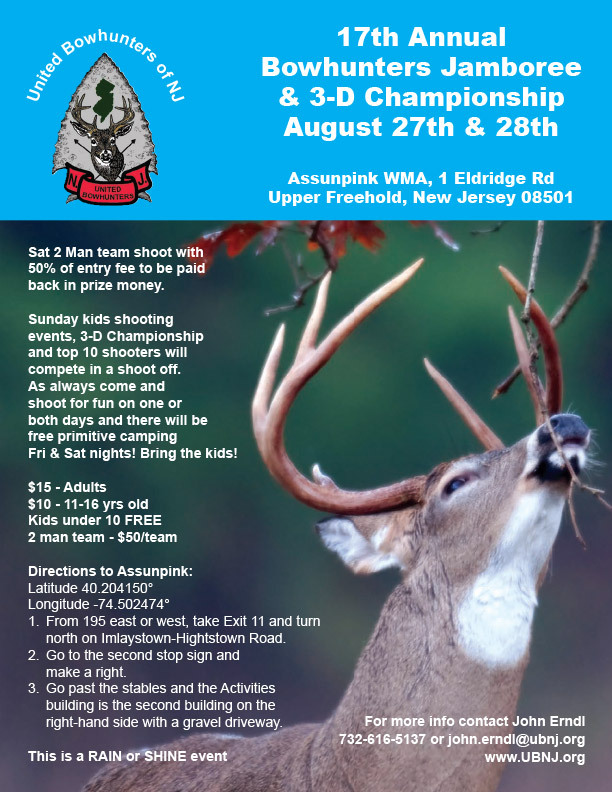 (Hoyt, Mathews, Bear Archery, Elite, Bowtech, Antler Ice) There will be sidewalk sales, and many in-store sales going on that weekend, not just archery, firearms and clothing too. 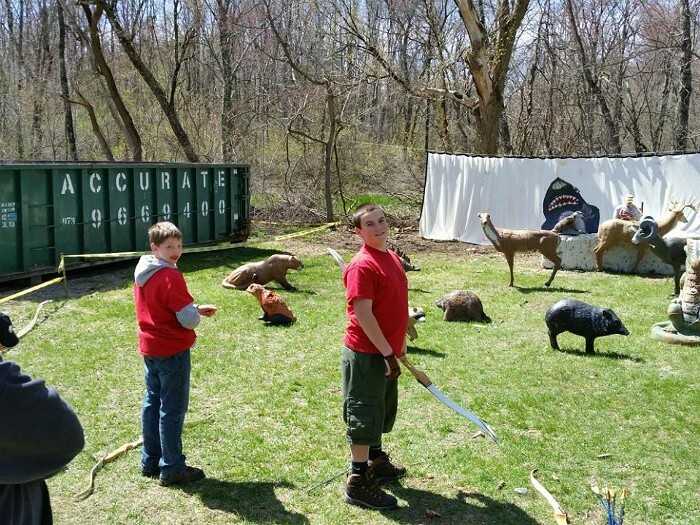 We also offer archery birthday party 's here at Shooters. 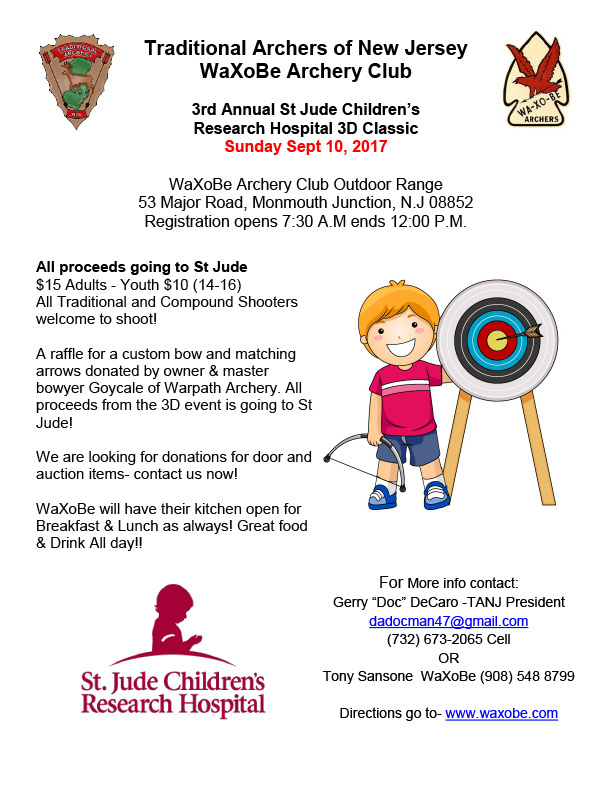 For $250.00 you child can have 15 of their friends enjoy two hours of archery fun. I have included the flyer for that also. 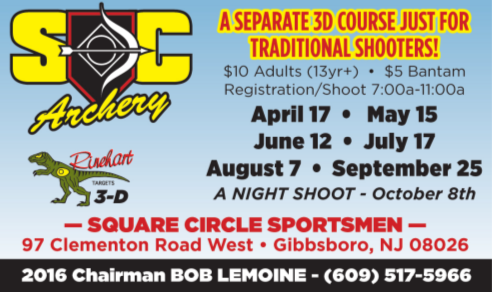 Shooters also offers private and group lessons from Level 2 Certified Archery Instructors. $60.00 per hour for an individual lesson or for up to 4 persons. Please let me know if you want anymore information. Also, I will keep you up to date on information in the event as I get it! 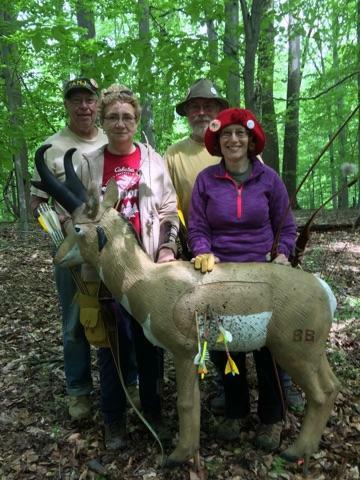 TANJ member Dorie Tully, wife of Gutyanker Mike T, attended her first camp away 3D shoot, attending the Baltimore Classic this past May 16th & 17th weekend. 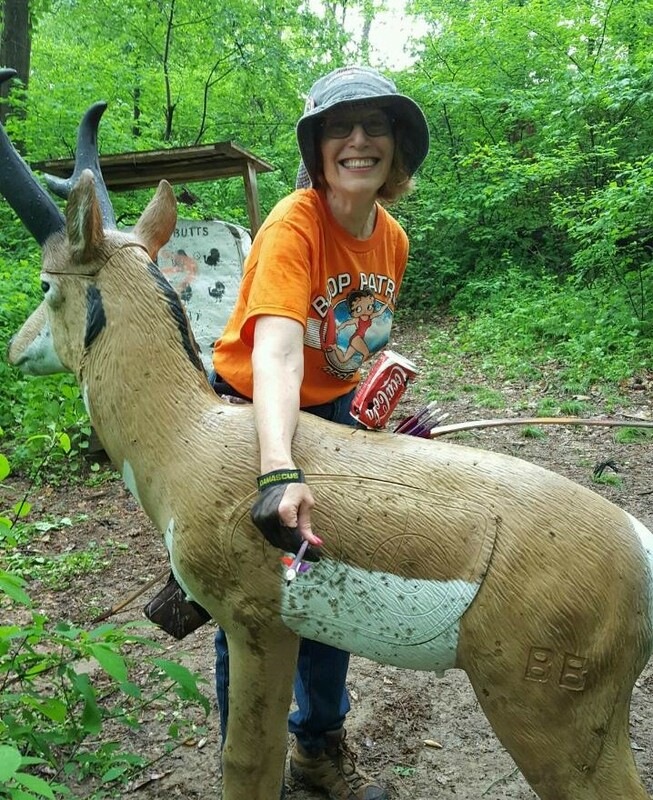 At the end of the day she made this 50 yard 10x ring shot with her new longbow and cannot wait for her next 3D shoot. 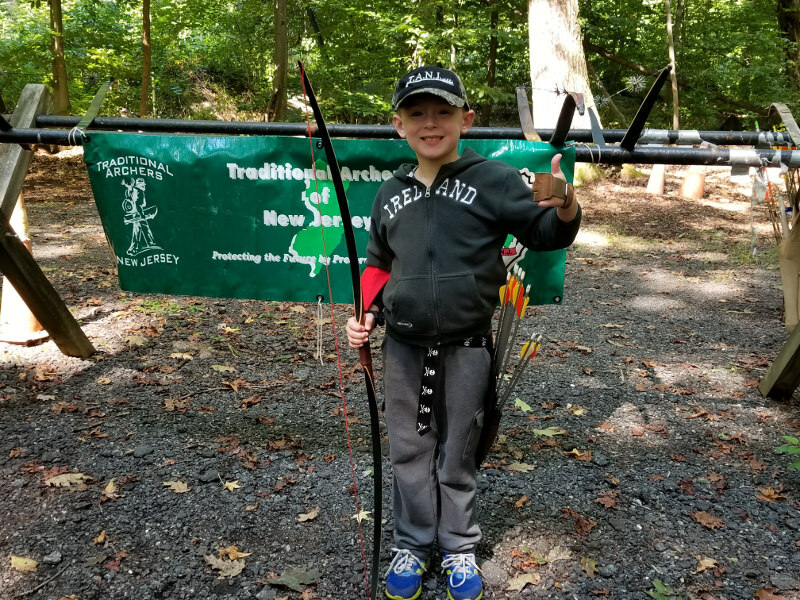 Overpeck Park, Palisades Park, N.J.
Oak Ridge Road, Clark, N.J.
Last week, two traditional recurve bows were donated to two students in need of archery equipment by the Gutyankers! 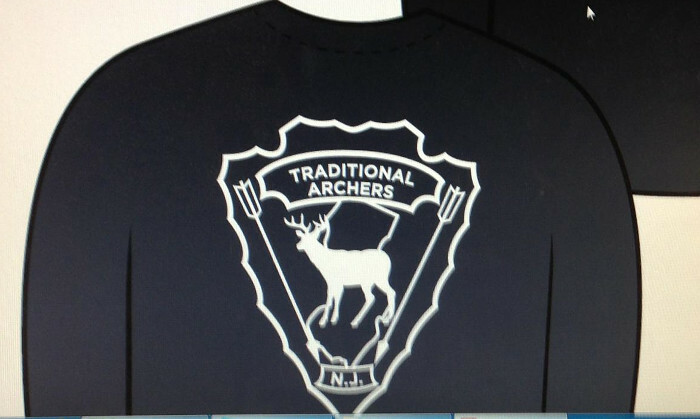 The request was made to the Traditional Archers of New Jersey couple weeks ago, who then passed it on to the Gutyankers. 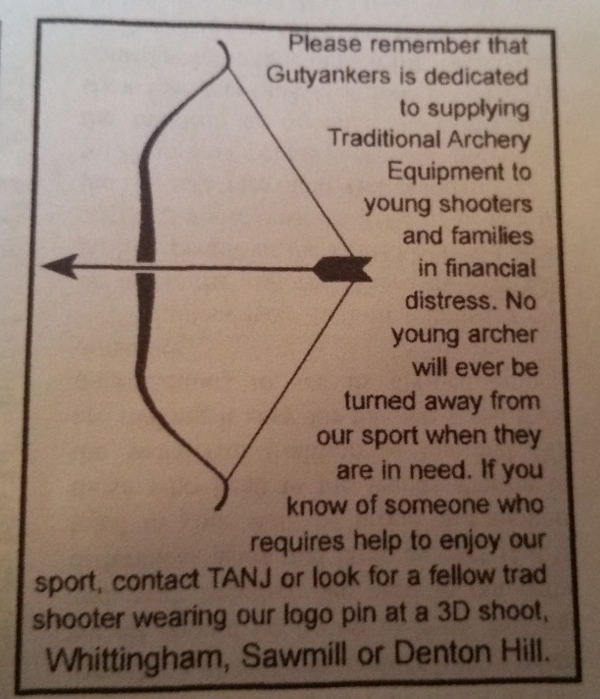 Who are these "Gutyanker" guys? 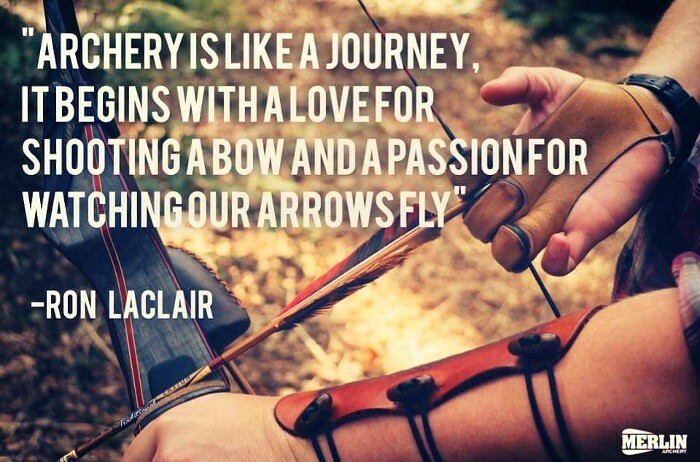 This is a question that we get quite a bit from our fellow archers. Well, the story behind the answer and funny name is really quite simple and serious in its goal. It started 6 years ago during the Denton Hill ETAR, at the start of the worst recession since the 1930's (or was it a depression?). I will let you readers sort that out. 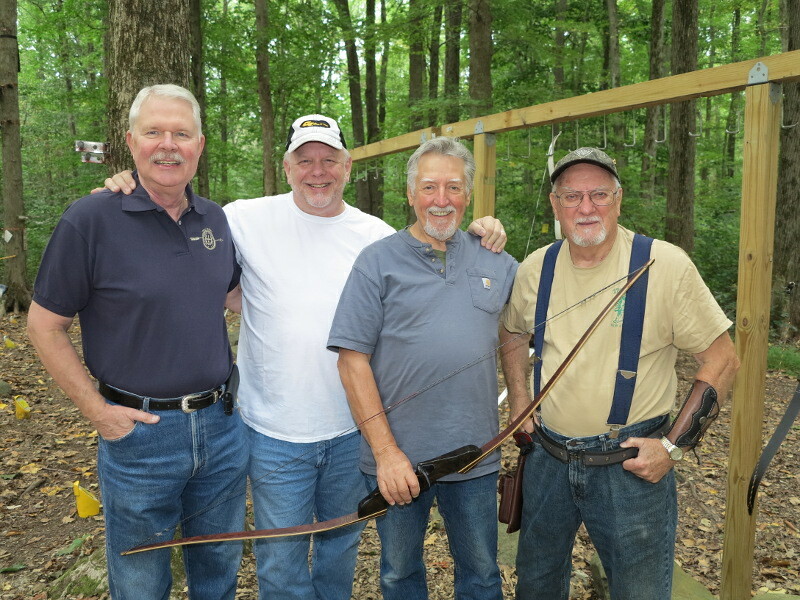 Five traditional archers, members of TANJ, were sitting around their camp fire and watching the shooters on the practice range "under the lights". 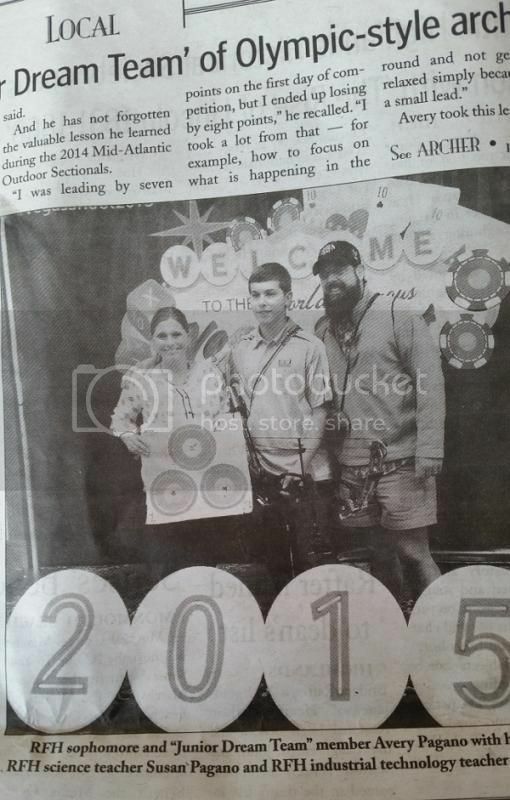 They noticed the youth shooters were in greater attendance and speculated on the cost of a real vacation being out of reach this year for some folks and $4.00 per/gal gas at the pumps did not help. Watching the future 3-D archers practicing their skills until the lights went out was fantastic! 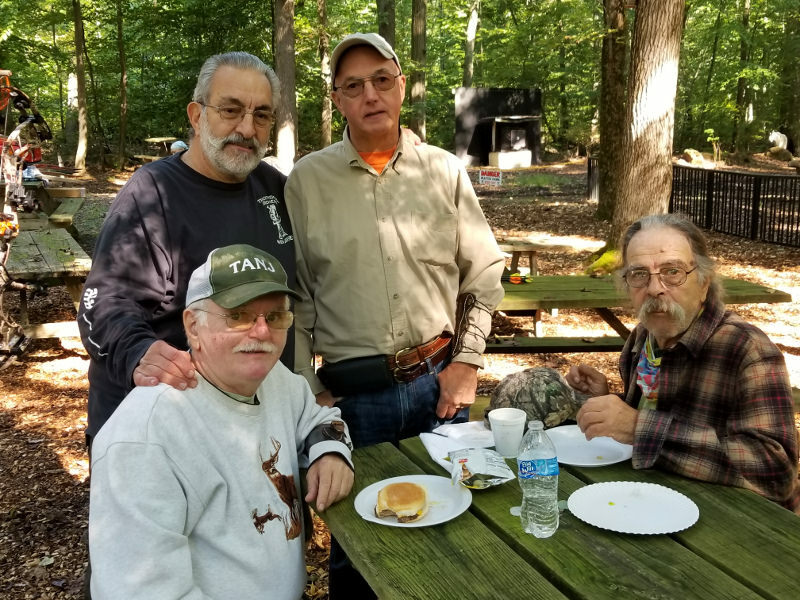 We felt sure that our way of life, hunting, shooting and family camping would continue unaffected by the pink slip tide in the outside world. We were wrong. The flow of the range was off. 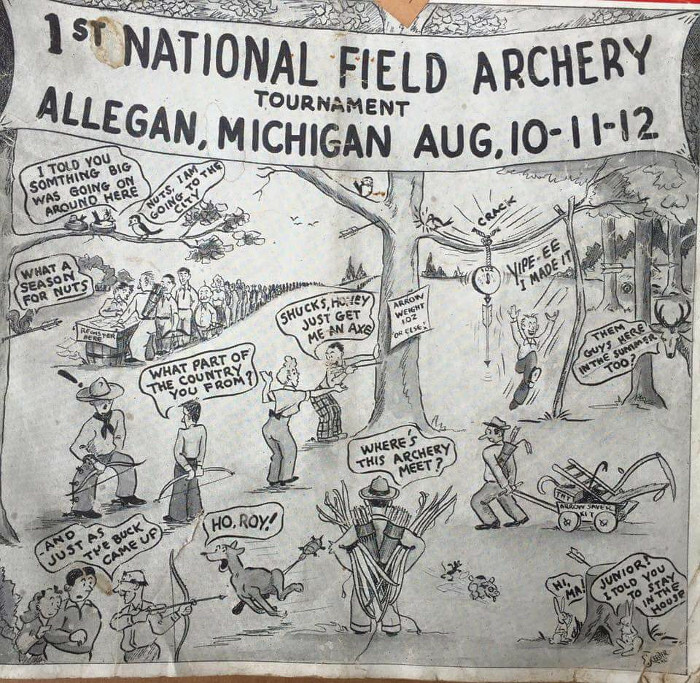 You know what I mean - some kids shot an arrow or two then waited for others to shoot a full end of shafts or handed their bows to a second archer who shot one or two shots. 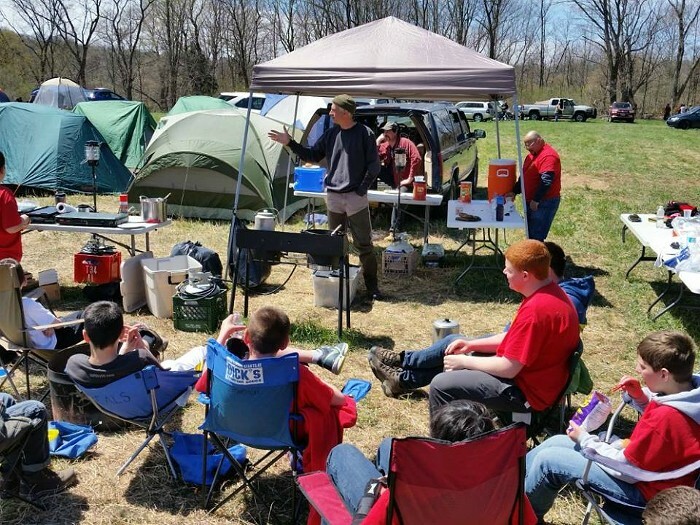 The problem was obvious for the campfire observers. Too many kids and not enough basic equipment to go around! The recession had reached us. 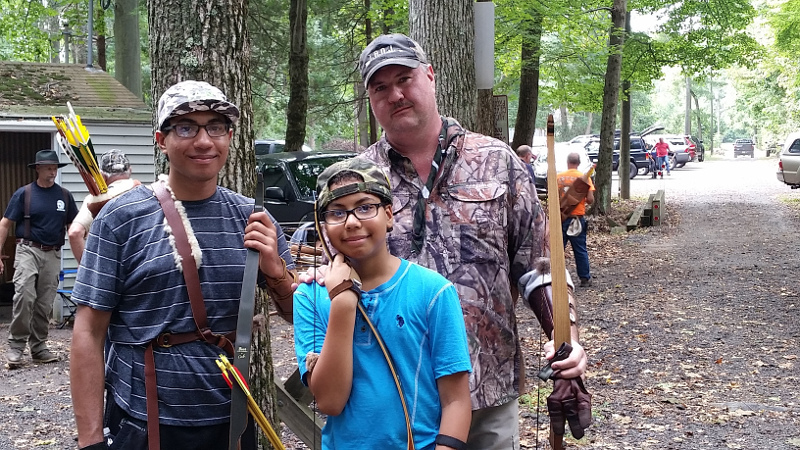 For the next few days the conversation focused on the problem of youth archers subjected to the effects of Dad and Mom being out of work, single Moms and Dads trying to make ends meet and the poor condition of some of the bows and arrows being shot. 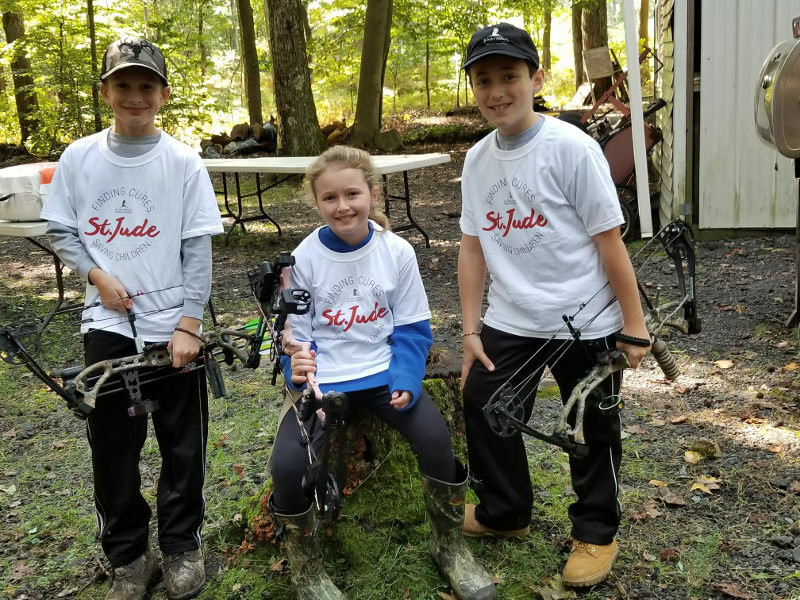 The kids still had fun but where was the future in 3-D, Field and FITA if they out grew the old arrows and bows next year? 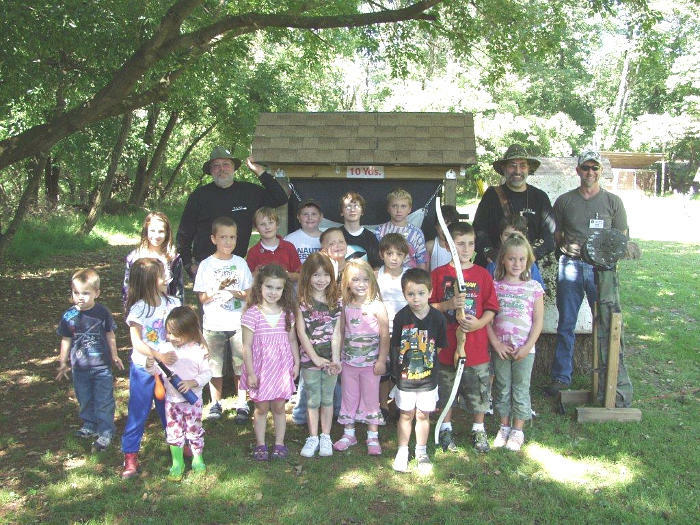 How many kids did not have a bow or arrows, but had a true desire to be with their friends on the 3-D line? 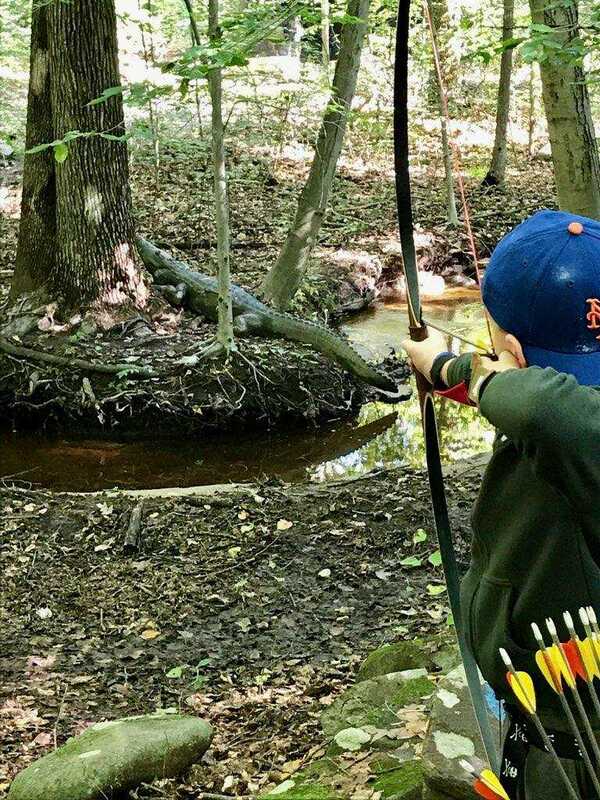 Someone said that when he watched the kids yanking back on the cat gut string of long bow, he remembered the joy of shooting his first stick bow so many years earlier. Yanking back a gut string? Hummmmmmmmmmm. With that said, the five archers made a promise with a toast of spirits, and the shadows of an ETAR fire. 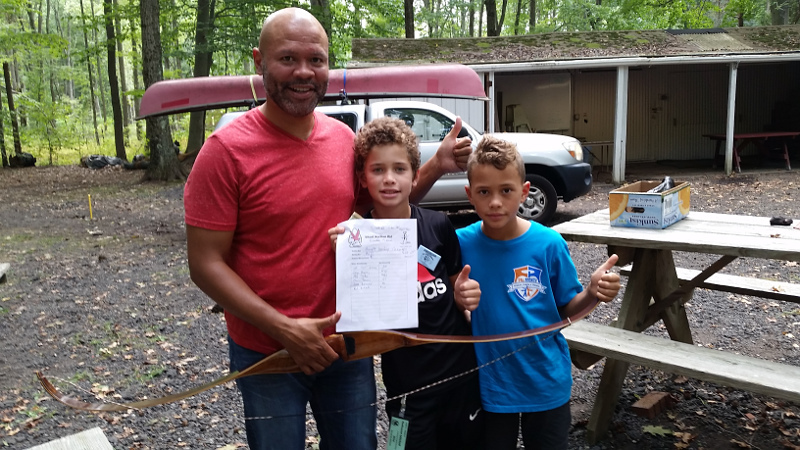 No young archer will ever be denied our sport due to financial hardship at home. Period. 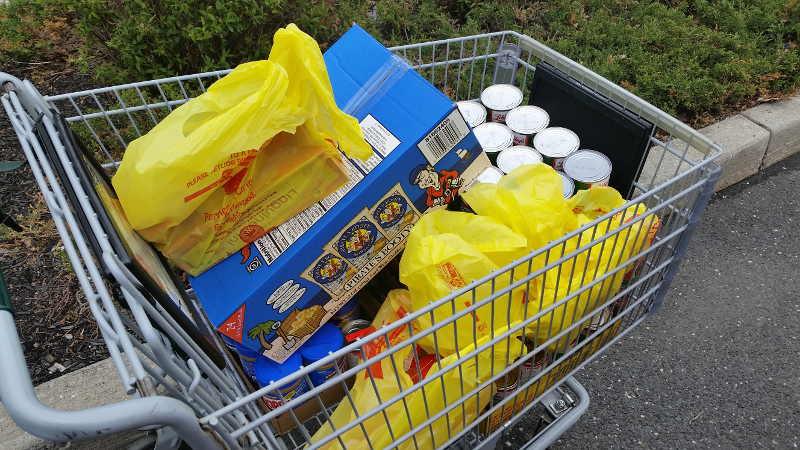 So it started - moneys were collected and donated at the shoots from Garden State, Farmers, Black Knights, Bent Creek, Wa-XO-BE, Oak Ridge, Lincoln Park, Whittingham, Sawmill, Baltimore, ETAR and so many others. 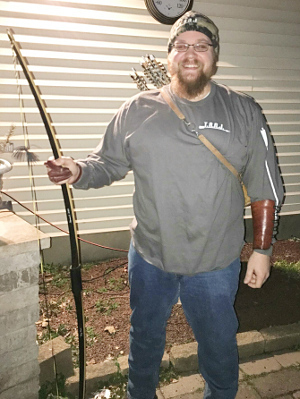 Over the last 6 years over 40 sets of bows, arrows, gloves and arm guards have been given at Christmas, birthdays, and to just plain kids in need. We never solicit funds. 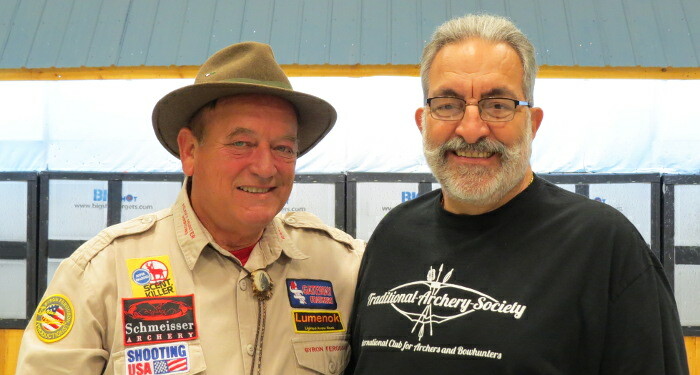 If you believe as we do, watch for a brother archer wearing our pin on their hat or quiver at the shoots. 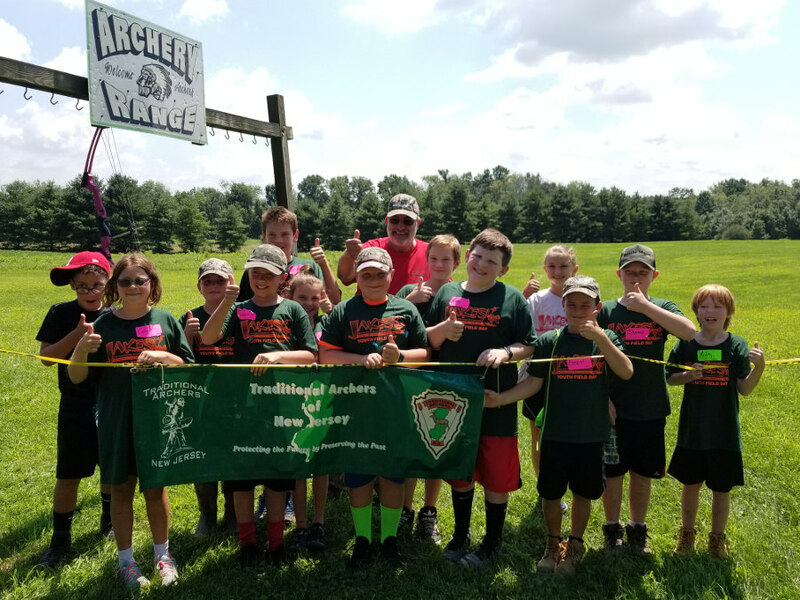 Anything you do give will go directly to youth archery equipment and you get a hat pin with our logo. If you know of a kid in need please pass the information to us or TANJ and we will make things happen! Hey, that's a Denton Hill promise!! 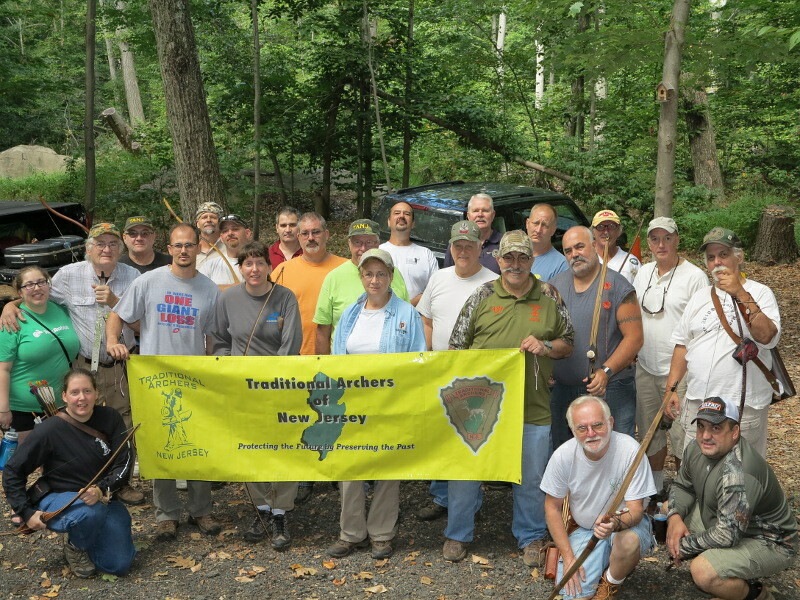 A group of great Traditional Archers that are members of The Traditional Archers of NJ. 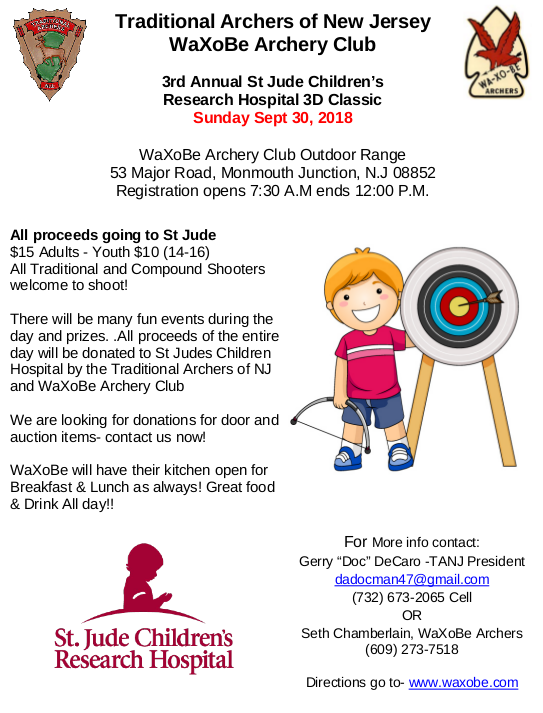 53 Major Road, Monmouth Junction, N.J ~ www.waxobe.com for directions! 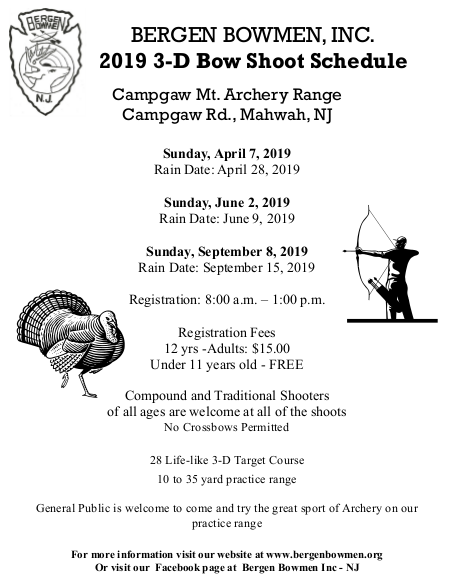 Registration opens 7:30 A.M ends 12:30 P.M.
Don’t forget as always Archery & Outdoor Flea Market Sale - Equipment to sell or barter at no charge, free to all! 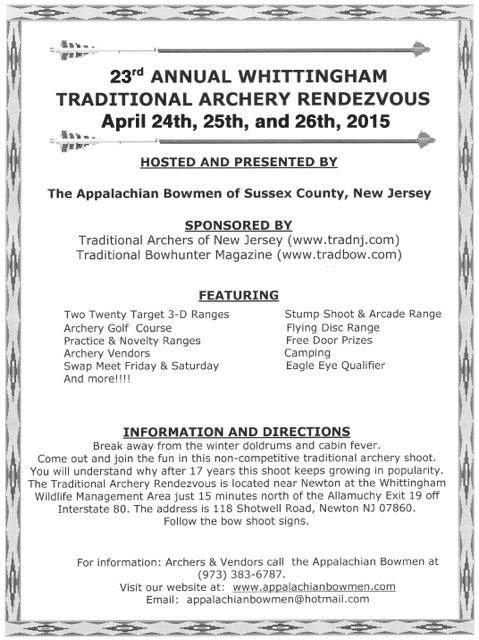 All Archers must register in order to shoot sell or barter! TANJ Long Sleeve Black Shirts are back in stock!!! 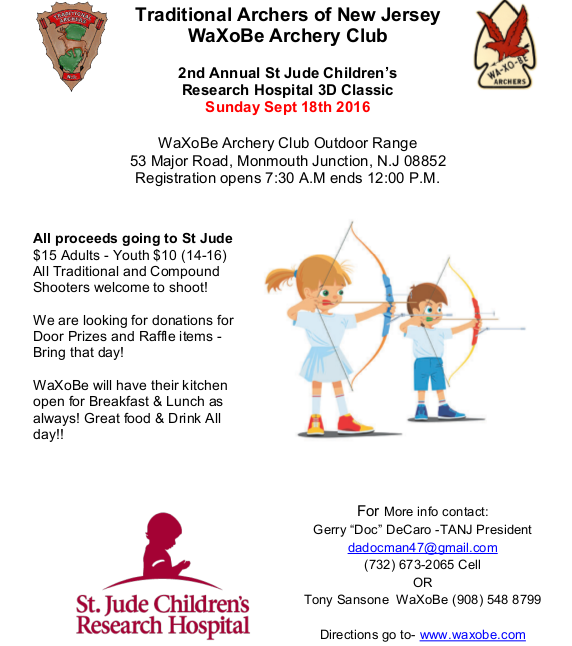 WaXoBe will have their kitchen open for Breakfast & Lunch as always! Great food & Drink! 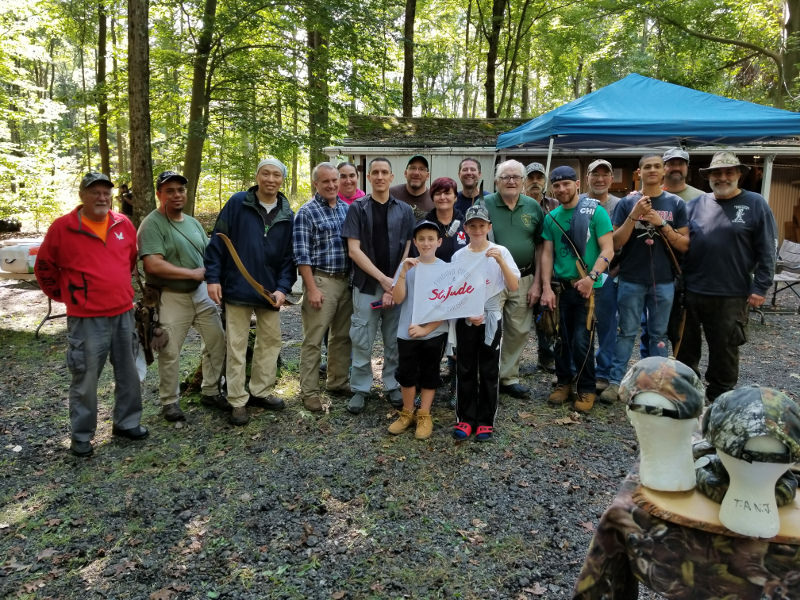 This was at the SCFGPA Somerset County Fish and Game Protective Association Archery Range Bridgewater, N.J., with Range Officer John Zampini along with GutYanker Mike Tully and TANJ Doc DeCaro at their Youth Archery Day. 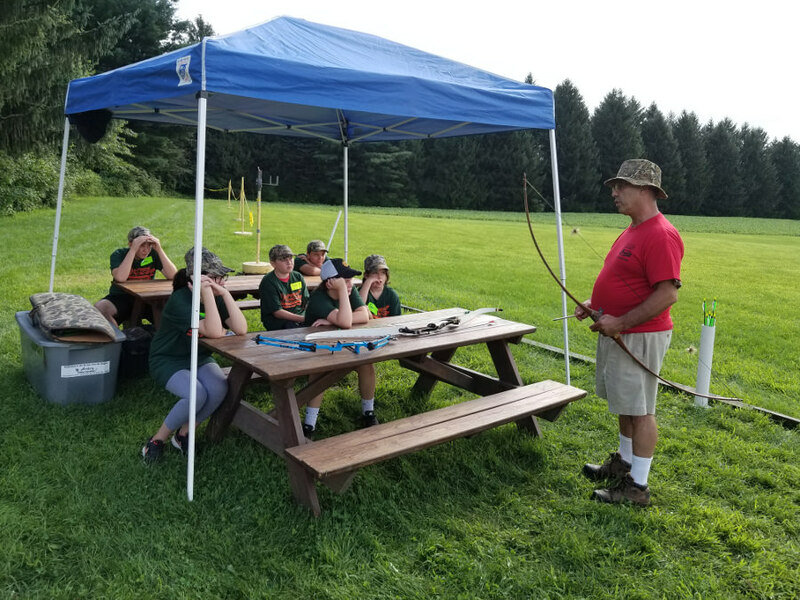 TANJ & the Appalachian Bowmen of Sussex County sponsored the 17 Scouts from Troop 34, Jackson throughout the Whittingham Traditional Rendezvous weekend along with our lender archery equipment. We had special archery related classes over the weekend held by TANJ members Mike Tully, Phil Muller & myself. 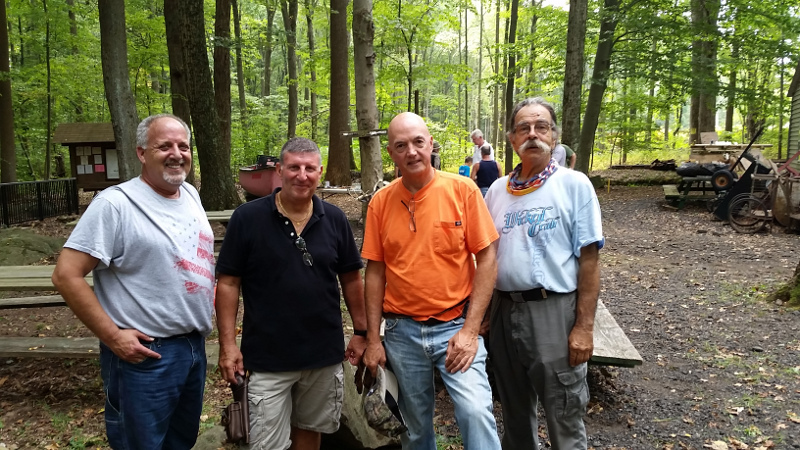 We like to thank TANJ member Mark Dreyfus Asst Scout Master for arranging and supervising the scouts the entire weekend making sure they were safe but most of all having a great time camping and learning the Art of Archery. God Bless Our Youth They are Our Future! 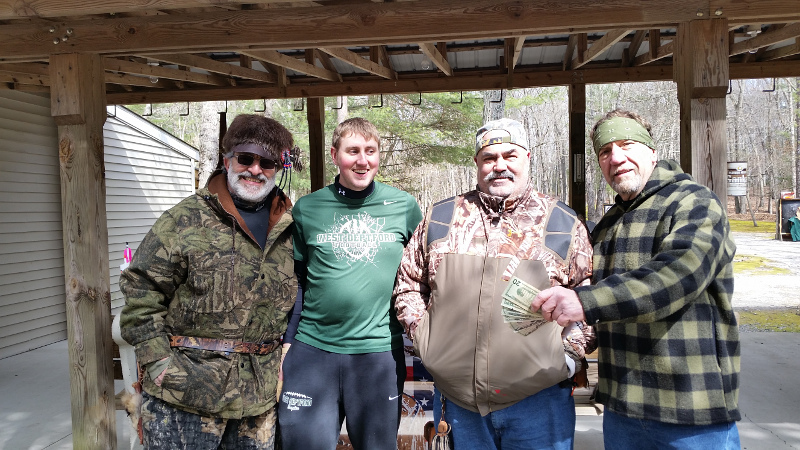 The Grand Prize for the Annual TANJ Texas Wac Um contest was an Allegheny Mtn. 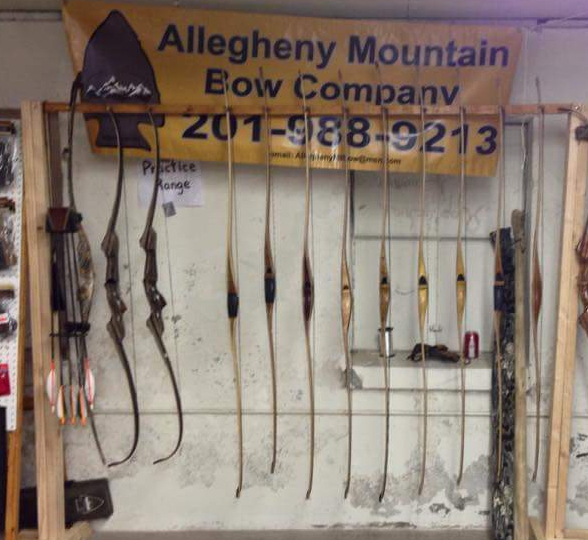 60" Mountain Bow, Brown Action Wood Riser, Zebrawood Limbs, 48#@28". 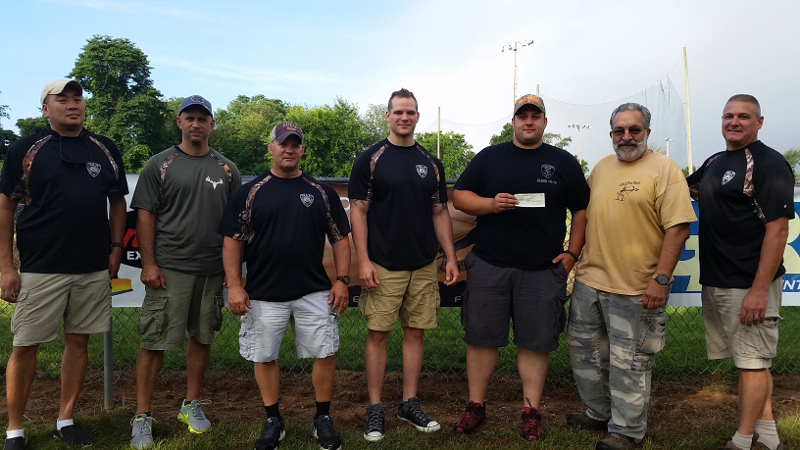 Value $450 which was donated by TANJ member Jeff Strauss. 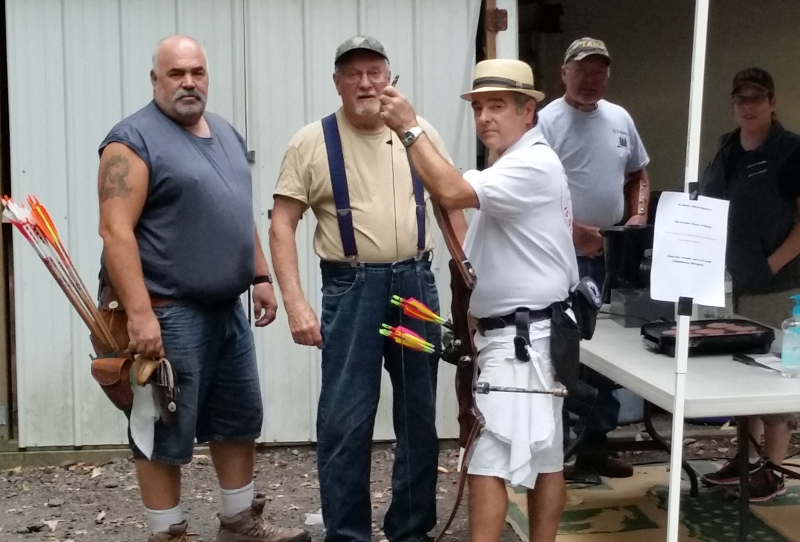 The winner was John Hoinowski and over 134 archers were in the competition. 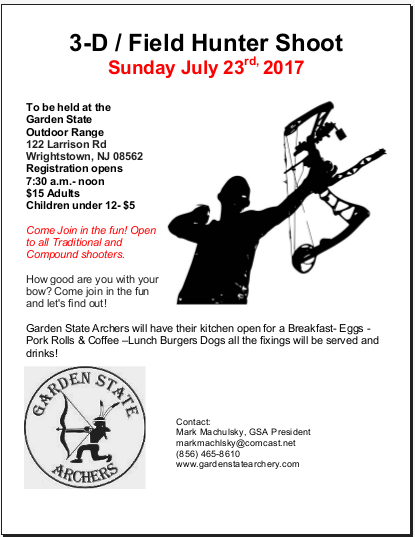 All monies raised will be donated to the Handicap Olympic style games that will be held in Mid July at Oakwood NJ, in Union County. 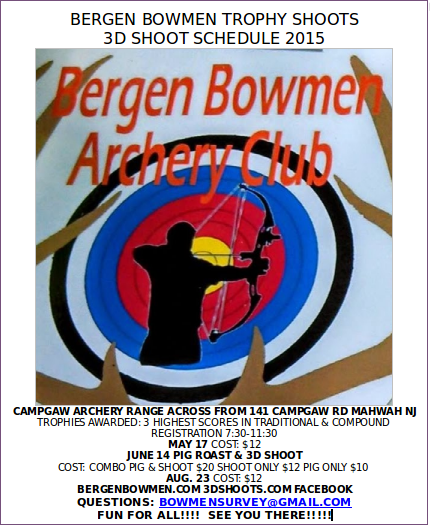 The Archery competition event will be held on July 18th & 19th, 2015. 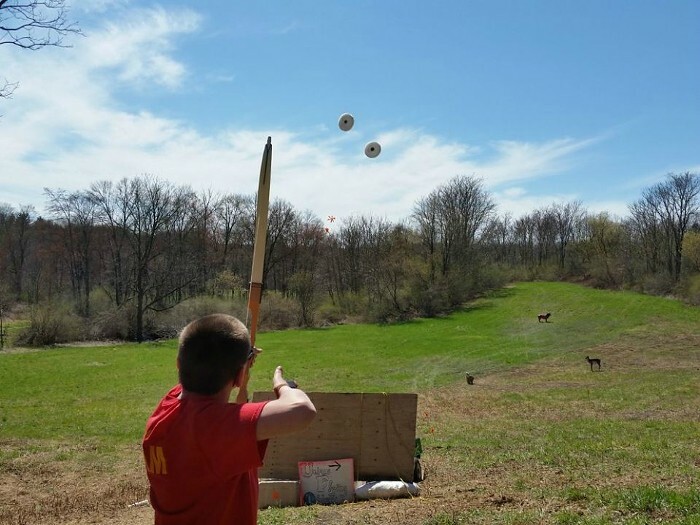 They are expecting at least 500 handicap kids to compete from around the U.S. during the entire week. 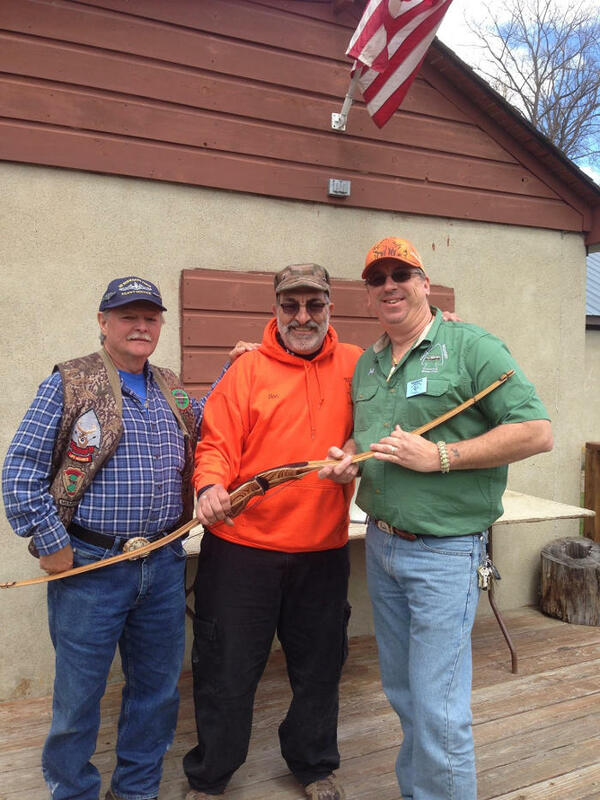 Al Klenk, Doc DeCaro, Jeff (FaFa) Strauss posing with the Allegheny Mtn Bow that John Hoinowski won which was donated by Bowyer & Owner Jeff Strauss. 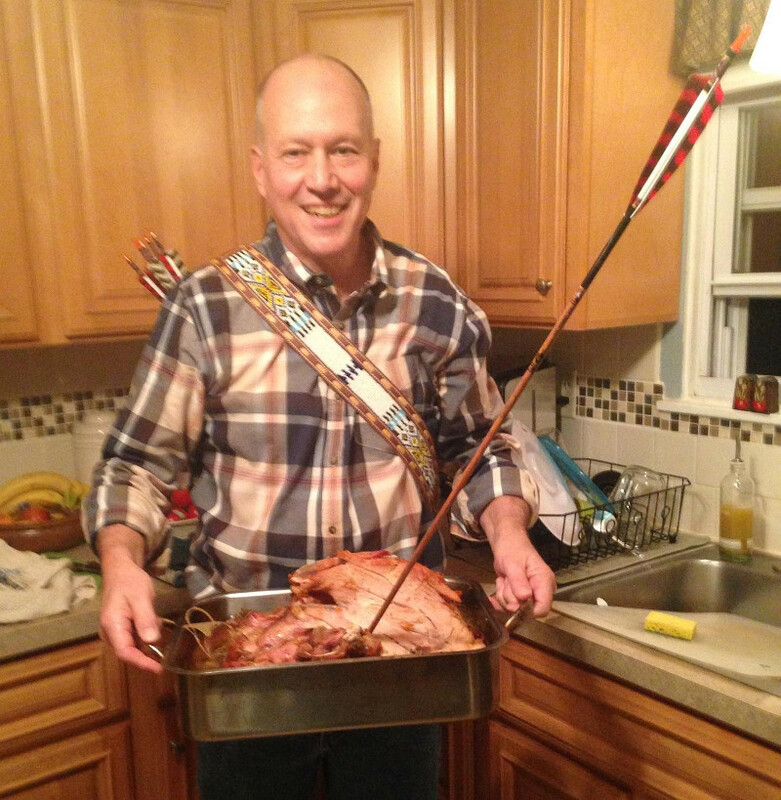 Jeff has been donating a bow for our contest as the Grand Prize for the last 7 years. 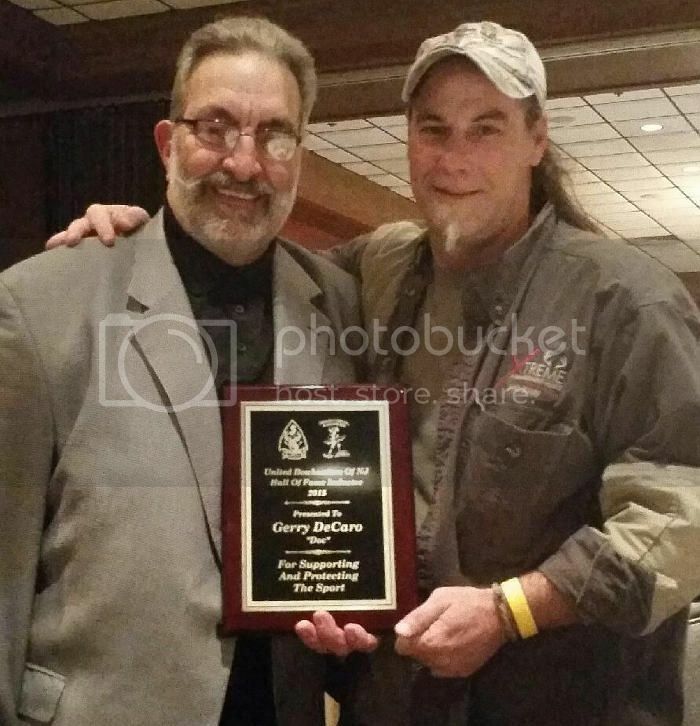 Gerry "Doc" DeCaro and John Erndl were inducted into the NJ Bowhunters Hall of Fame at the 11th Annual Bowhunters Game Dinner last month. 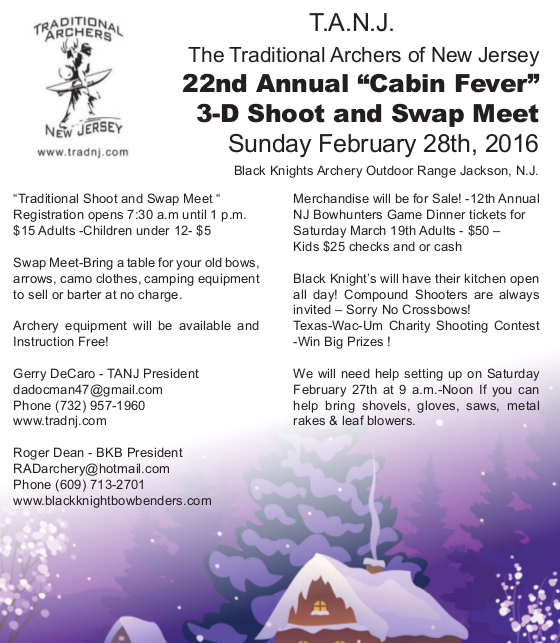 Doc is President of TANJ and John is President of UBNJ, and both are Members of Black Knight Bowbenders. 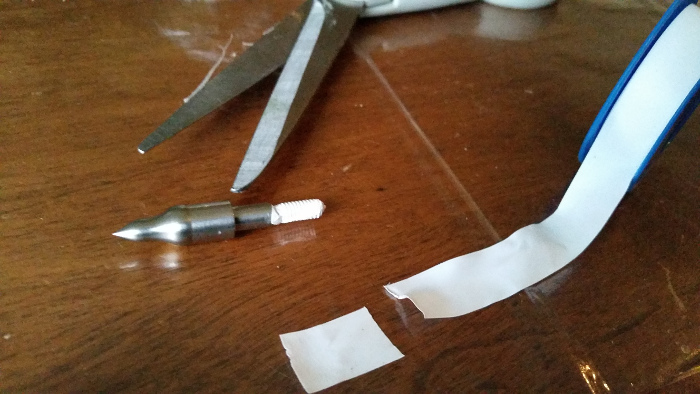 If you're having a problem with your screw-in arrow tip points becoming loose during your shooting, just use a little teflon pipe thread tape - cut half inch piece, wrap around thread, and screw back onto arrow ... and the problem is solved! 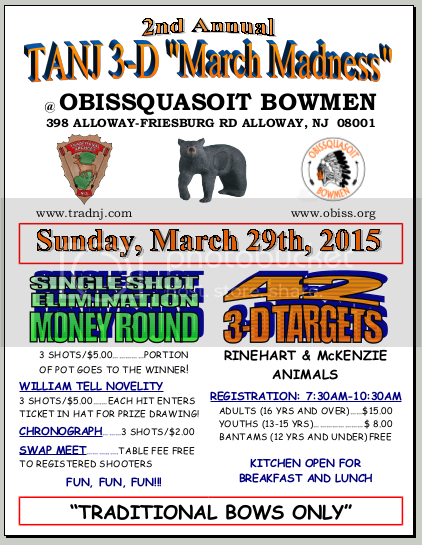 Obiss has put all the TANJ/OBISS 2nd Annual March Madness day in a picture slide show. 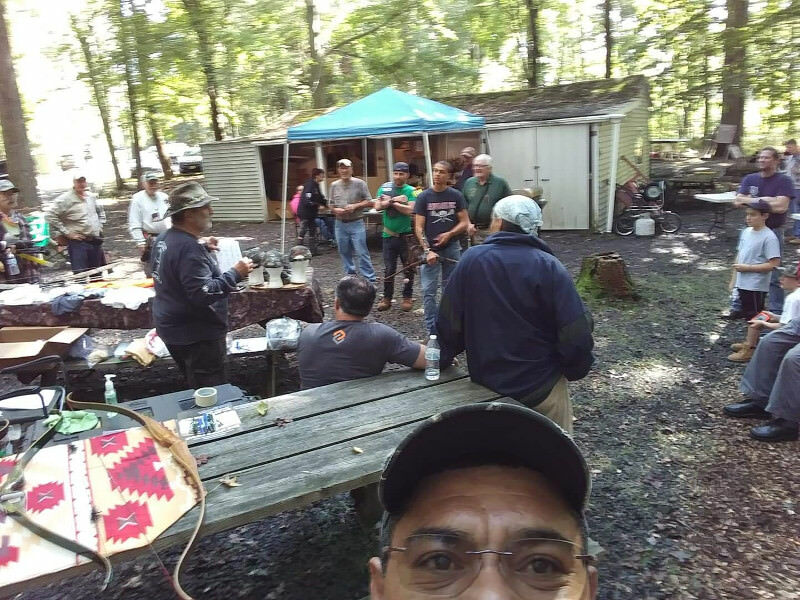 Thank You for a great time and pictures to - Howard Neide President Obissquasoit Bowmen & Pete Dave Onesti Charlie Meyers and all its members. 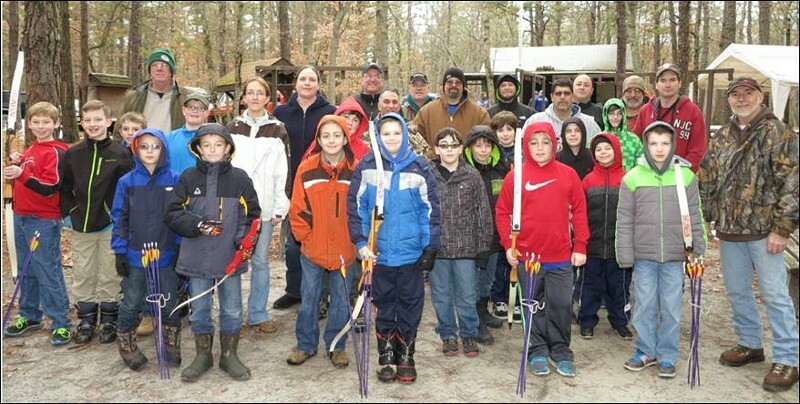 TANJ and Black Knight membership helped the Jackson & New Egypt Boy Scouts learn the Art of Archery for their "Arrow of Light" Ceremony. 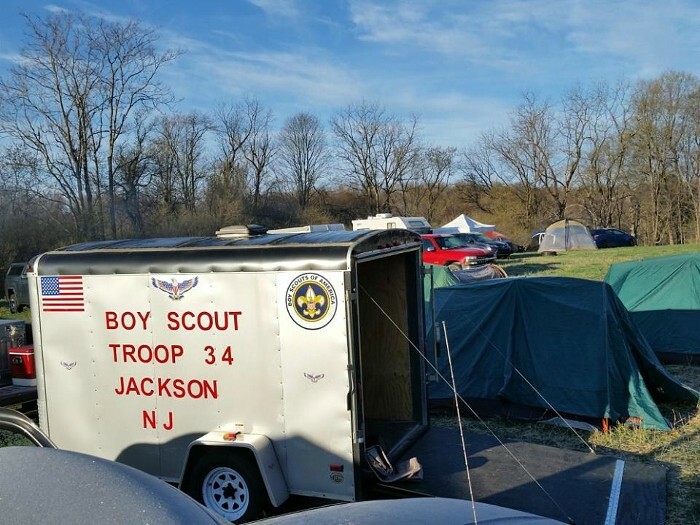 This is where the Cub Scouts cross over to Boy Scouts. 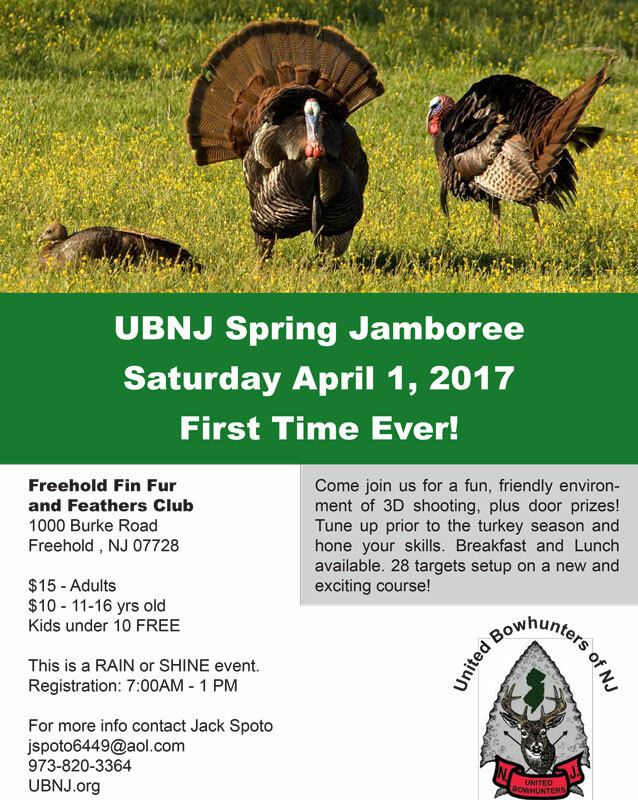 It was held the Sunday right after the NJ Bowhunters Game Dinner at 10am. 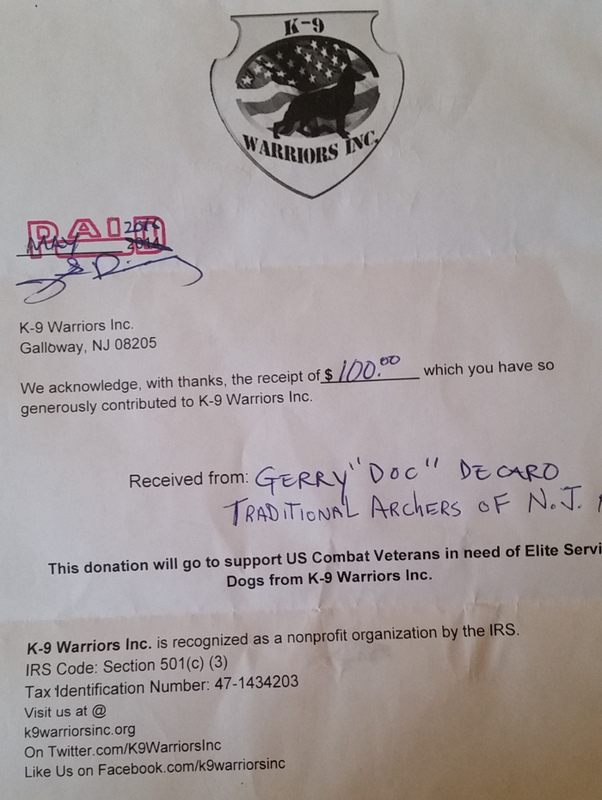 It was a great group of kids, and what we do is to support our youth. It was 4 hours of non stop fun. 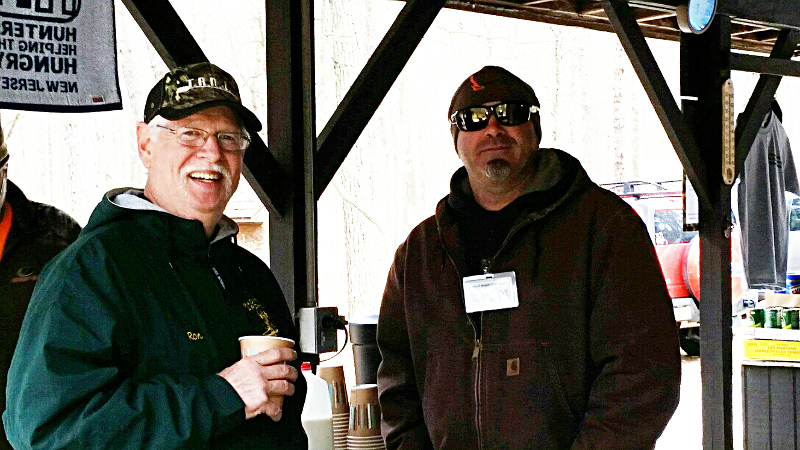 Bud Thomas & Gene Grodzki were the coordinators and did a great job. 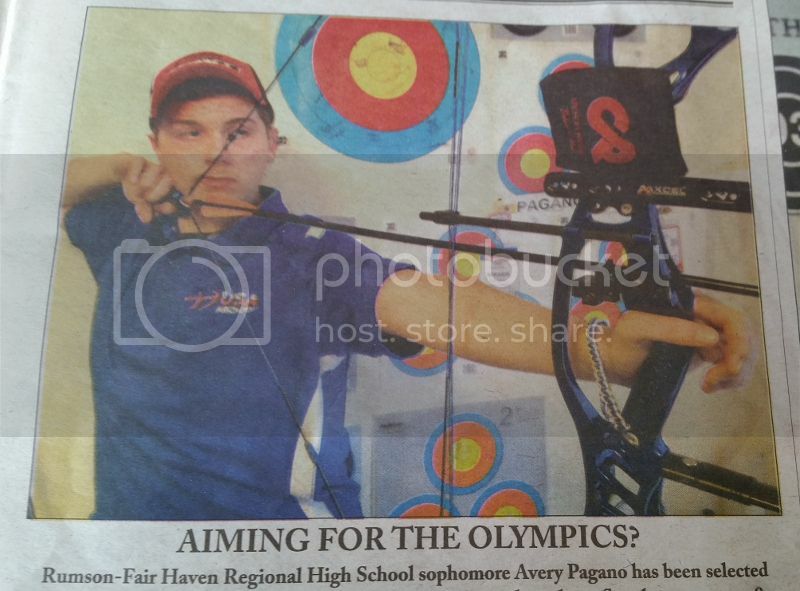 Dino Pagano's son Avery Pagano makes the Junior Dream Team consisting of the most promising junior and cadet Olympic archers in the country and now will attend Olympic Training Center. 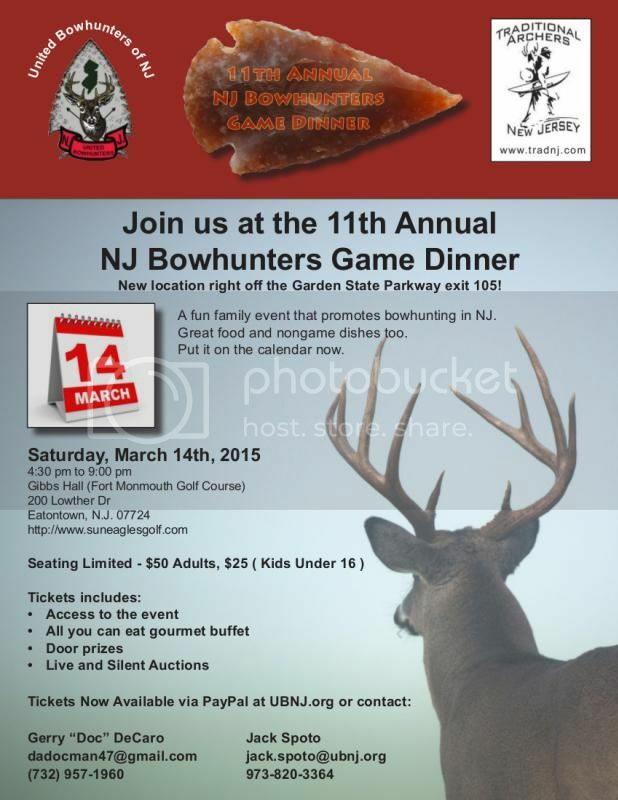 Story in the Rumson Patch and/or Monmouth Journal (March 6th). 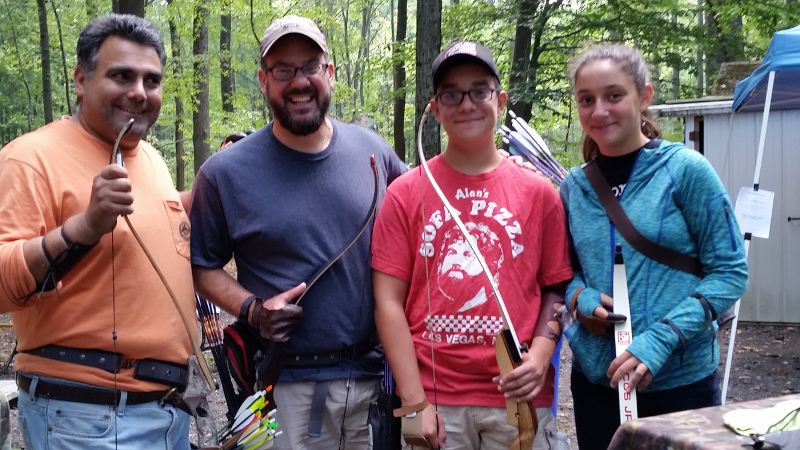 The Pagano family TANJ members shoot at the BKB all the time. !!! 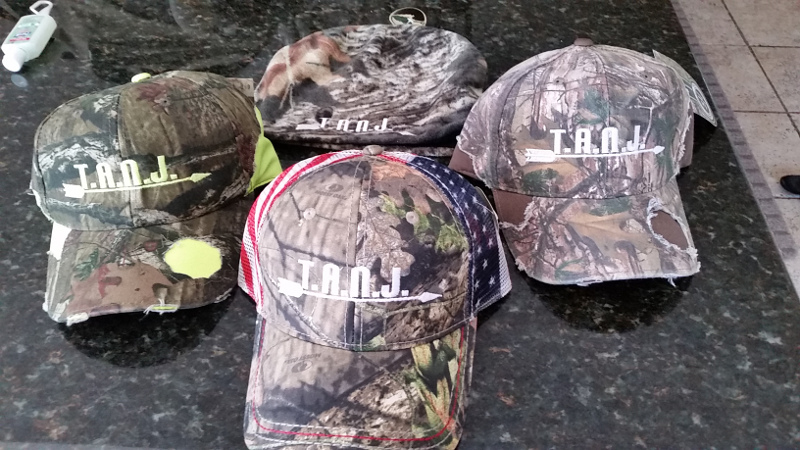 SPECIAL TANJ MEMBERSHIP SALE !!! 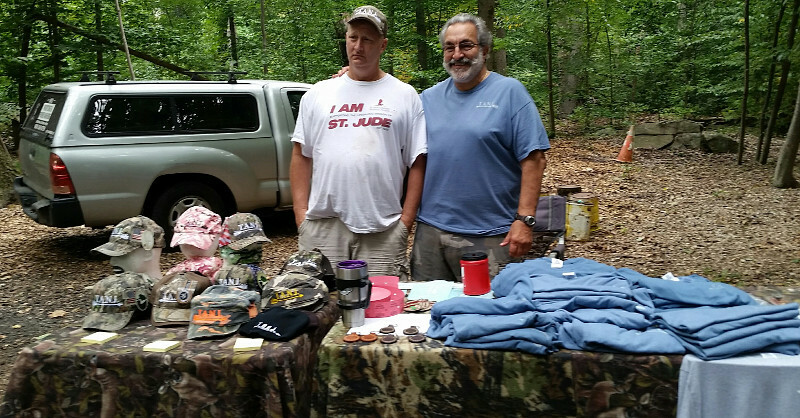 Mountain Mikes (Sig Borstads former shop) will take 25% OFF ANY IN-STOCK 3D AND ALL BAG TARGET FOR TANJ MEMBERS. This sale will be valid now till April 31st, 2015. 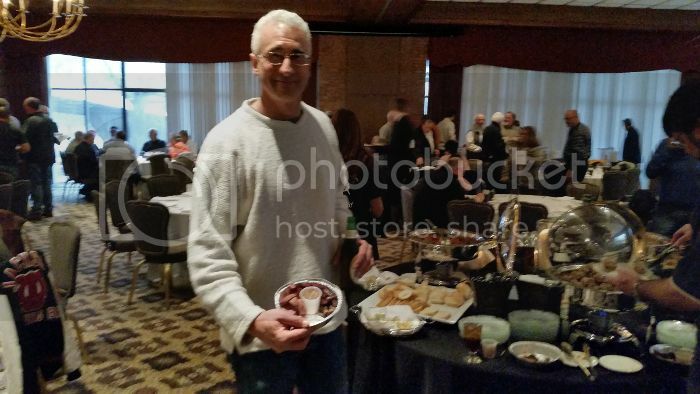 Please bring your 2015 TANJ membership card. The Man, the Myth, and now ... the Legend! magazine's April/May 2015 issue, and he wins the CRKT knife! 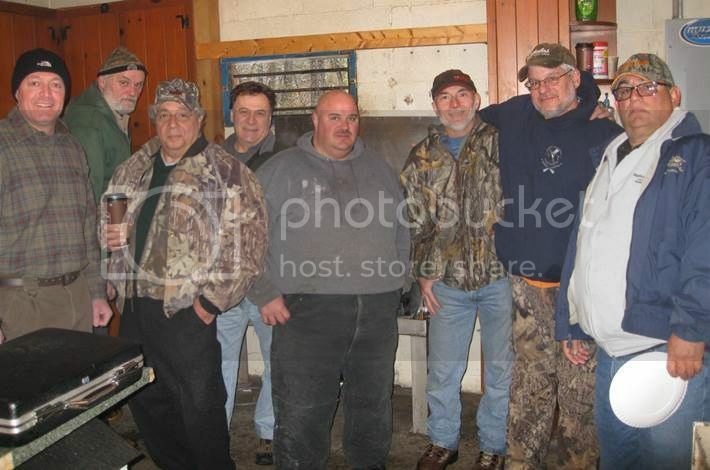 The Cabin Fever weekend was a blast! On Saturday we had over 30 BKB & TANJ members show up for the pre Cabin Fever Work party and on Sunday many of the same folks came to shoot and to lend a hand. 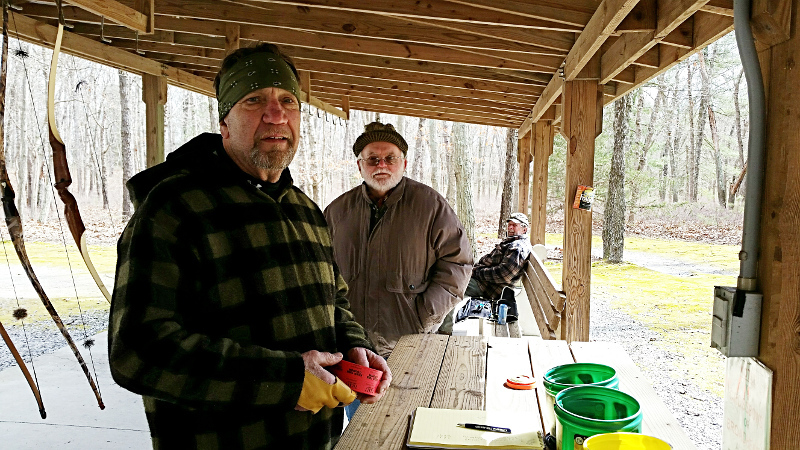 Despite the insane weather and snow we had 57 shooters on Sunday. It was cold but there was a nice break in the weather both Saturday and Sunday. 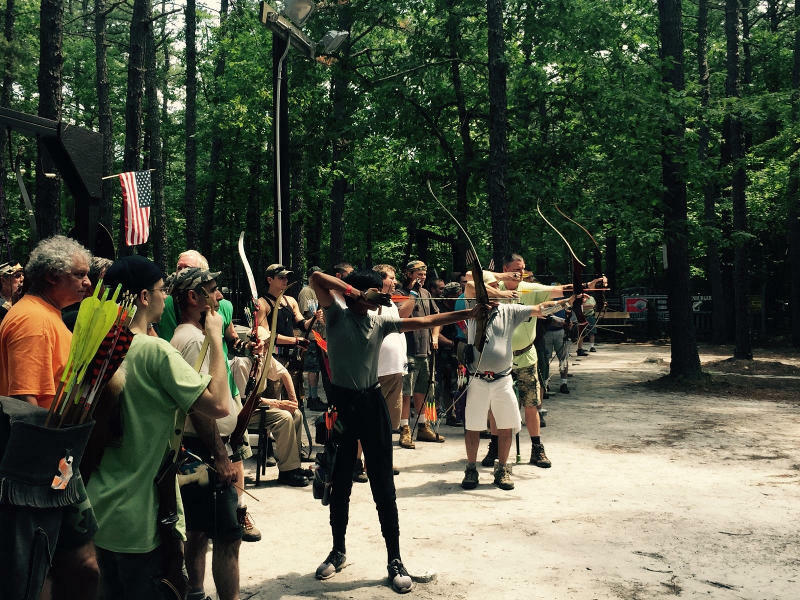 The archery gods must like TANJ & BKB. 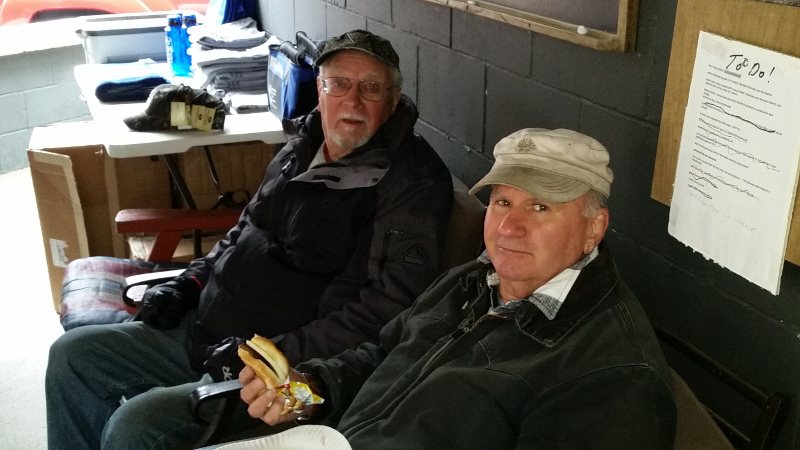 Mike Luster our chief cook and bottle washer took a triple header on the ice and dislocated his right shoulder on Saturday. Mike went in for surgery today (Tuesday). 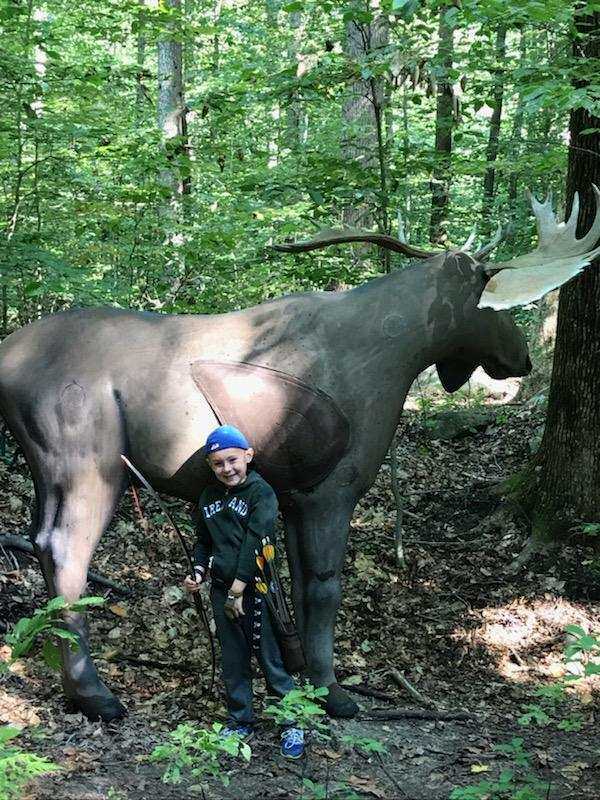 His Grandson Nick said he might need a rod and some screws to put him back together. 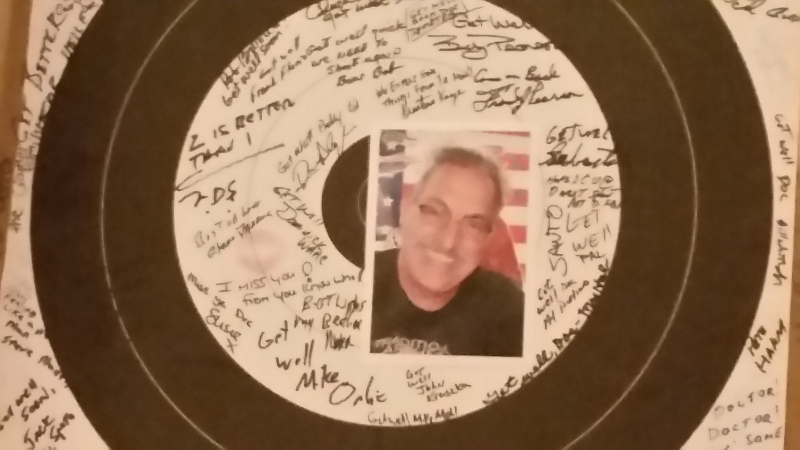 Mike if you are reading this we wish you a speedy recovery. 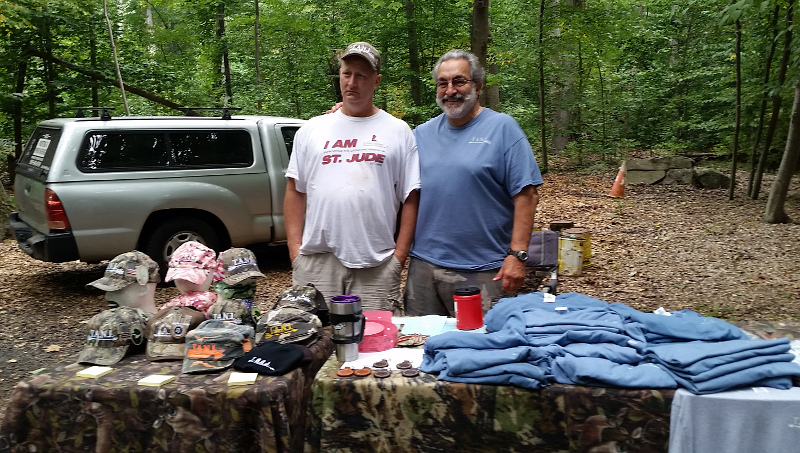 Doc wanted to say Thanks to Mark Dreyfus and Scout Troop 34 from Jackson for their help on Saturday! 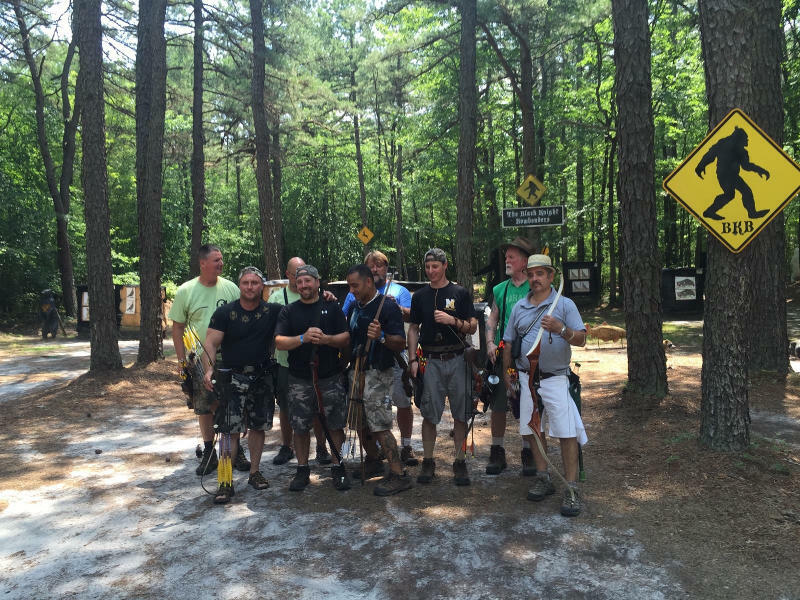 THANKS TO EVERYBODY FOR RUNNING A GREAT CABIN FEVER 2015! 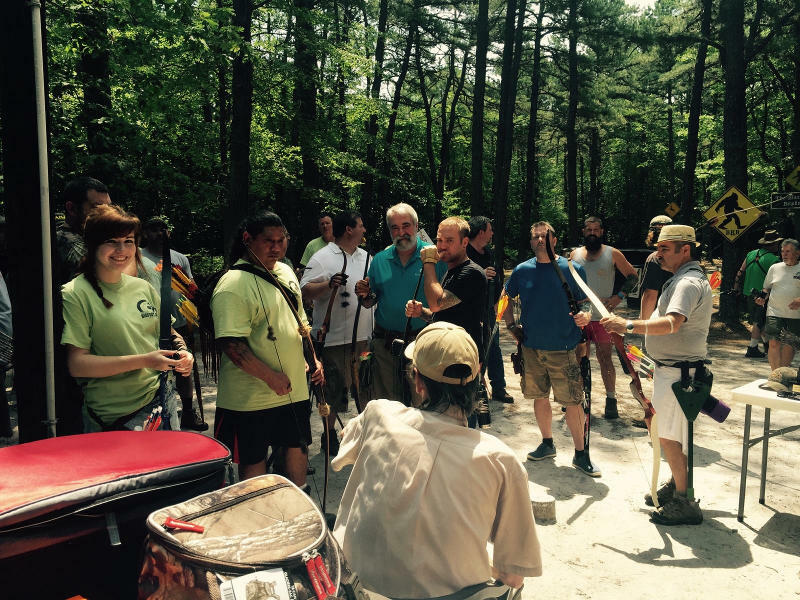 Mandy Bonilla, a student of Unity College, Maine sent a few pictures earlier this year. 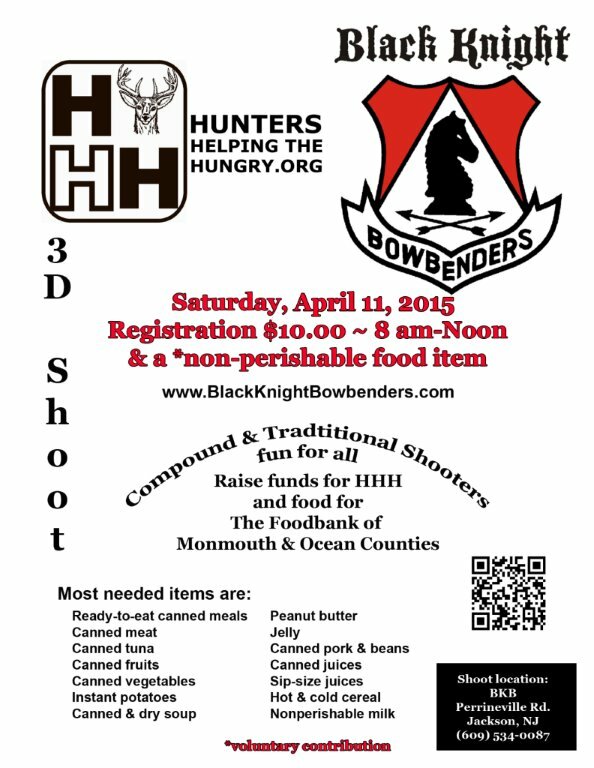 Mandy was a former student from the Ocean County 4-H club that practiced at Black Knight Bowbenders (Jackson) in the past. She now attends Unity College that provides dedicated, engaged students with a liberal arts education that emphasizes the environment and the natural resources. 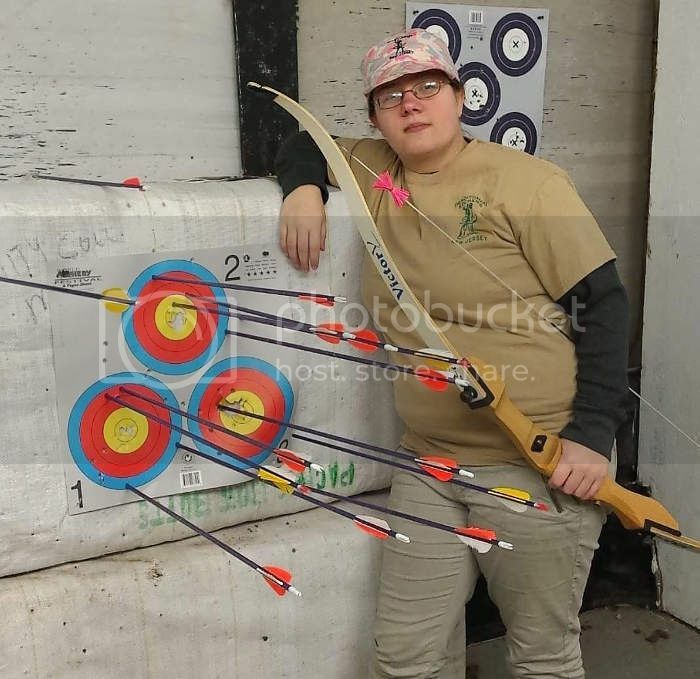 A few years ago TANJ voted at our 2012 Annual members meeting at Whittingham to sponsor her with equipment, since she wanted to continue her love of archery when she entered college and they did not have any traditional equipment available. 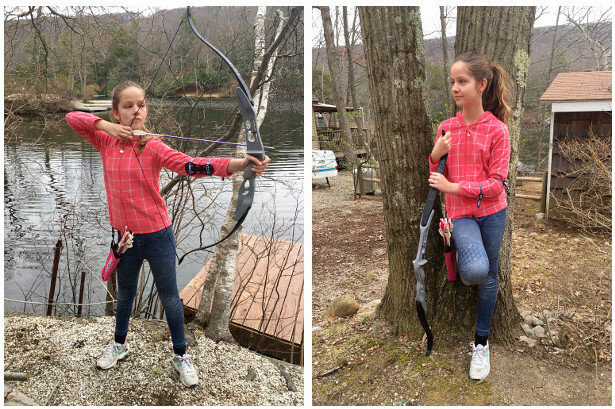 Since then she and her room mate formed a traditional archery team that continues to practice at their indoor & outdoor ranges whenever she has time from her classes. 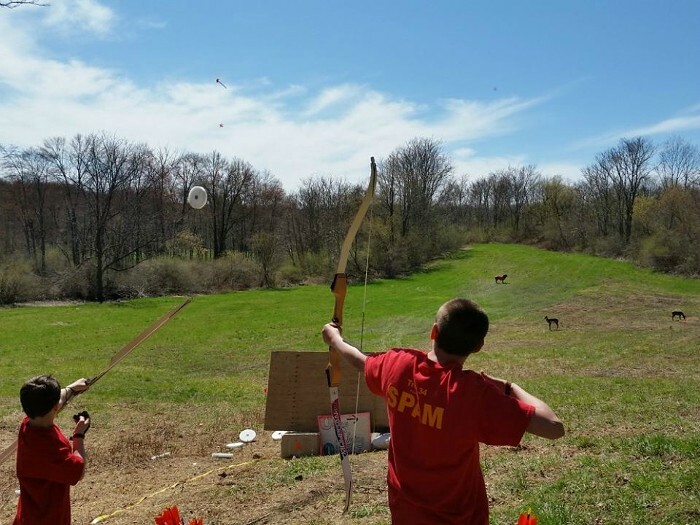 "Our Youth - they are our Future"
At the notification and request of student Emma Bovair for assistance in setting up an NASP program, TANJ donated funds to the Sussex County Charter Technical School last month. Thank you for the head's up, Emma!